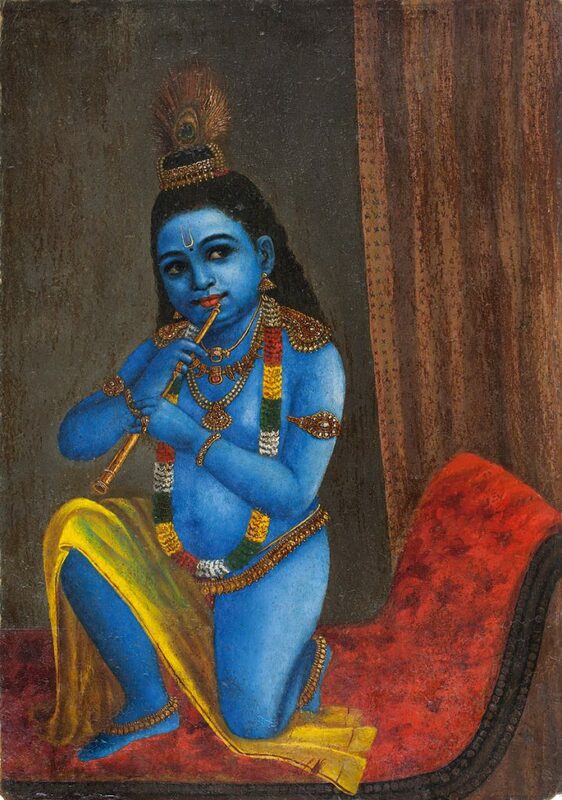 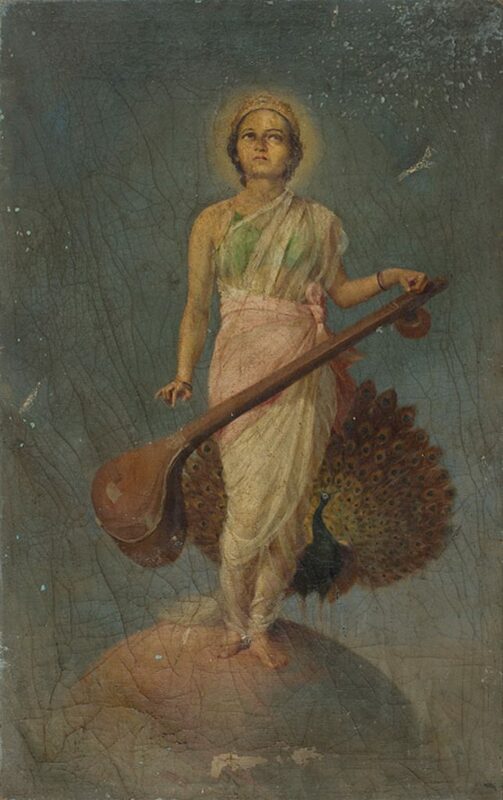 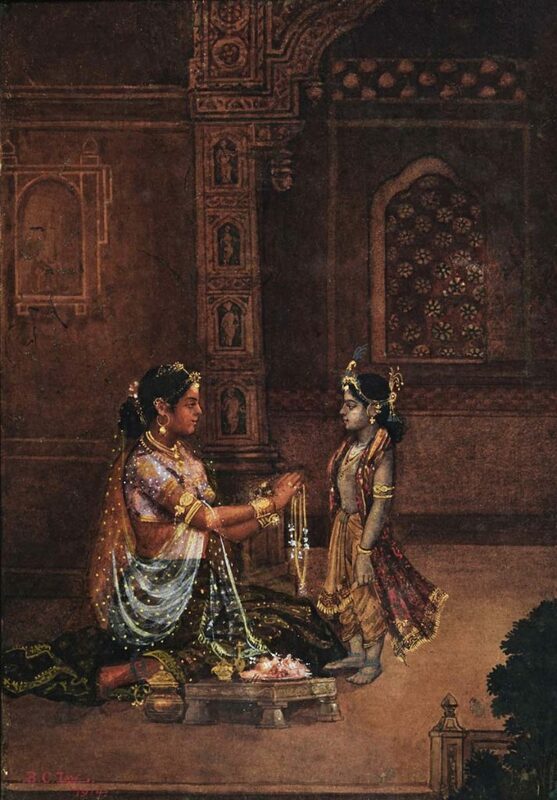 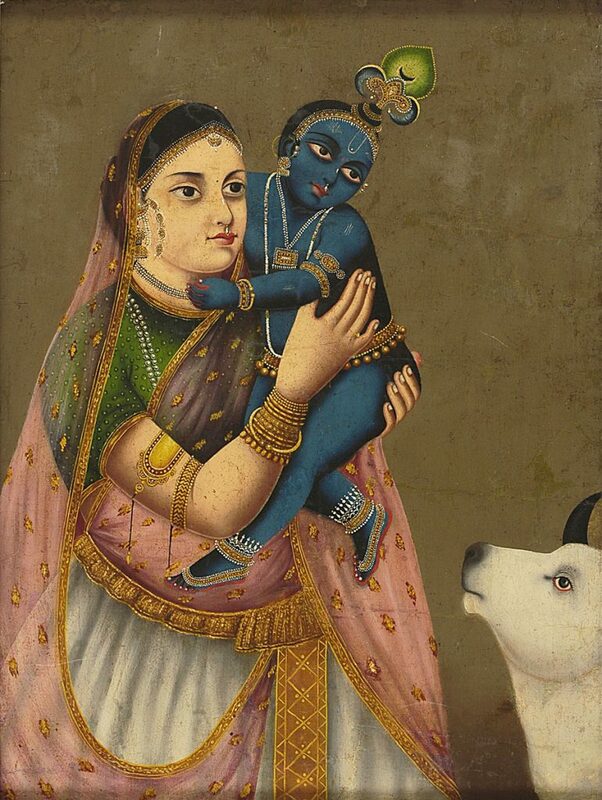 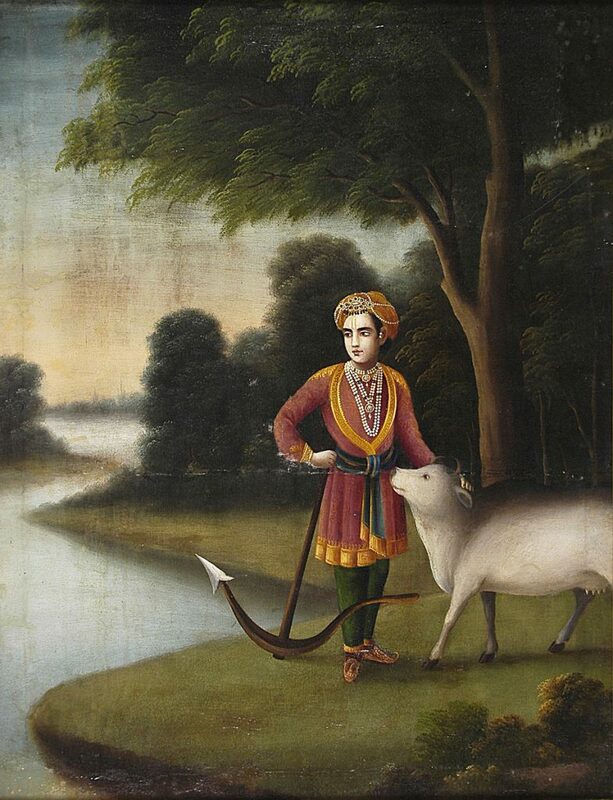 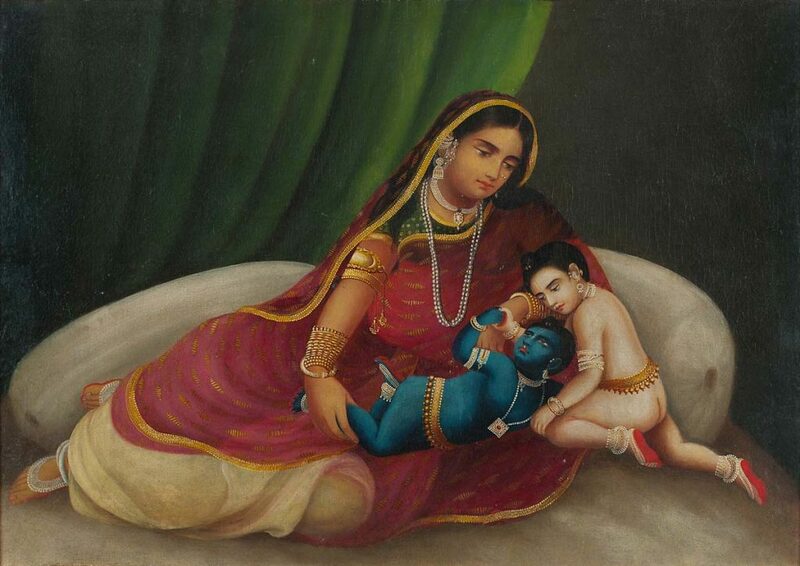 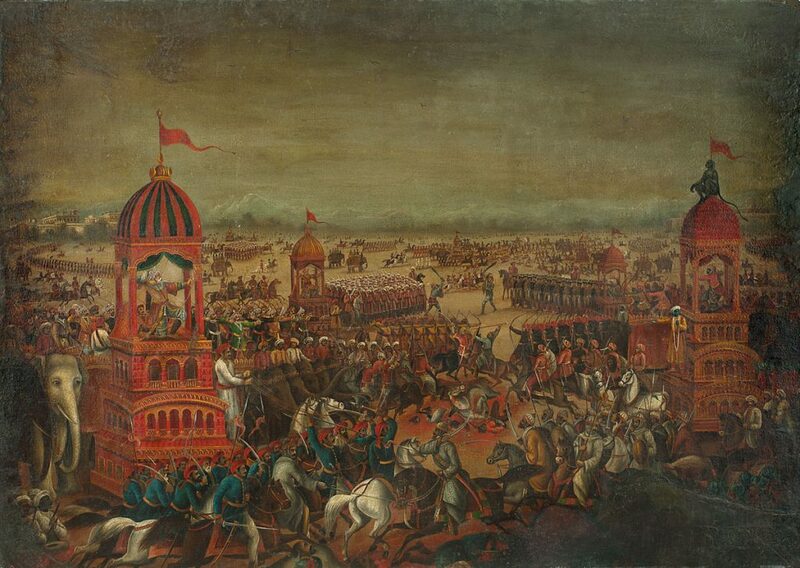 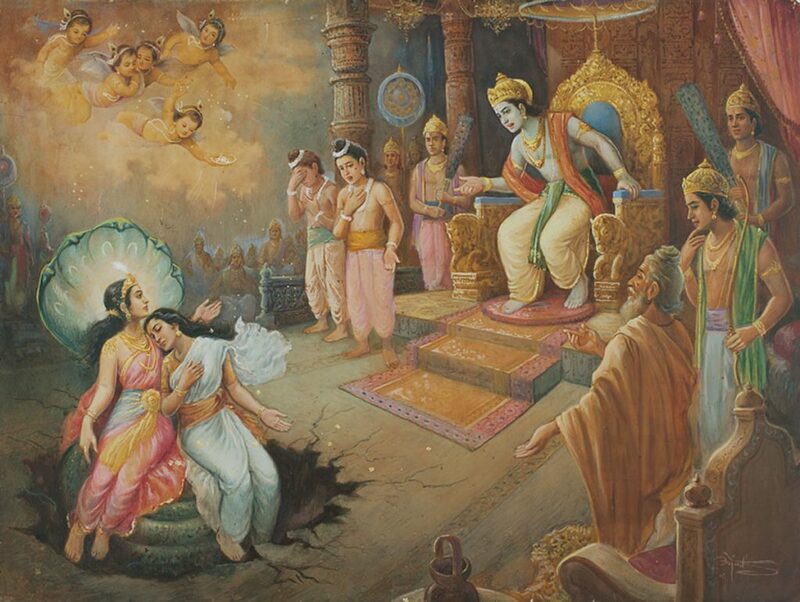 The exhibition begins with late 19th century art on mythological and religious themes from regions as diverse as Bombay and Bengal – these includes oil paintings in the Western style of deities by such well-known artists of the academic realist styles as Raja Ravi Varma and M. V. Dhurandhar, and mythological/religious episodes and figures featured in the hybrid style, a mix of Western realistic painting and traditional Indian art and concerns – the Early Bengal, a very popular form, of which the exhibition presents over fifty works. 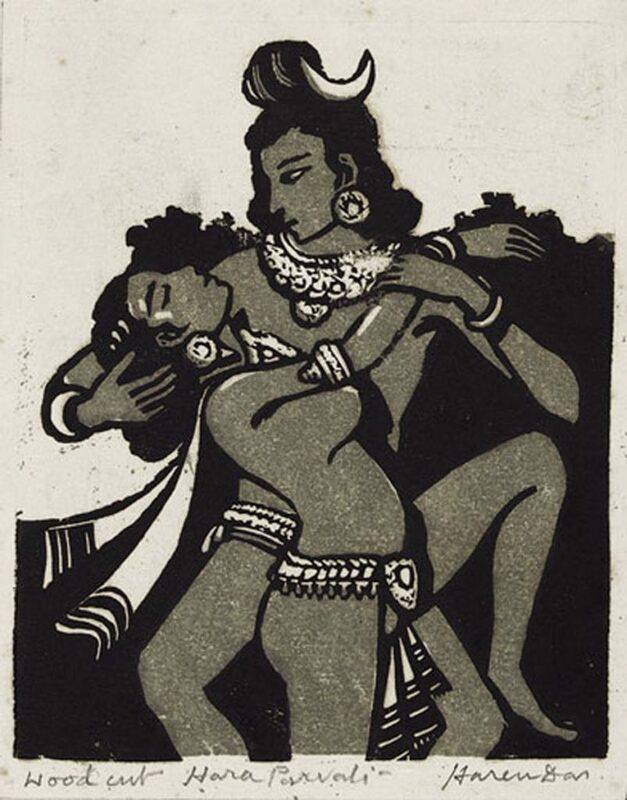 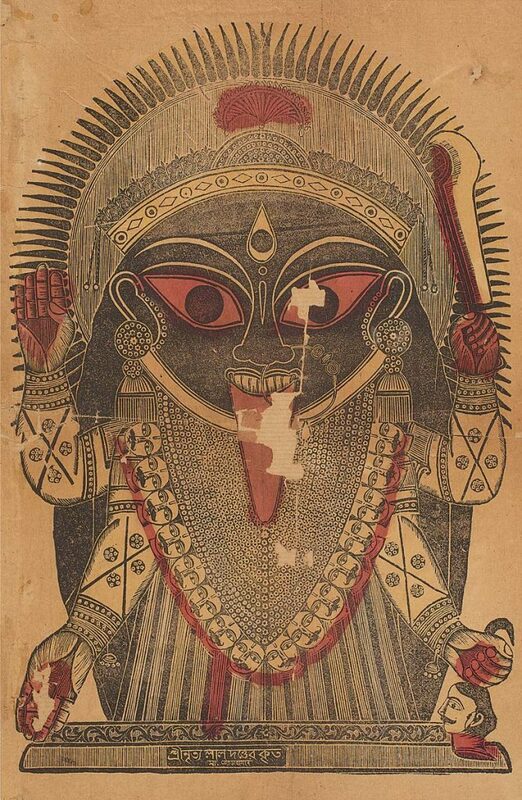 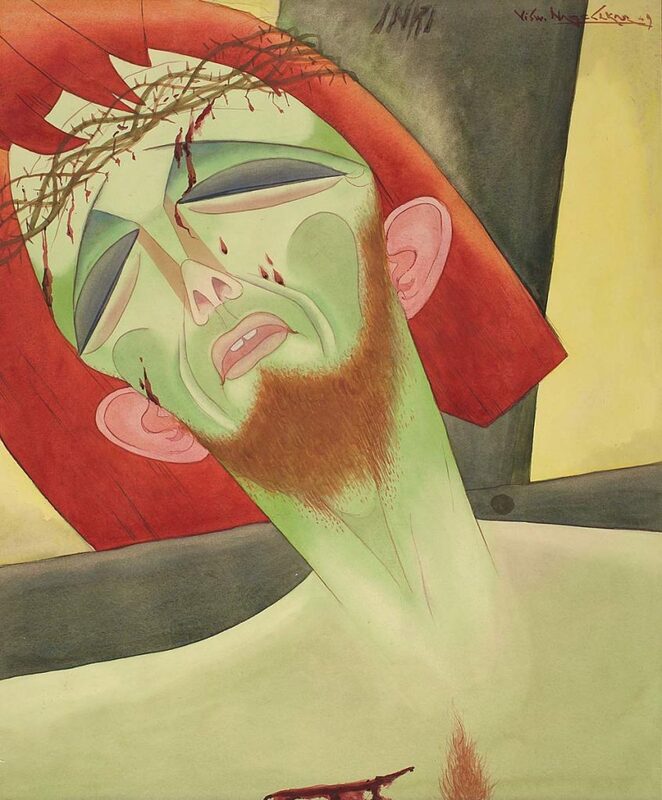 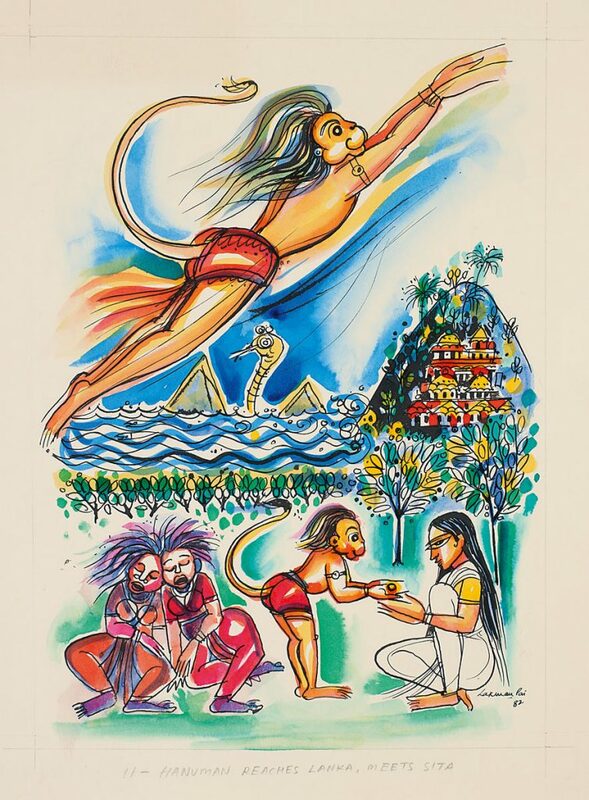 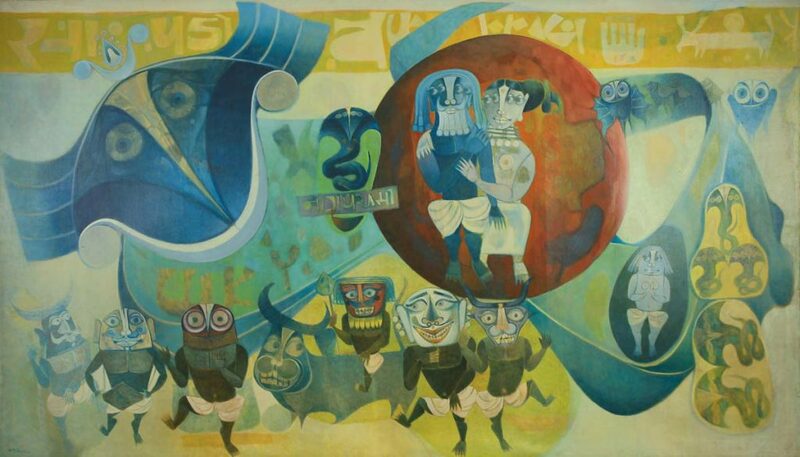 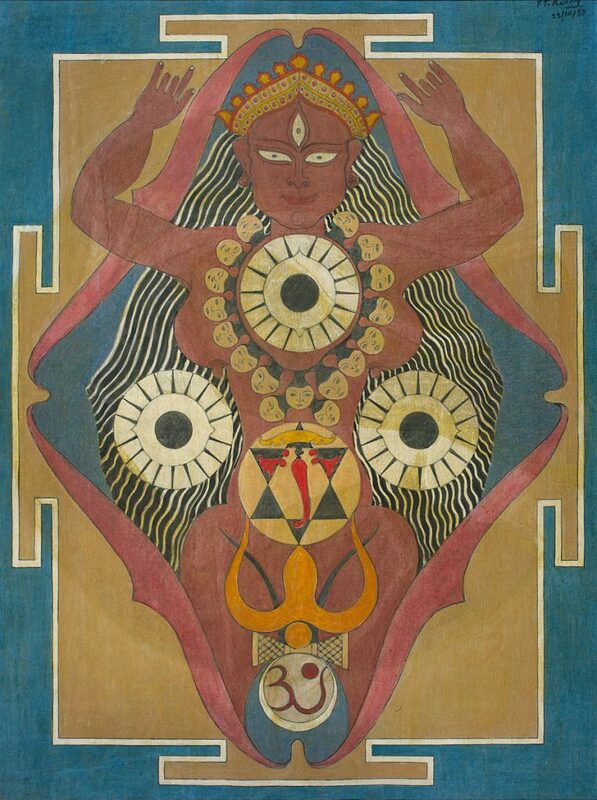 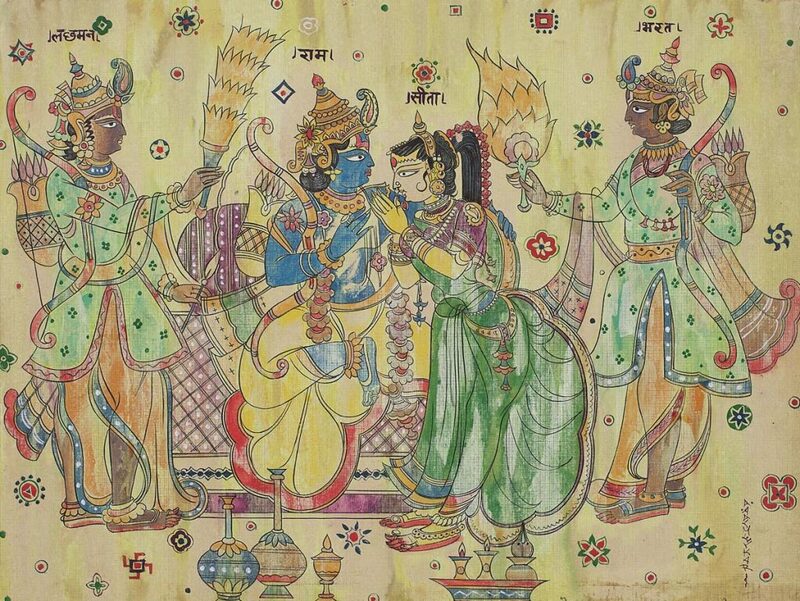 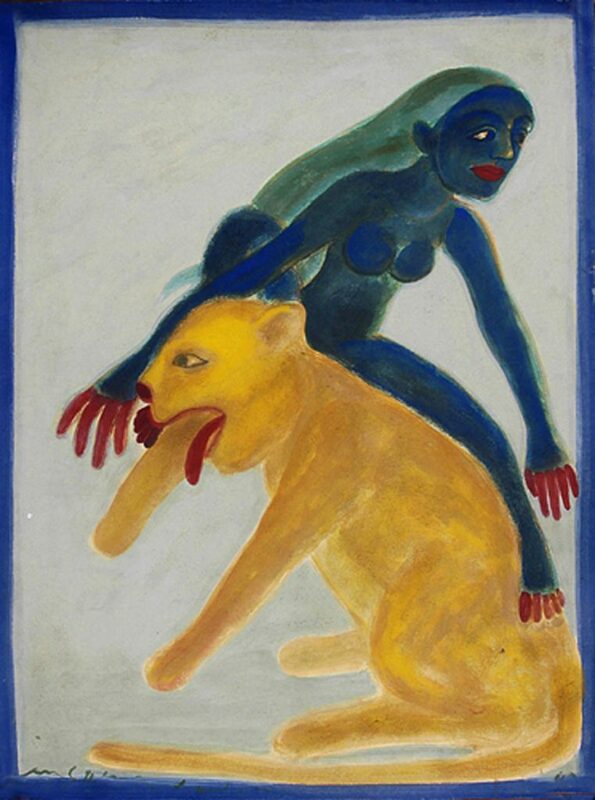 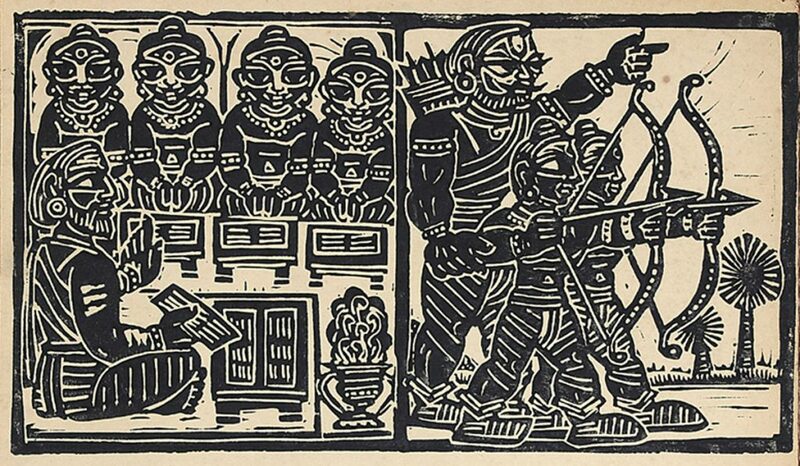 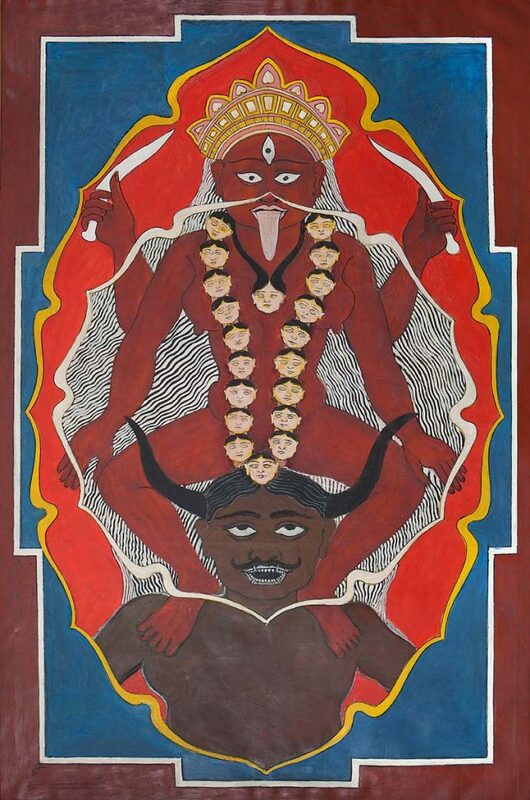 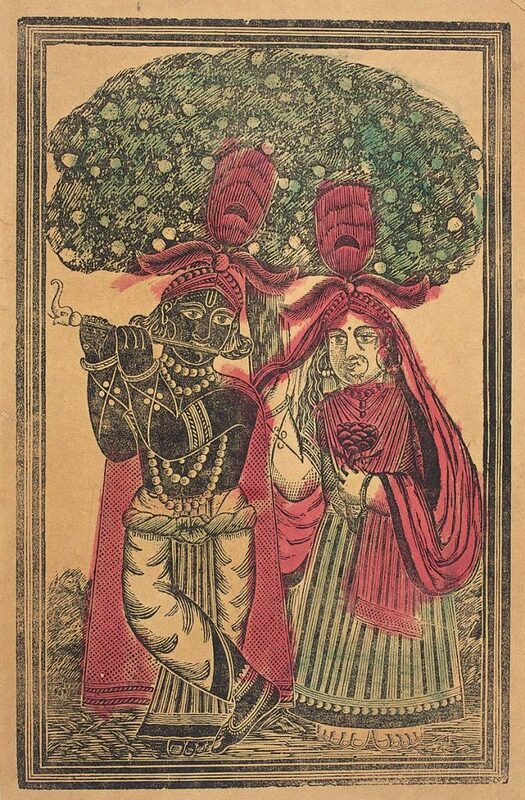 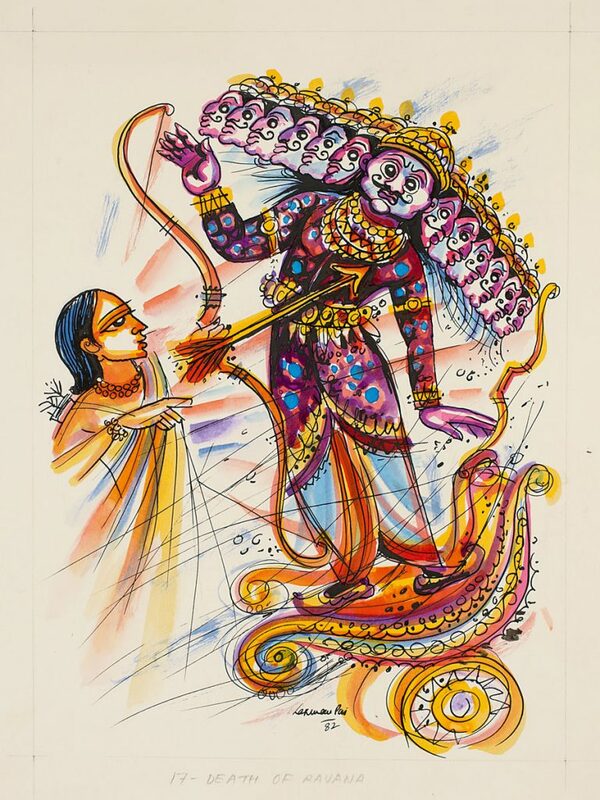 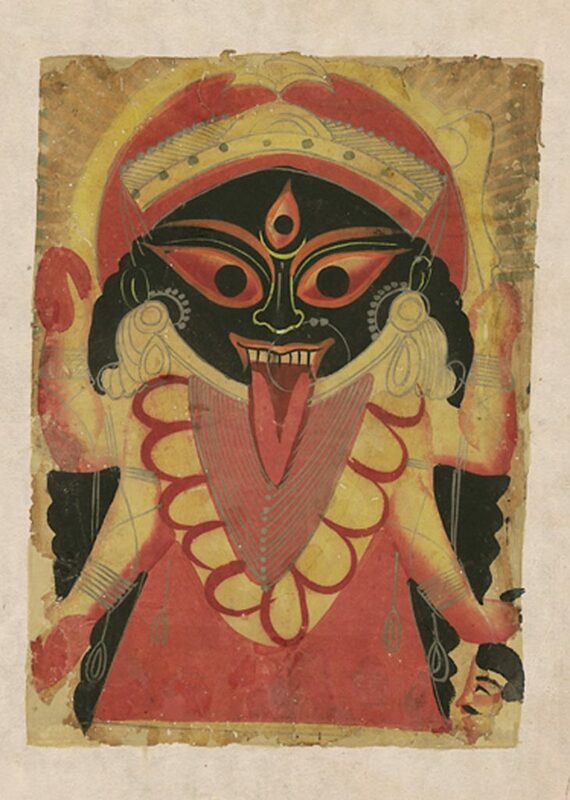 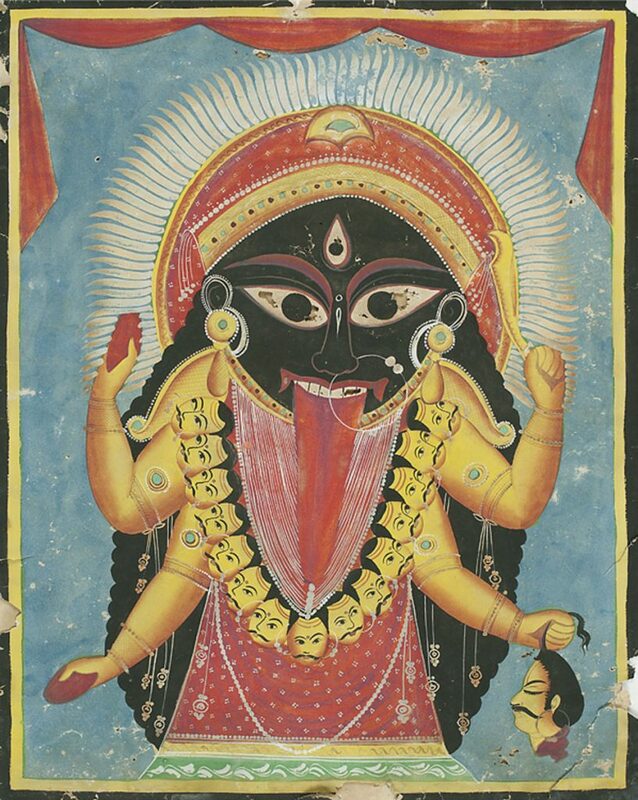 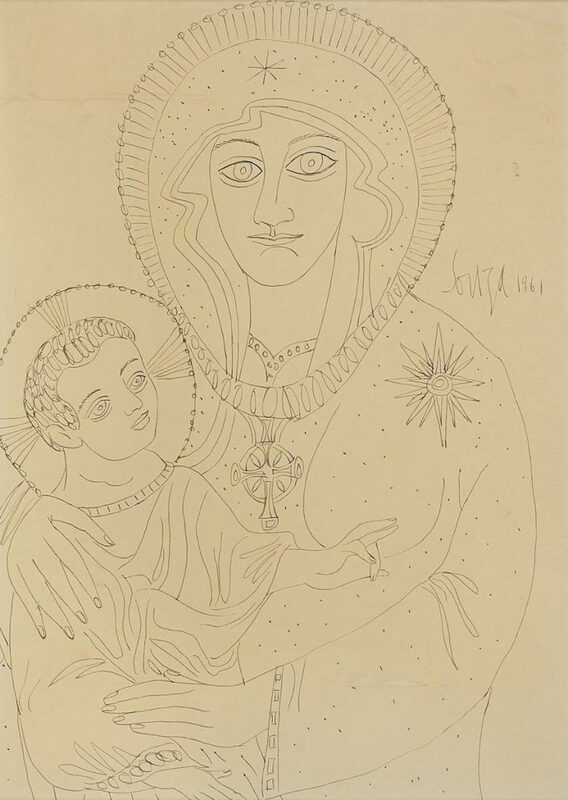 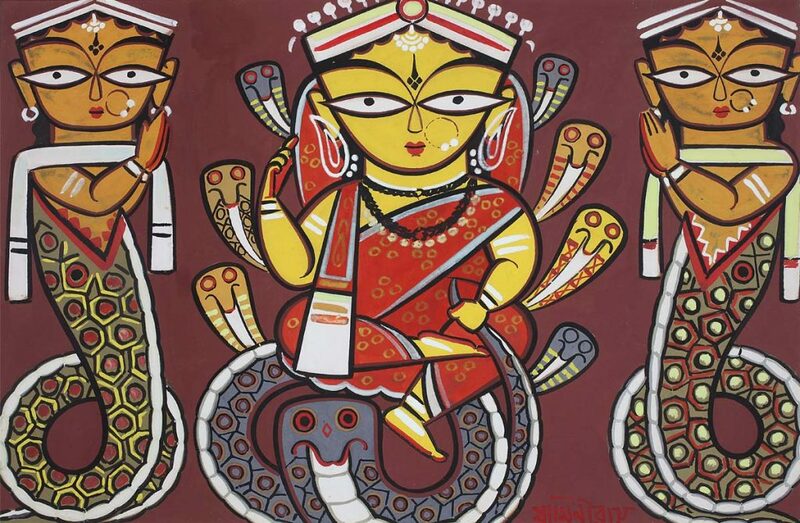 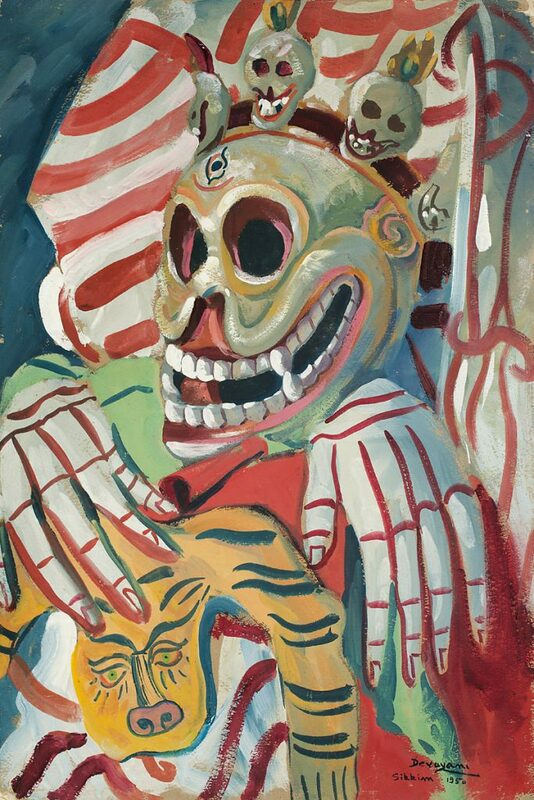 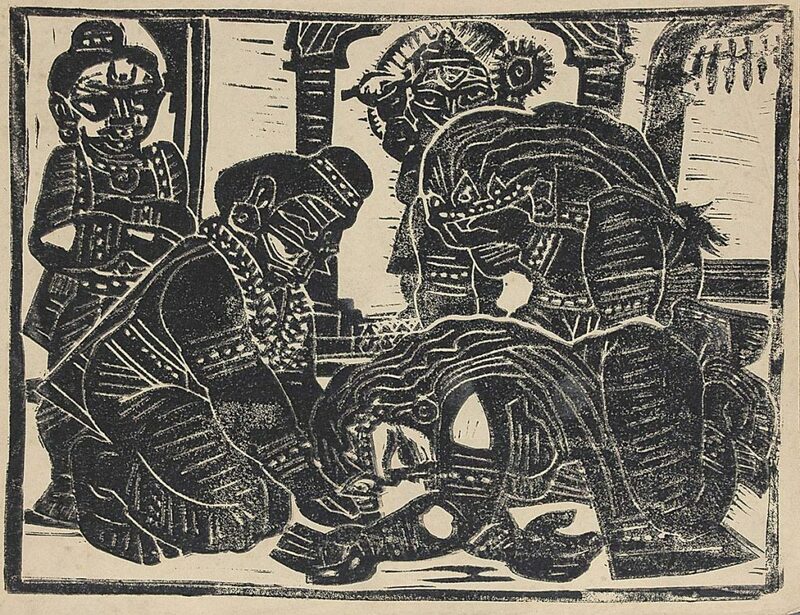 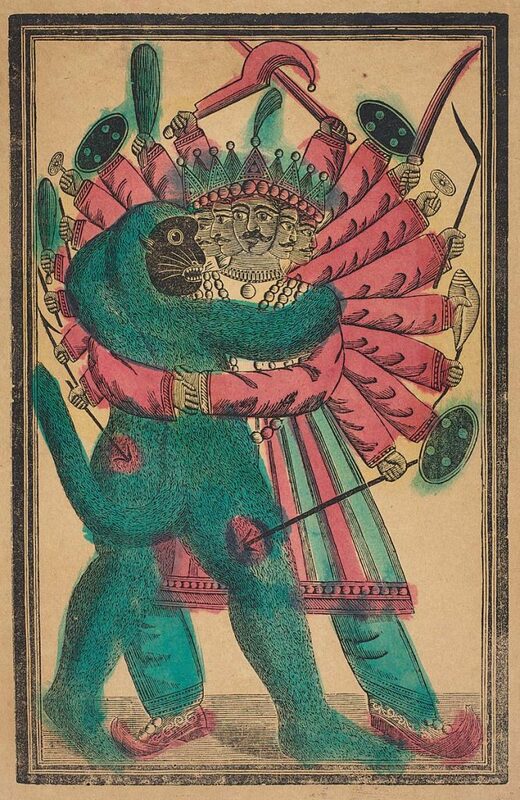 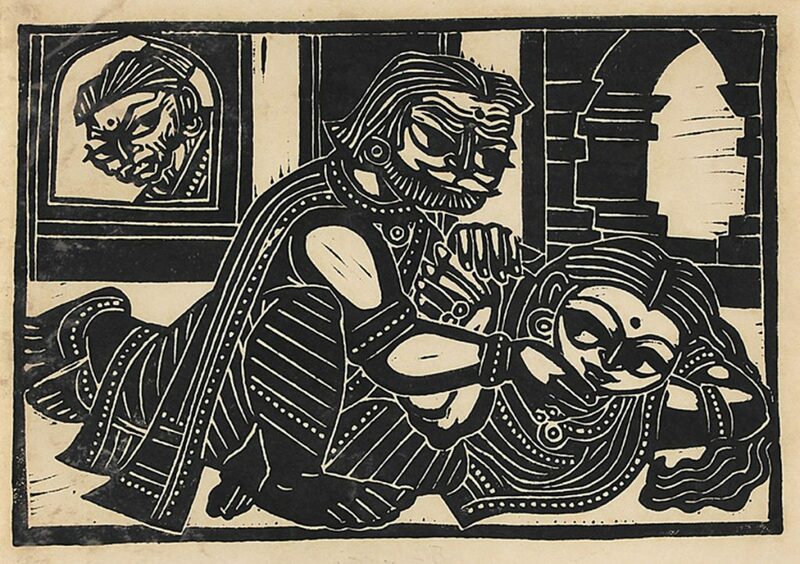 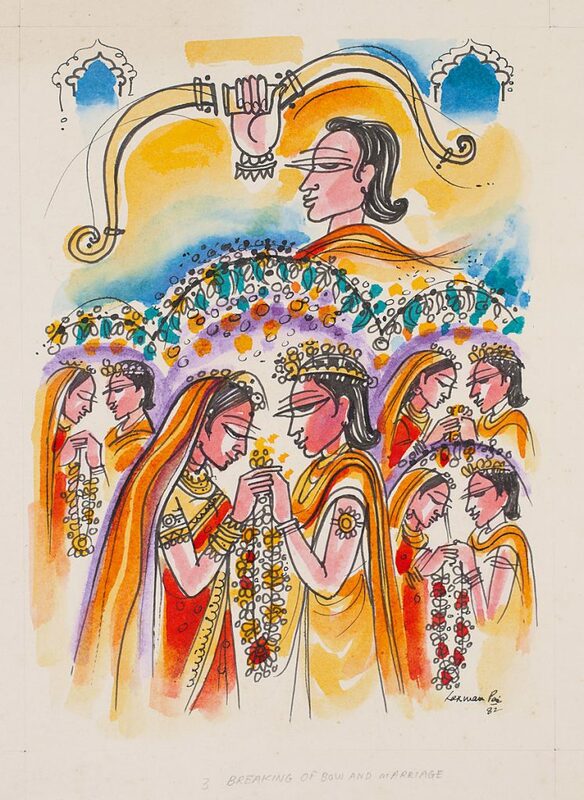 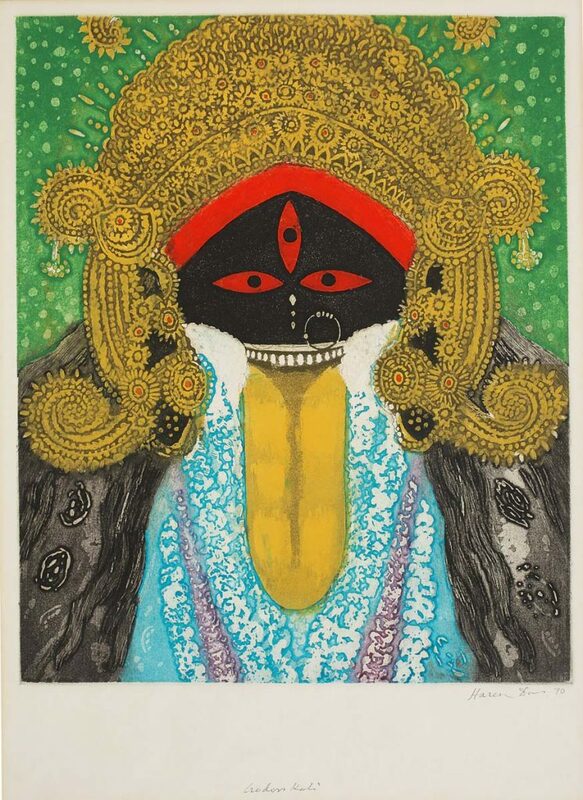 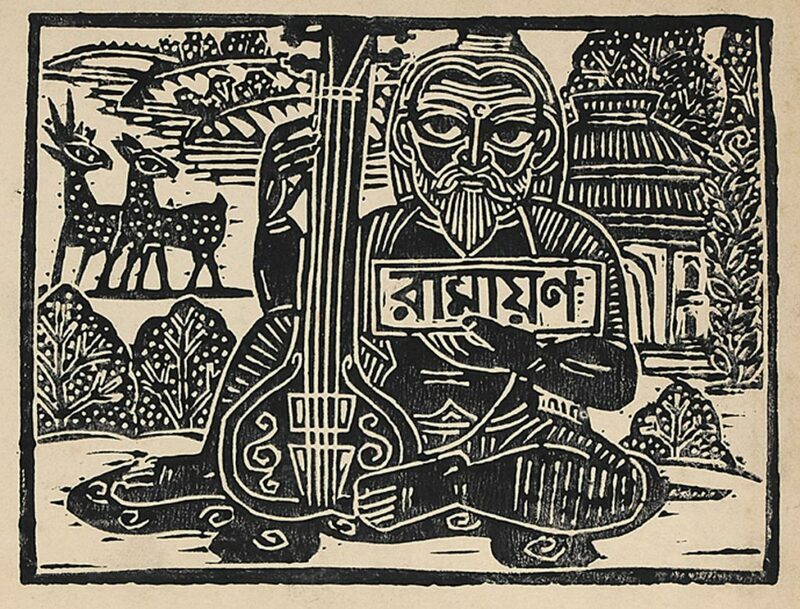 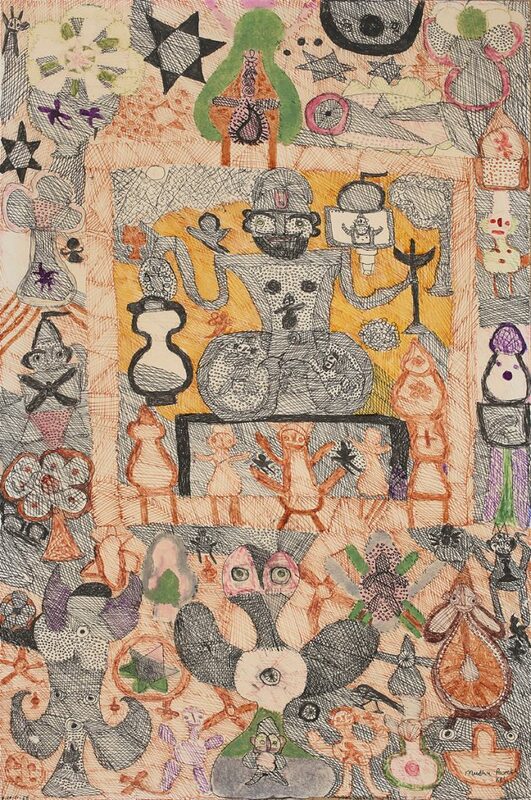 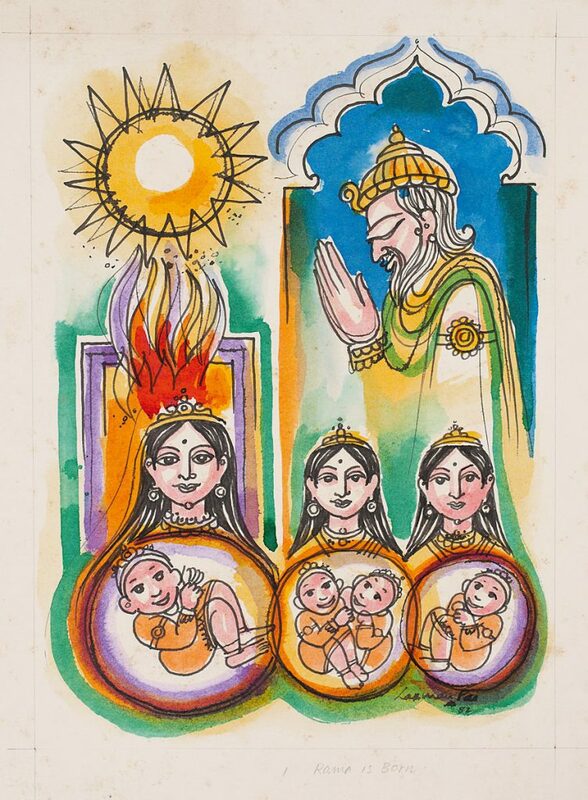 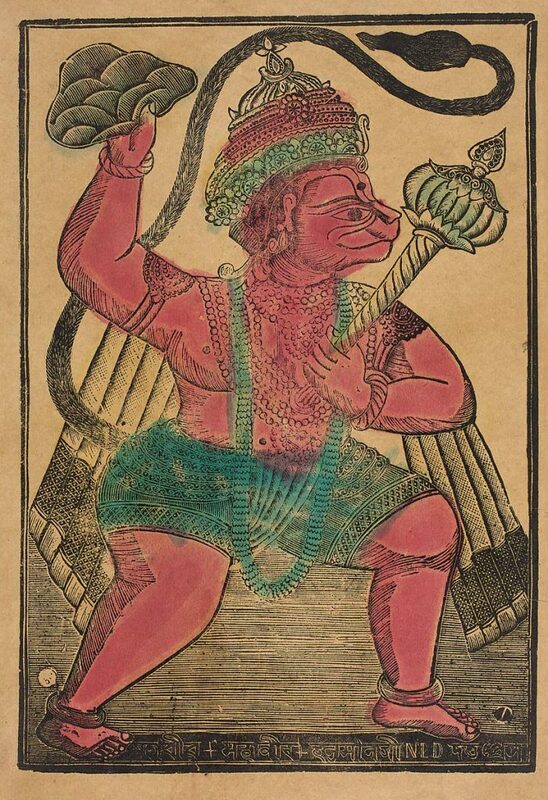 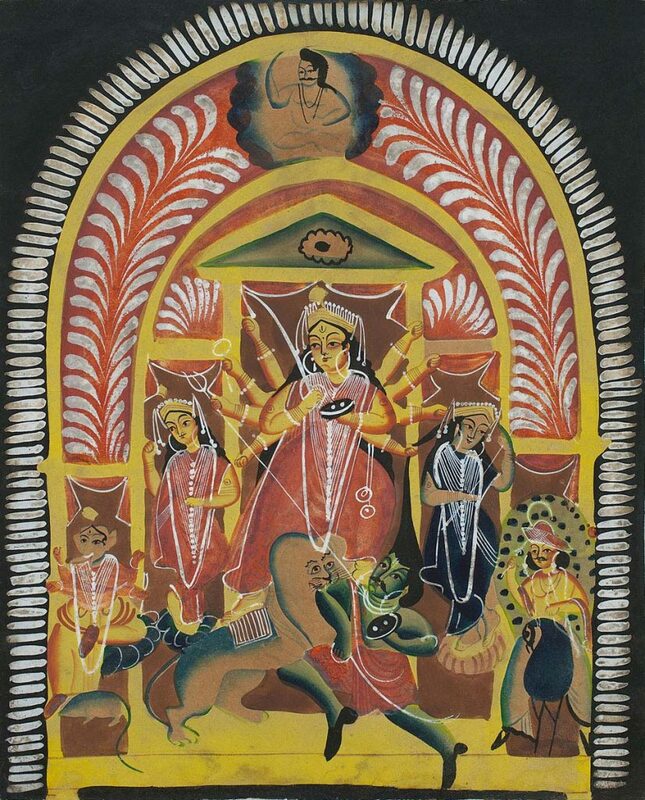 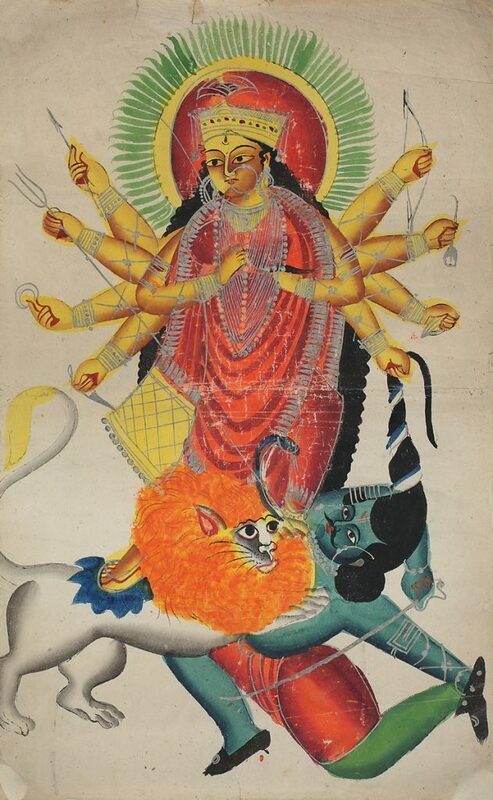 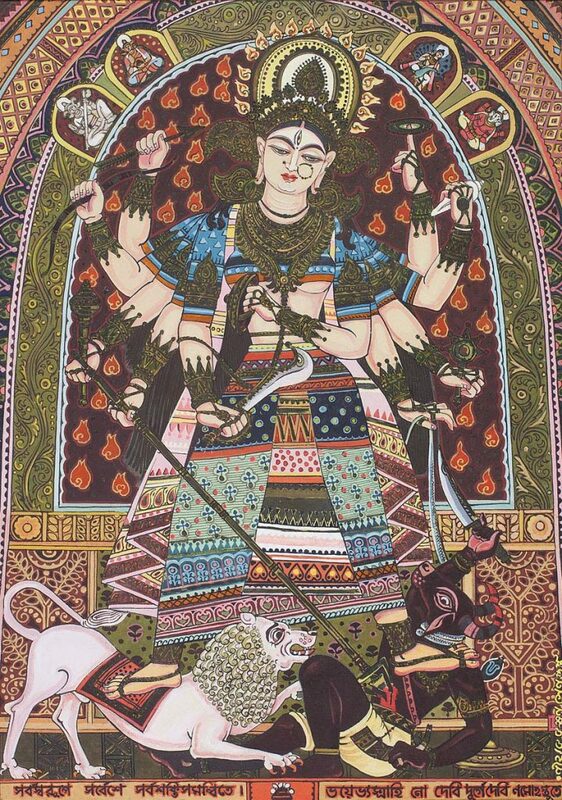 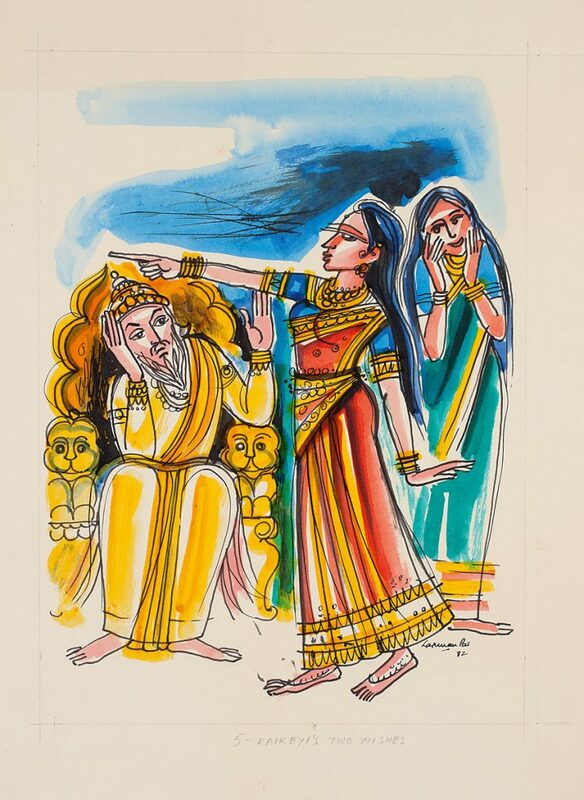 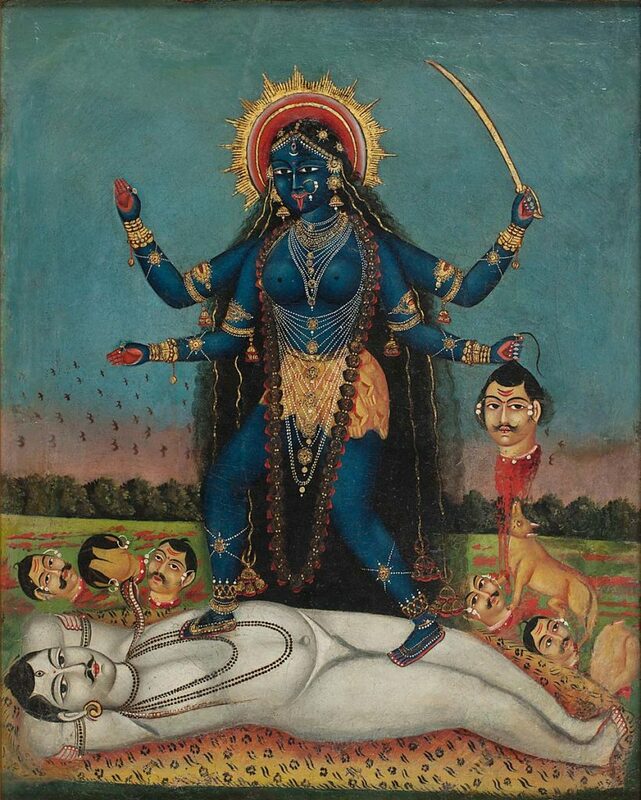 It goes on to document Kalighat paintings on the religious and mythological themes from the late 19th and early 20th centuries that were very popular, as well popular bazaar prints on these themes that flooded the markets with the advent of paper, lithography and mechanical printing. 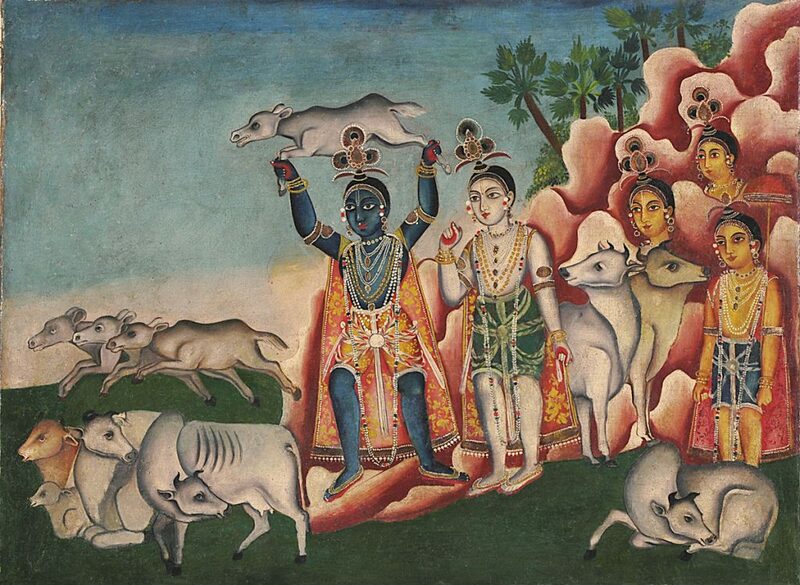 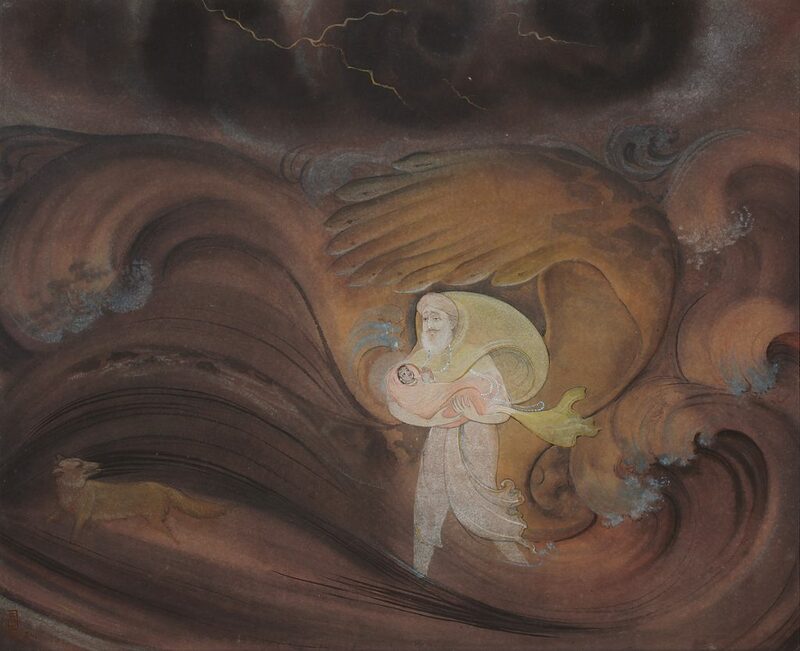 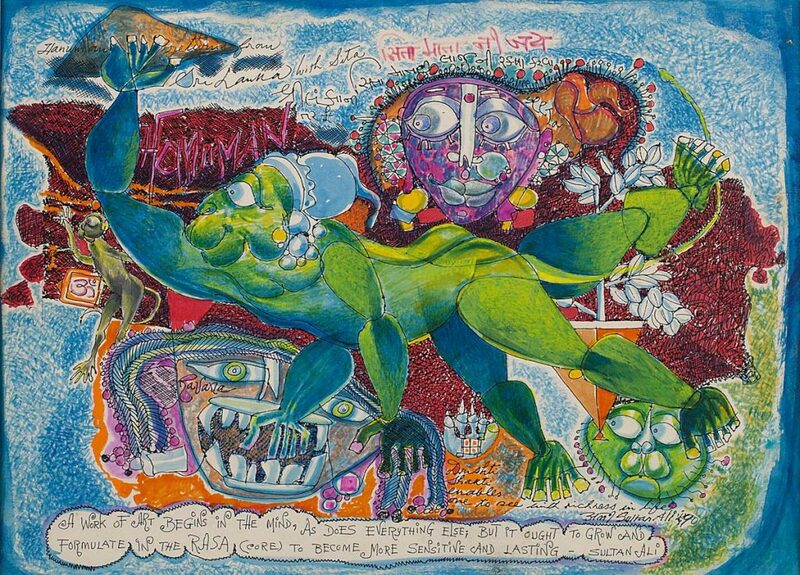 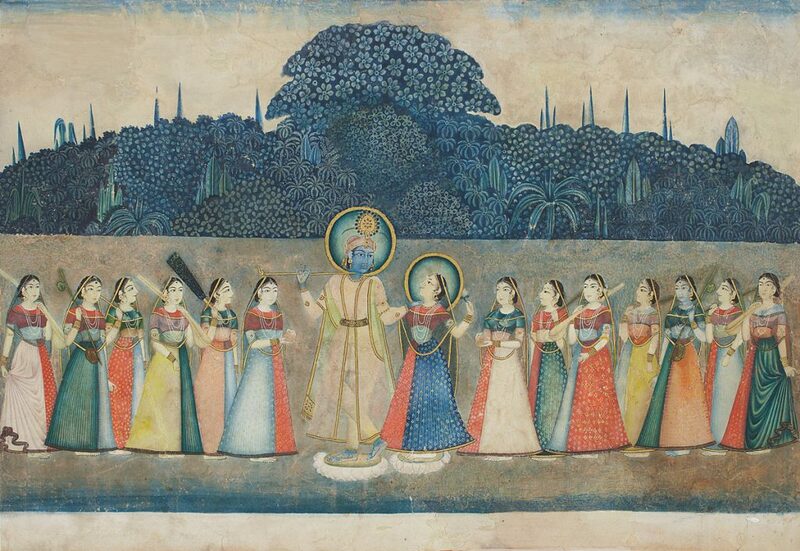 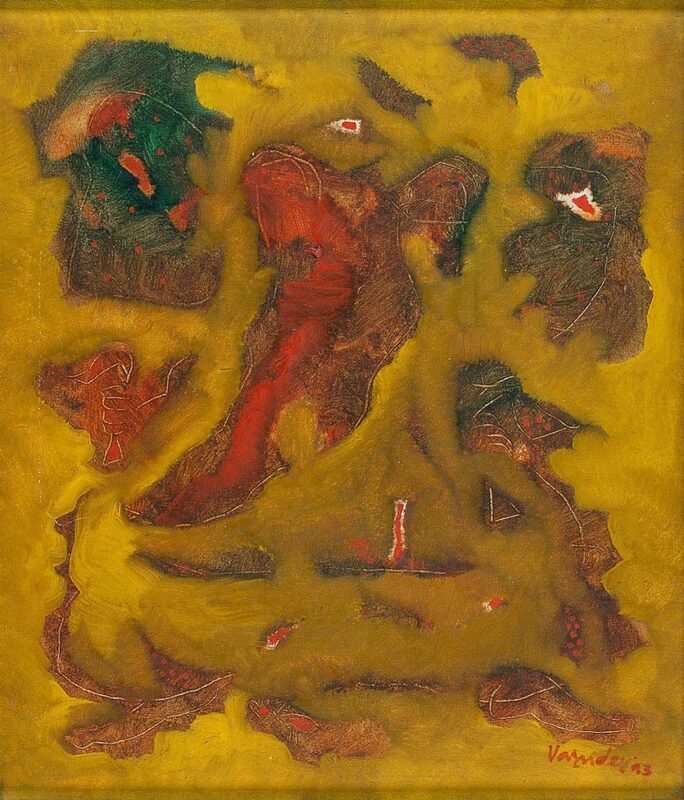 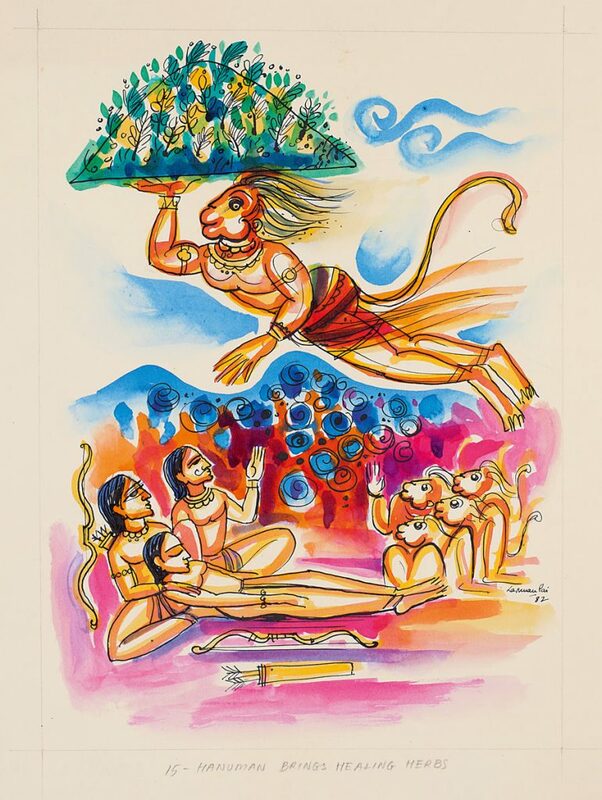 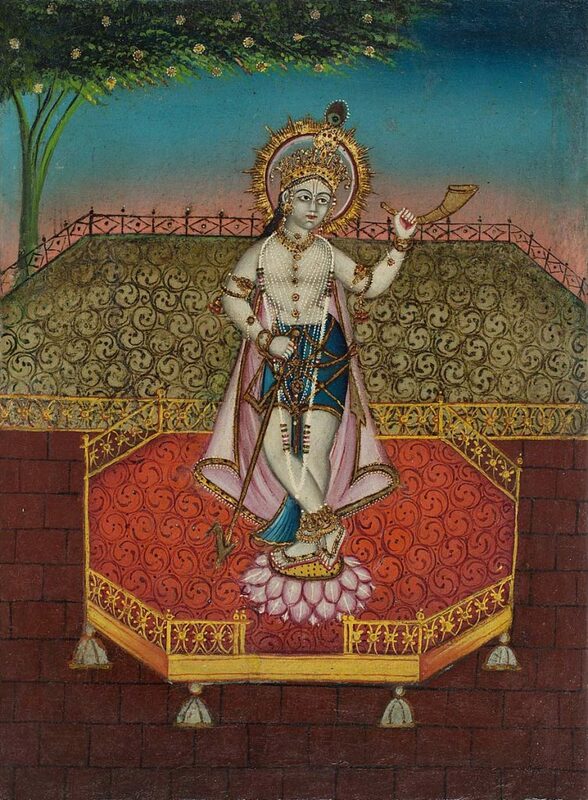 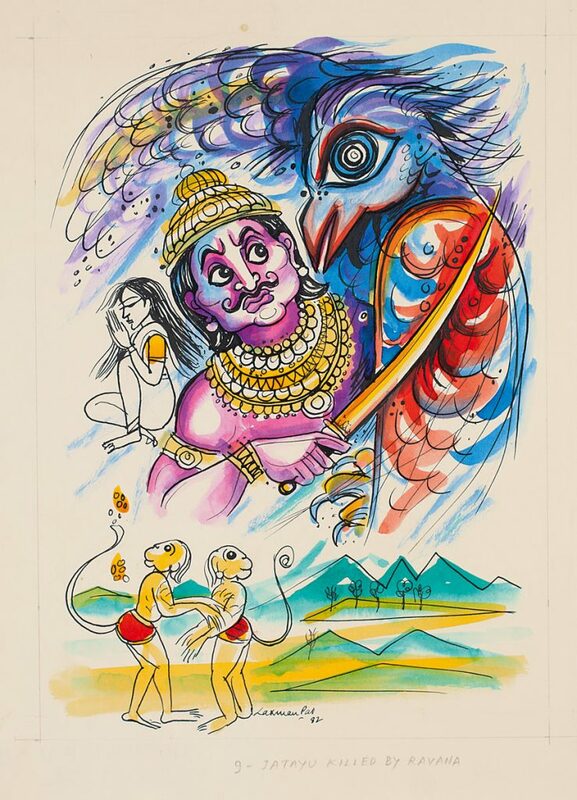 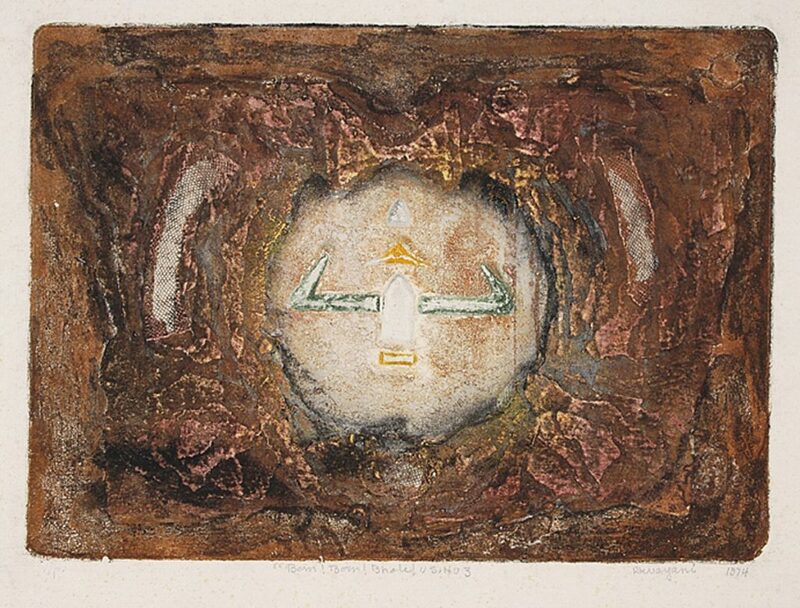 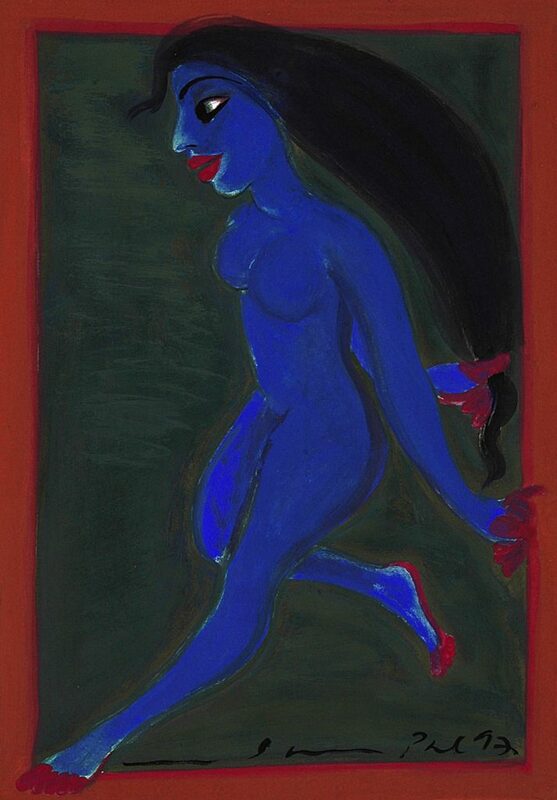 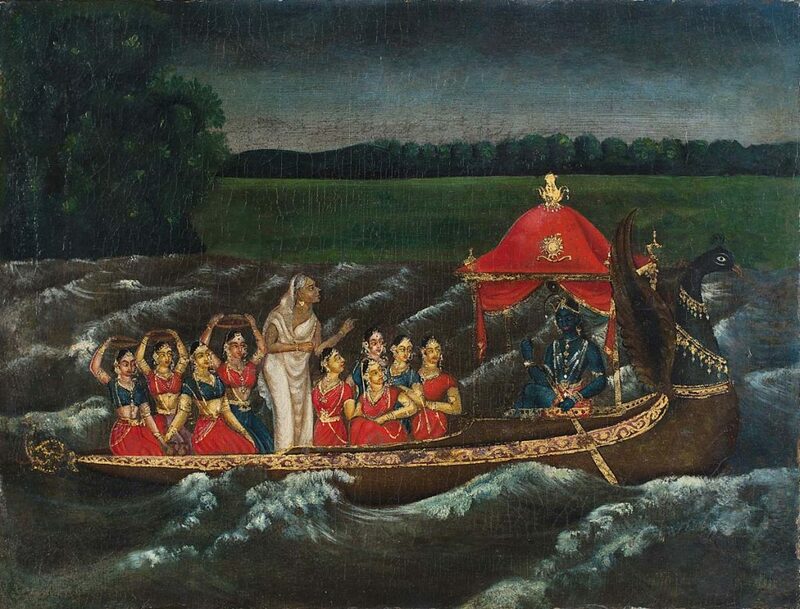 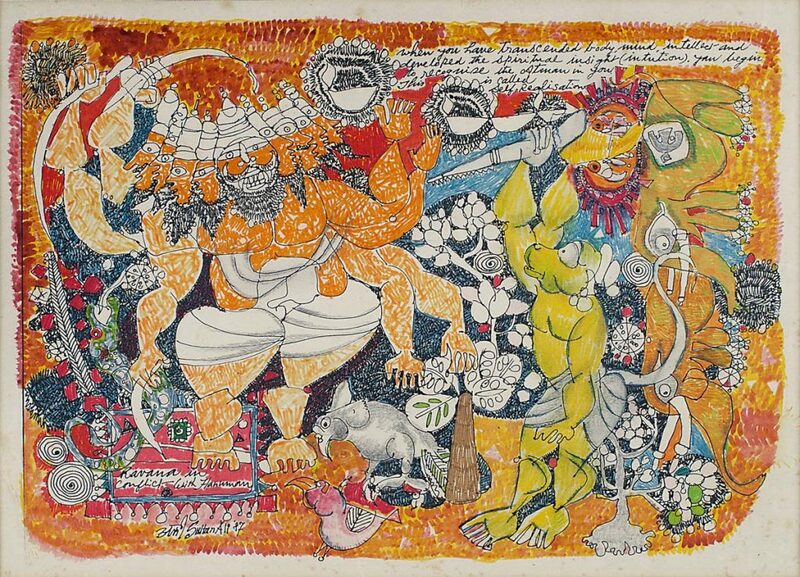 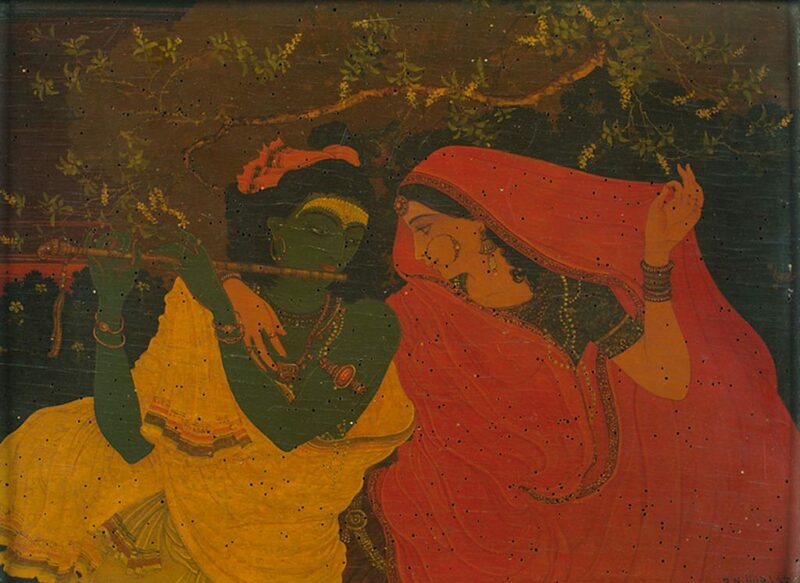 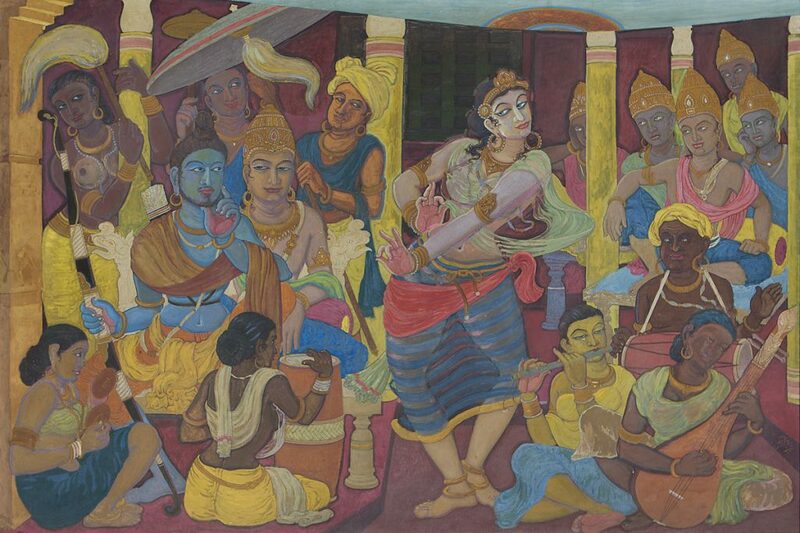 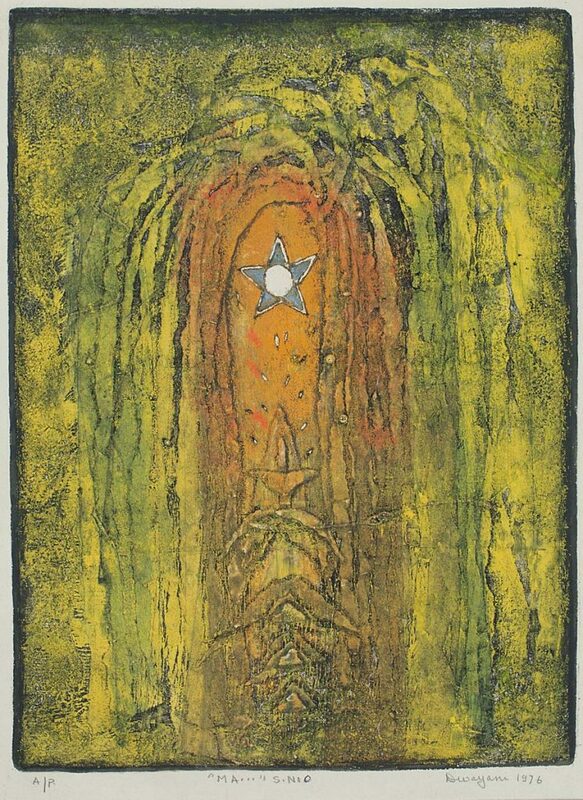 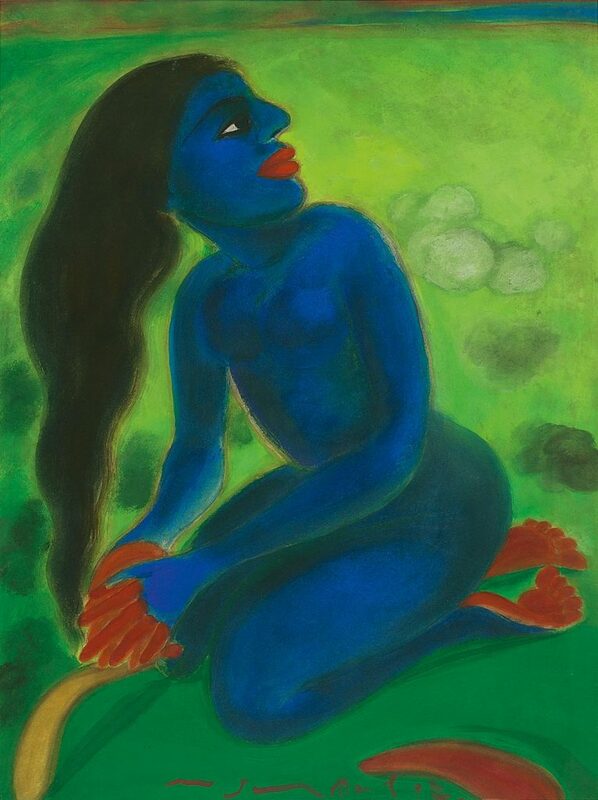 From here, the exhibition charts the sheer range and expanse of the religious and mythological theme in modern Indian art. 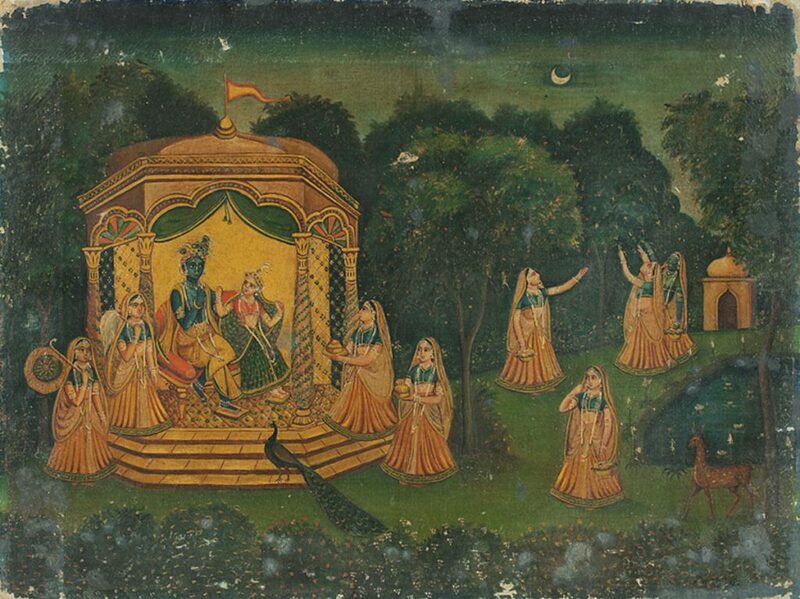 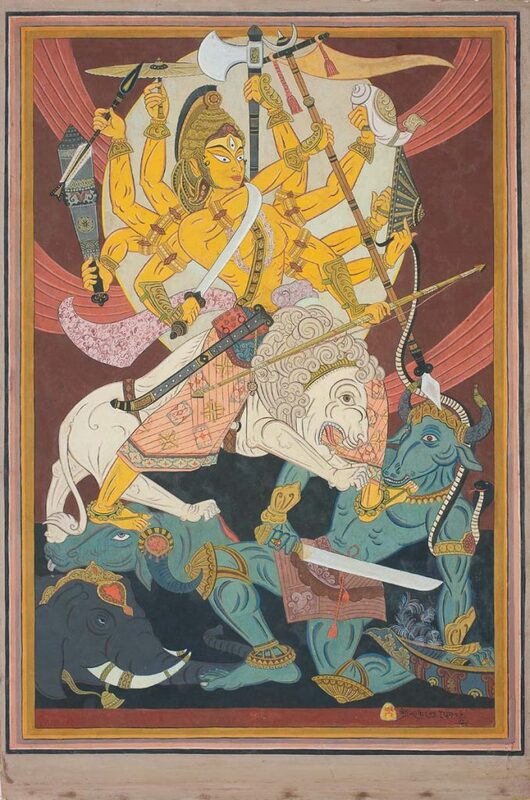 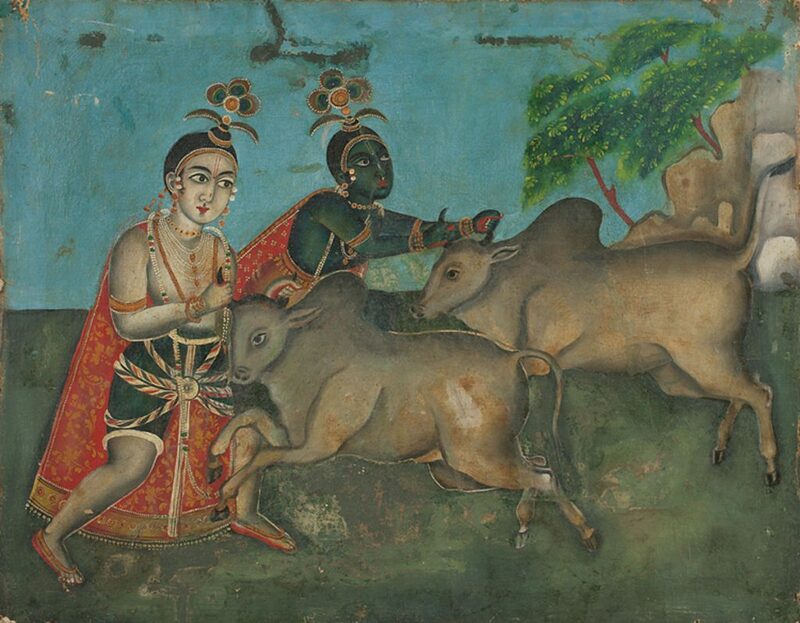 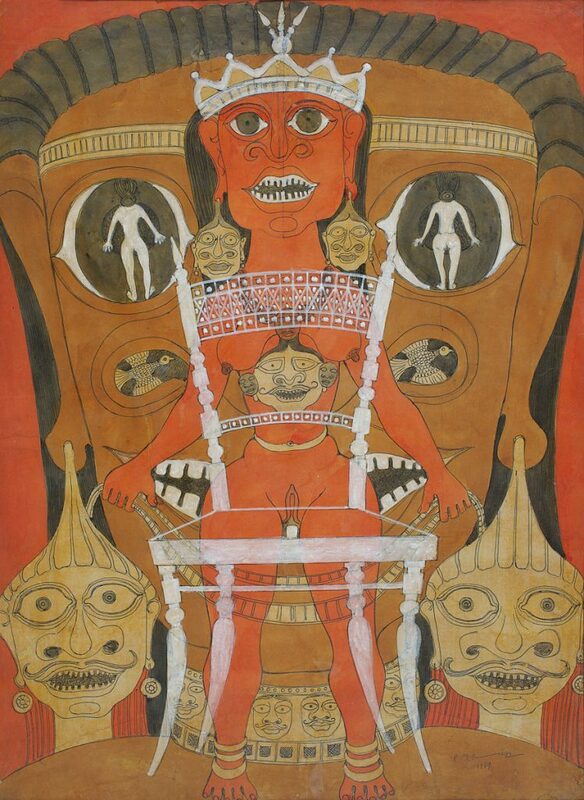 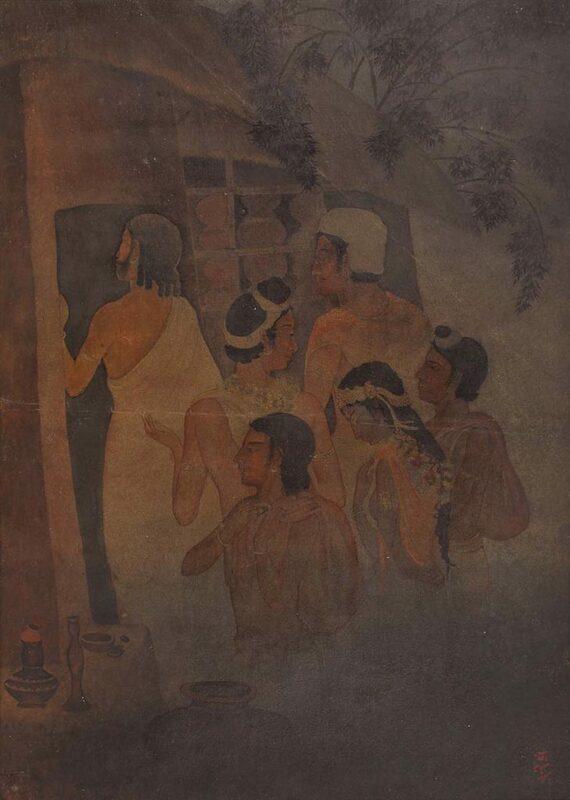 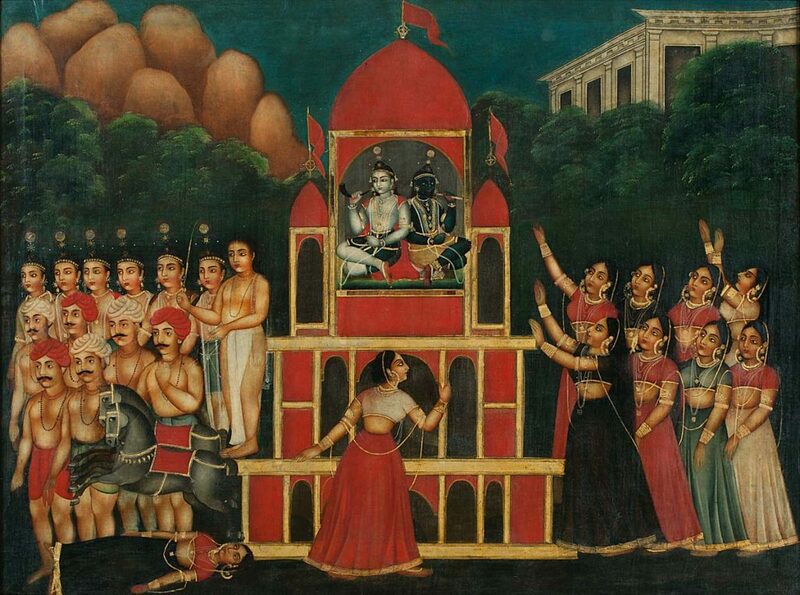 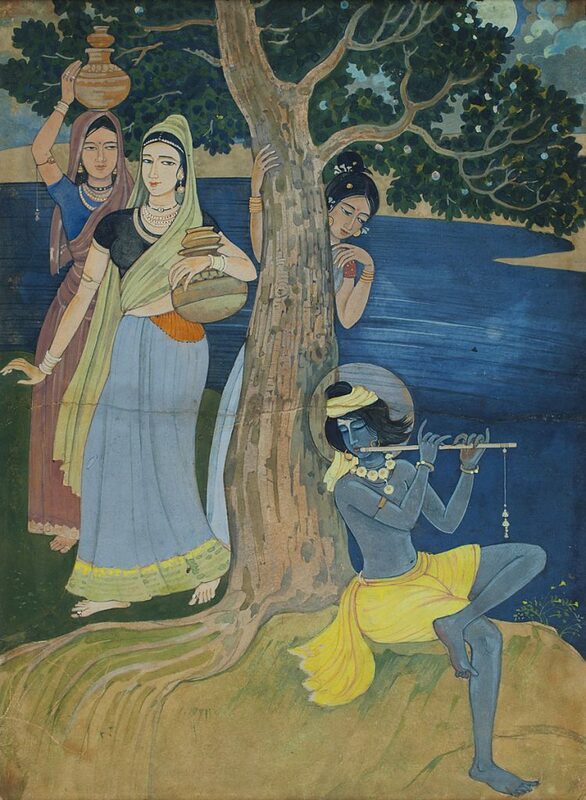 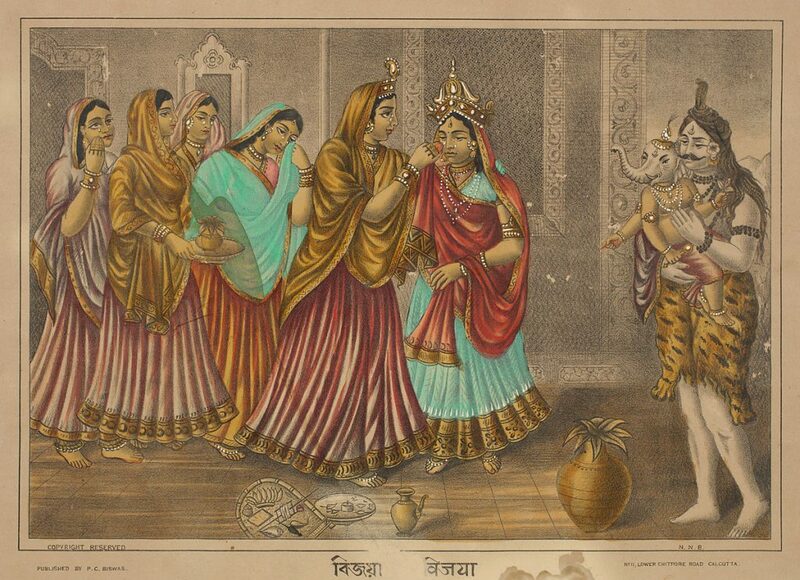 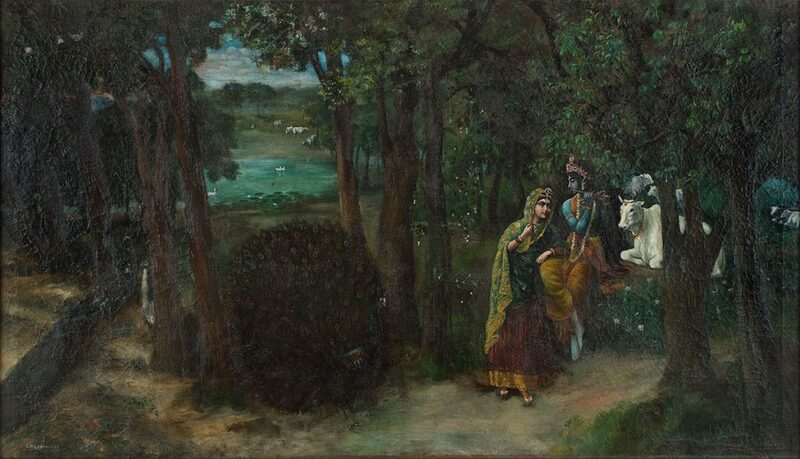 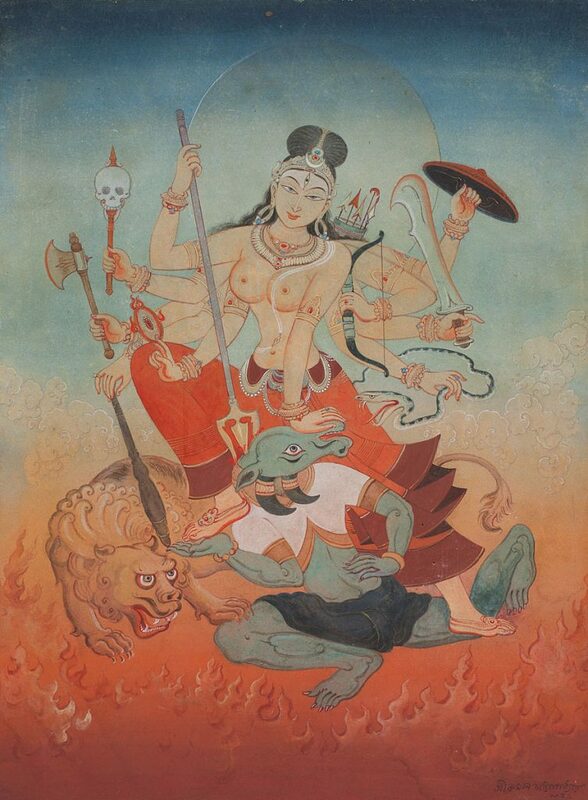 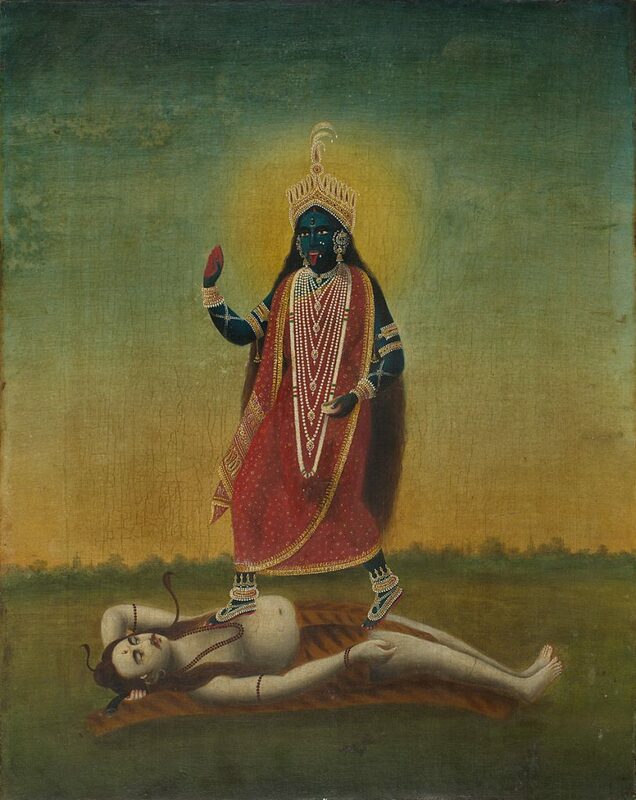 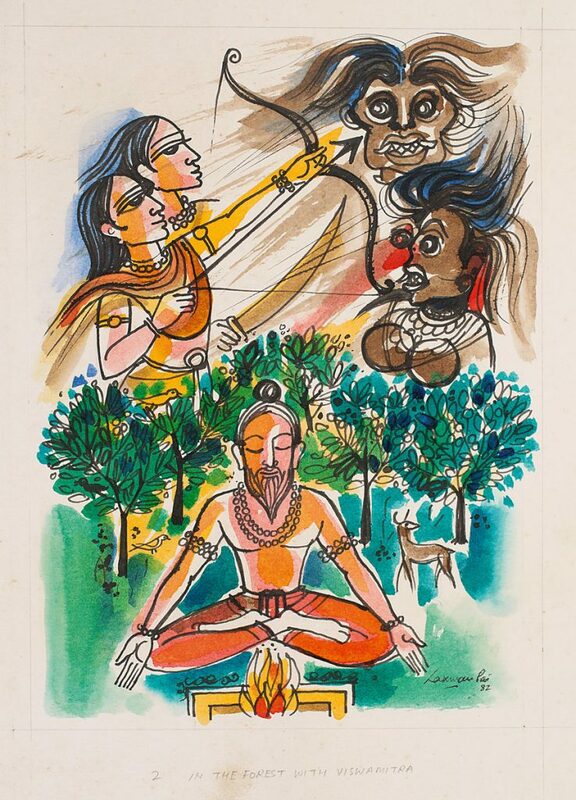 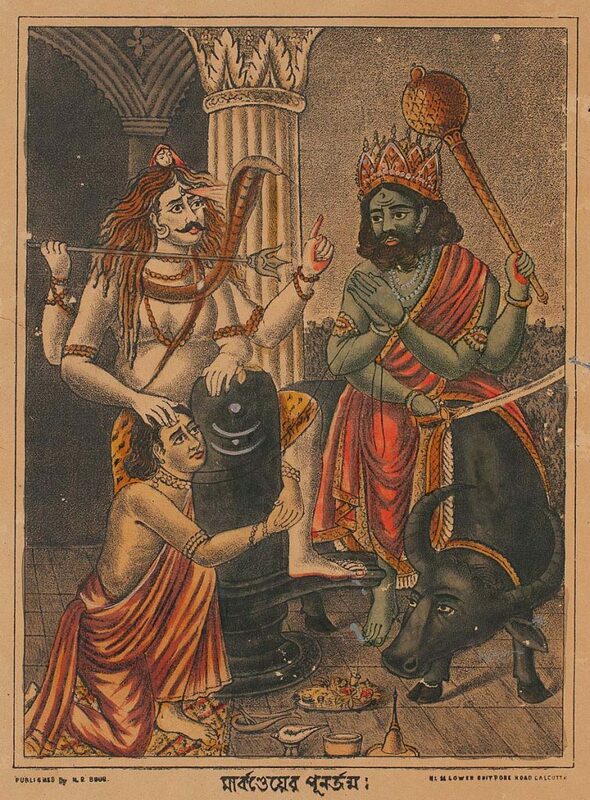 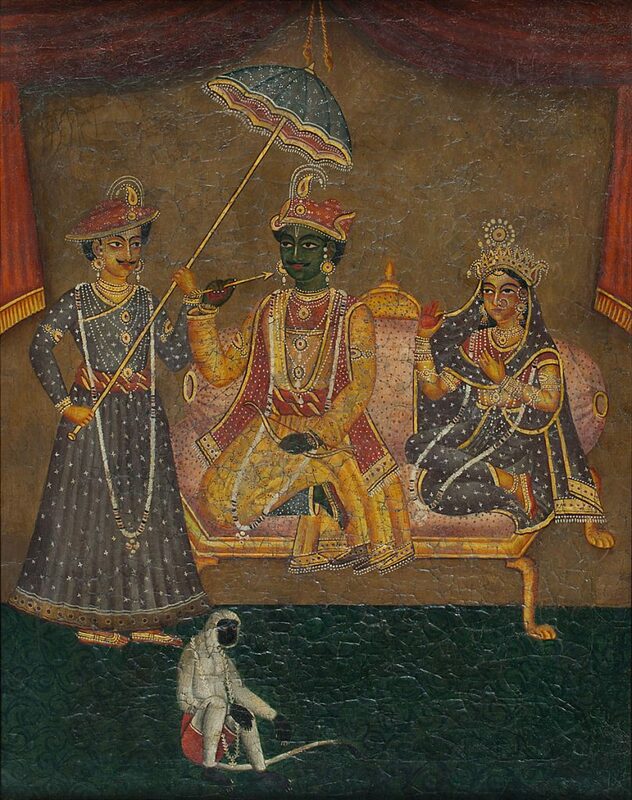 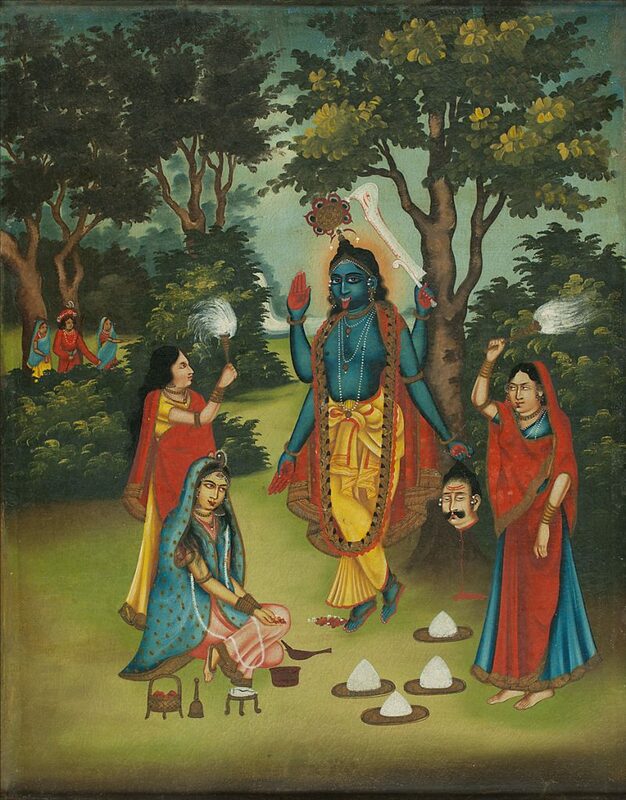 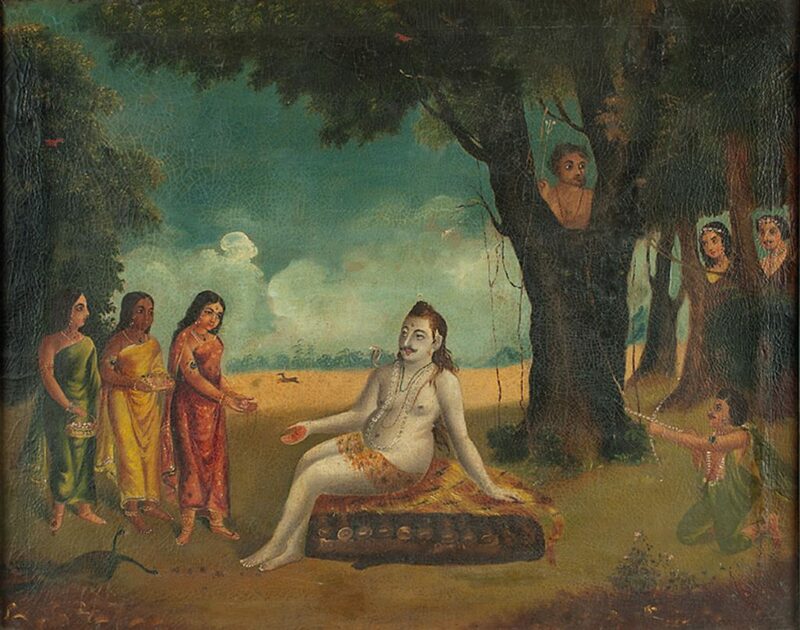 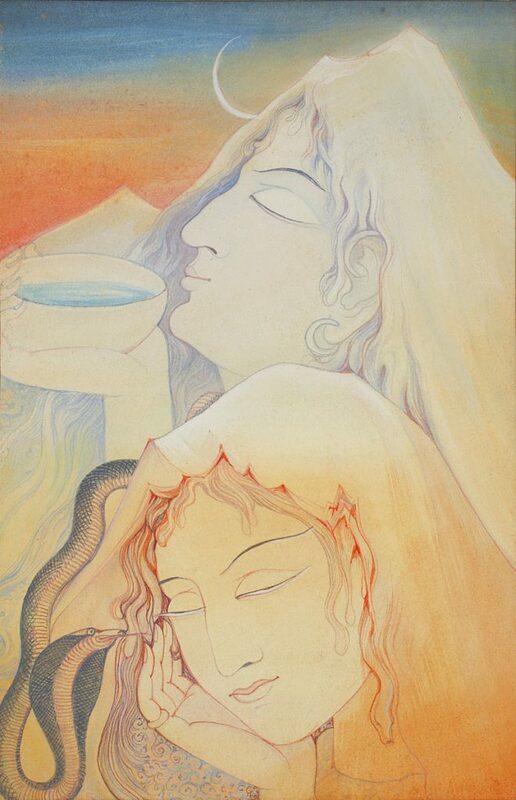 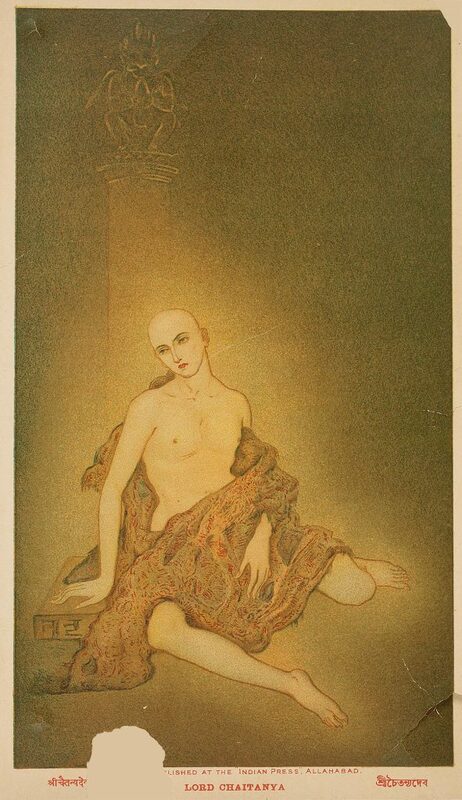 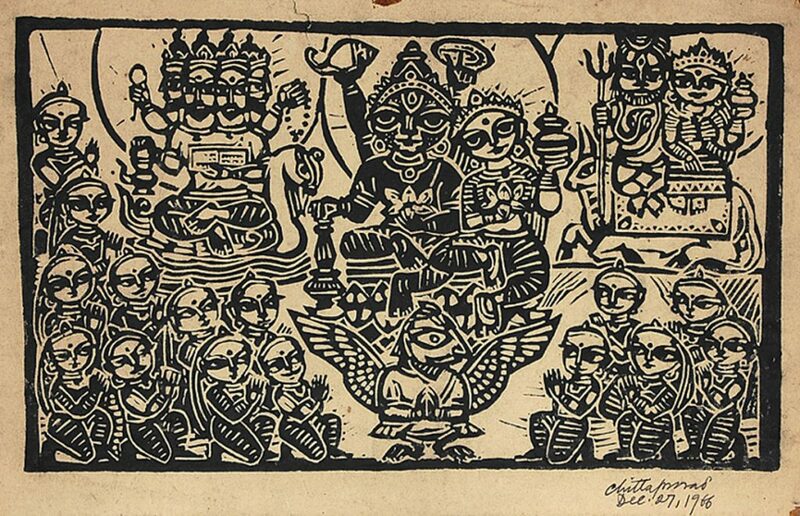 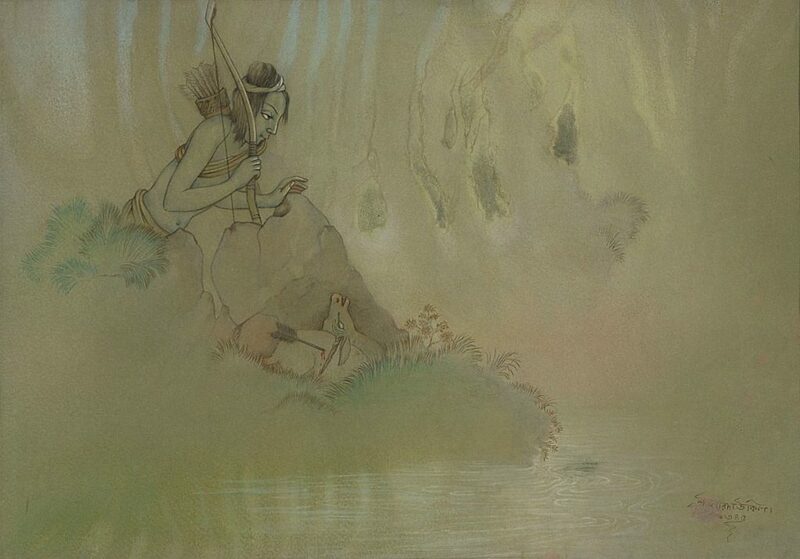 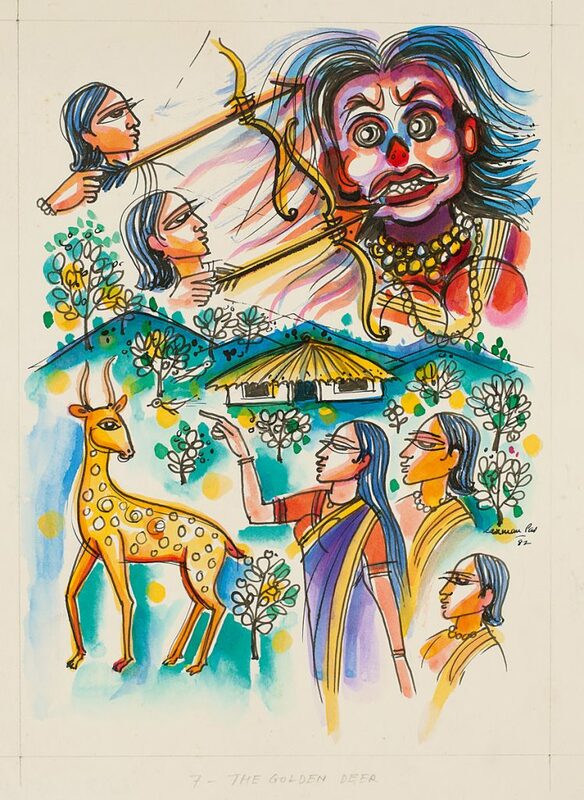 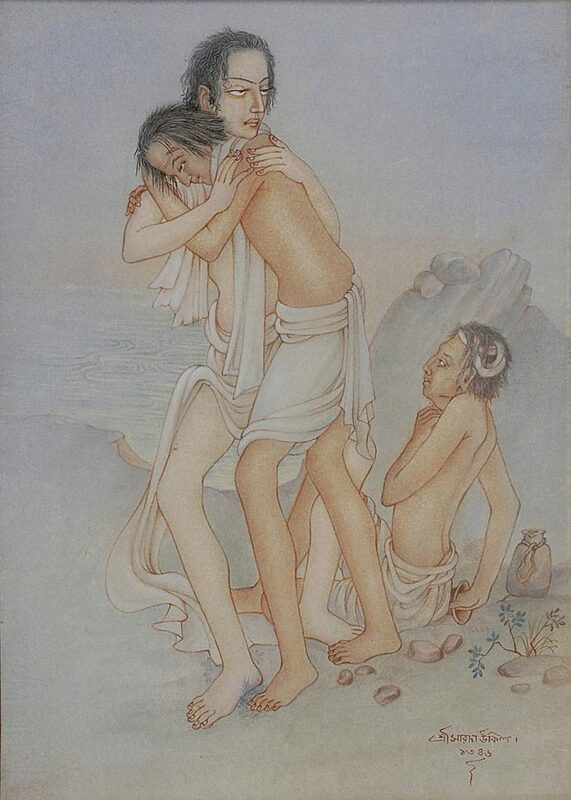 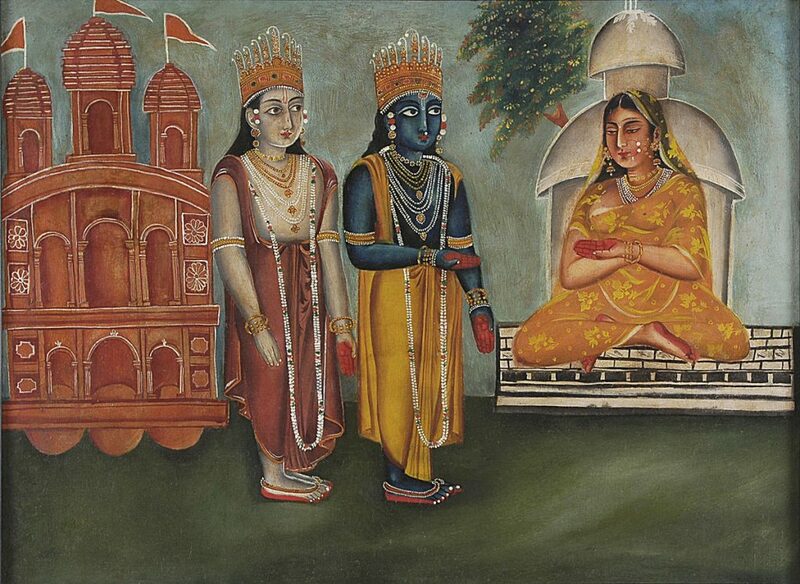 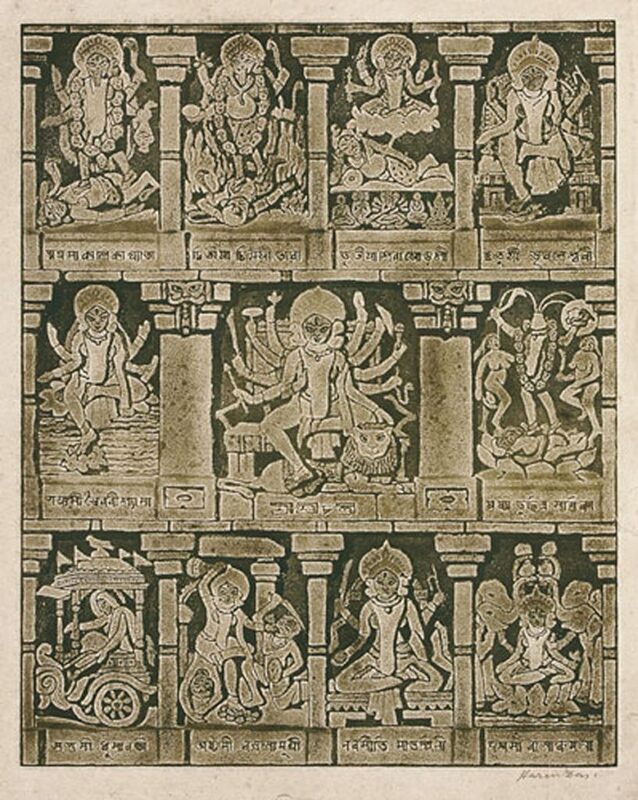 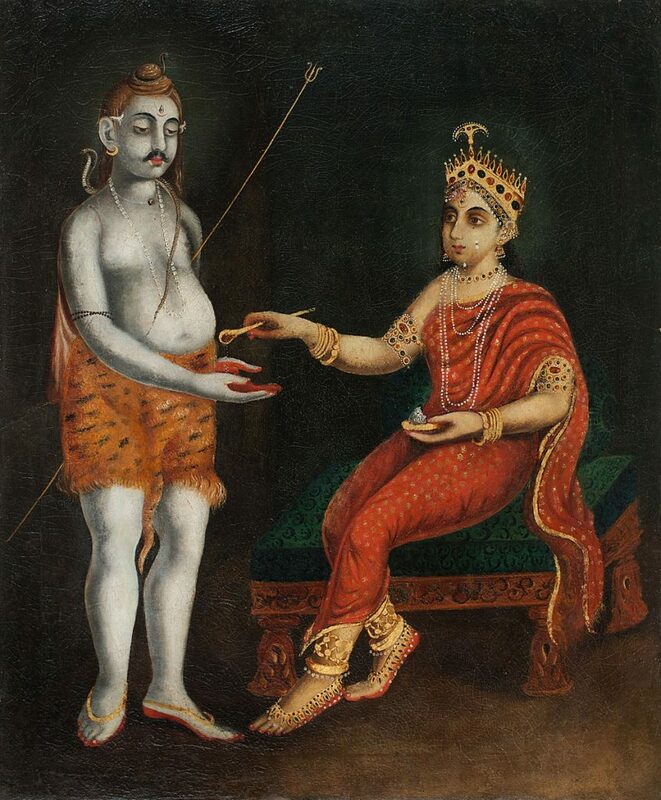 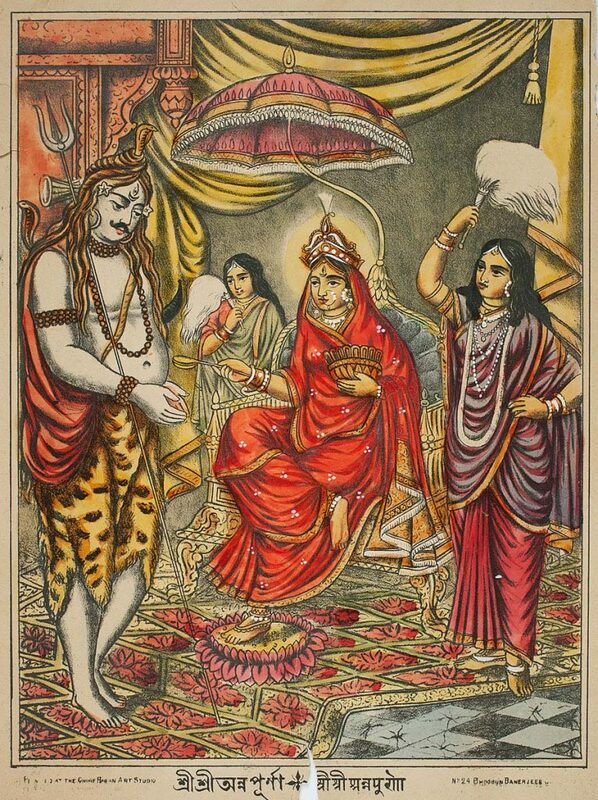 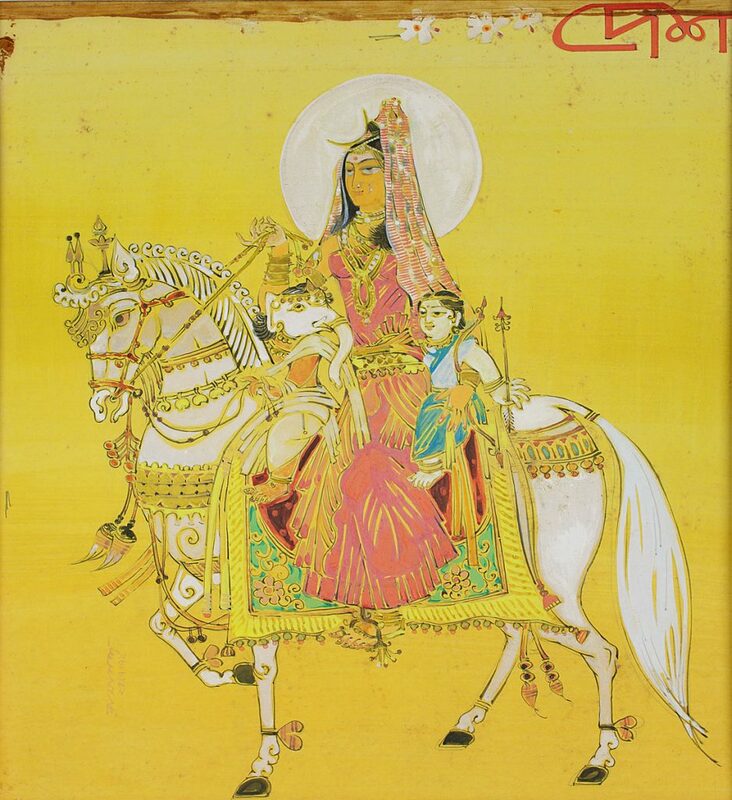 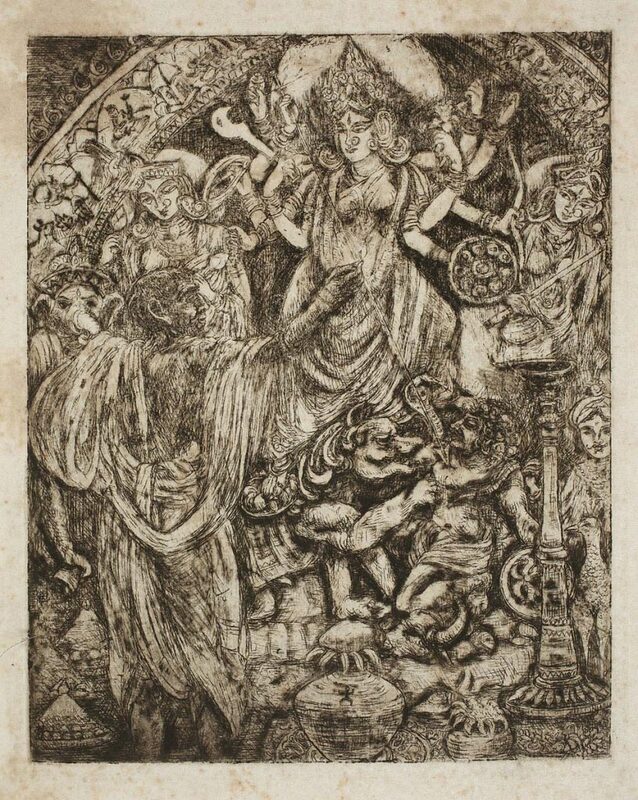 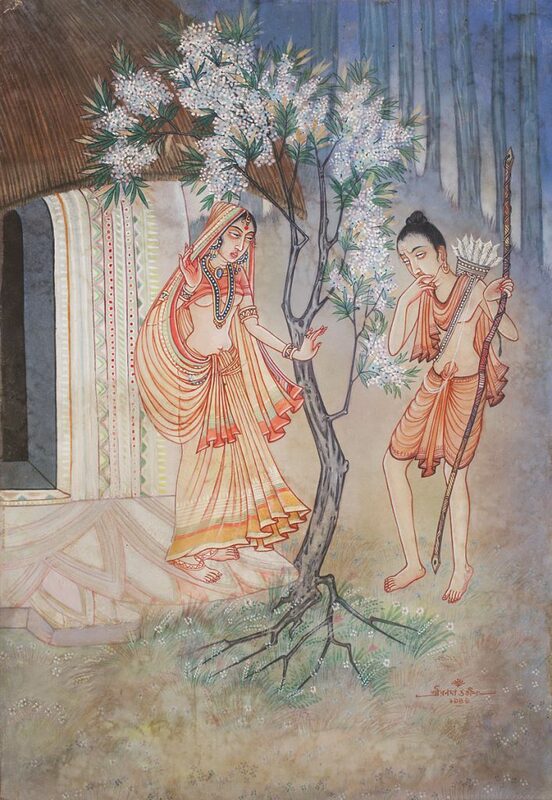 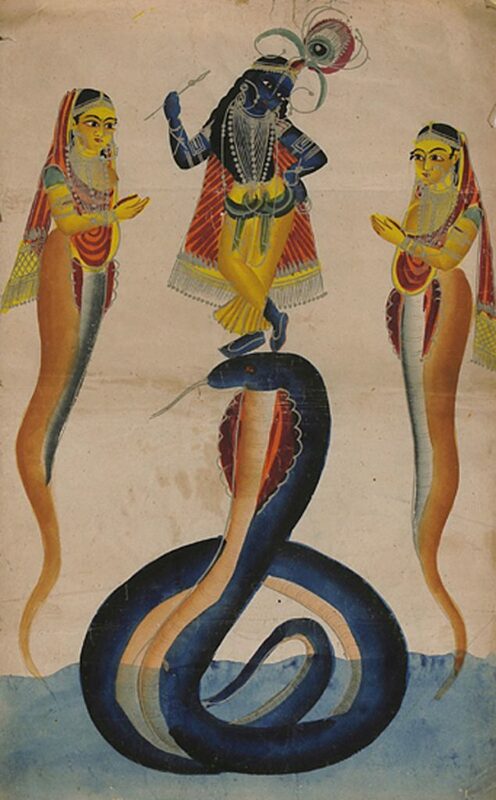 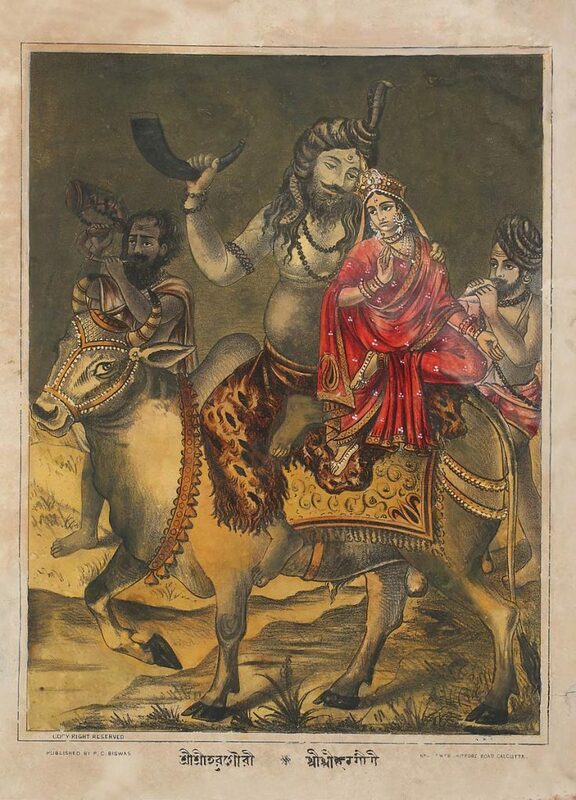 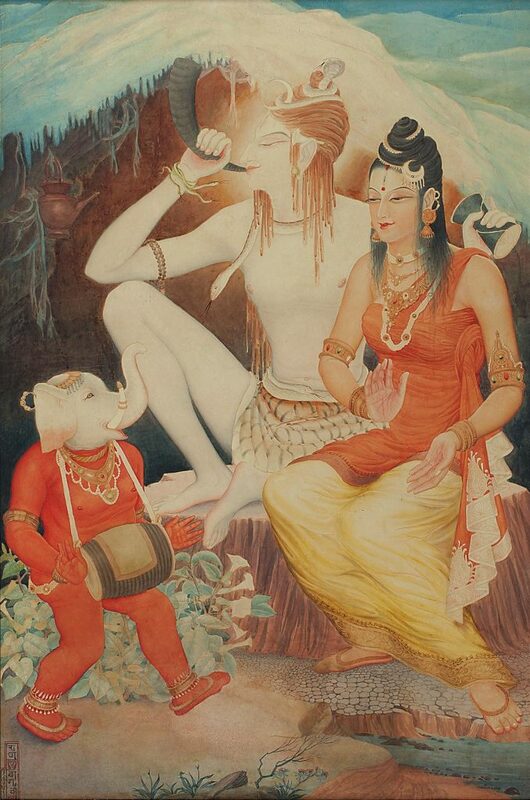 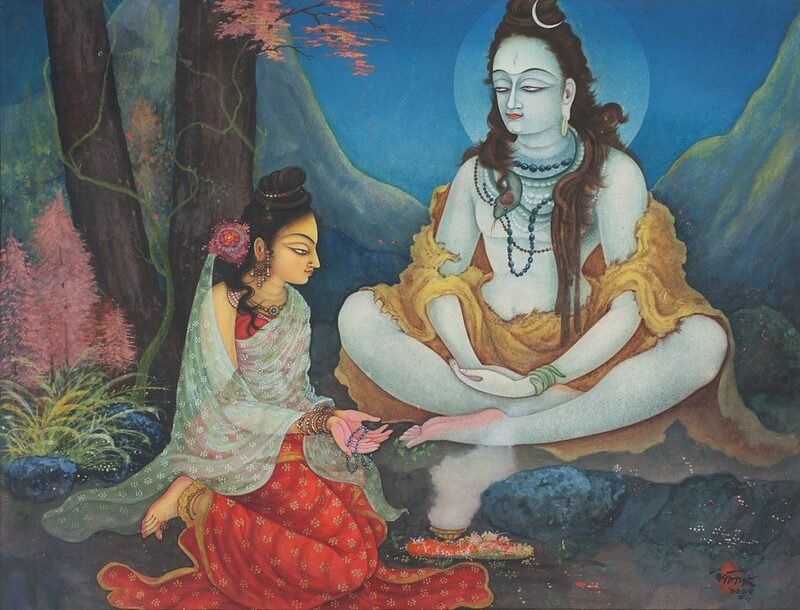 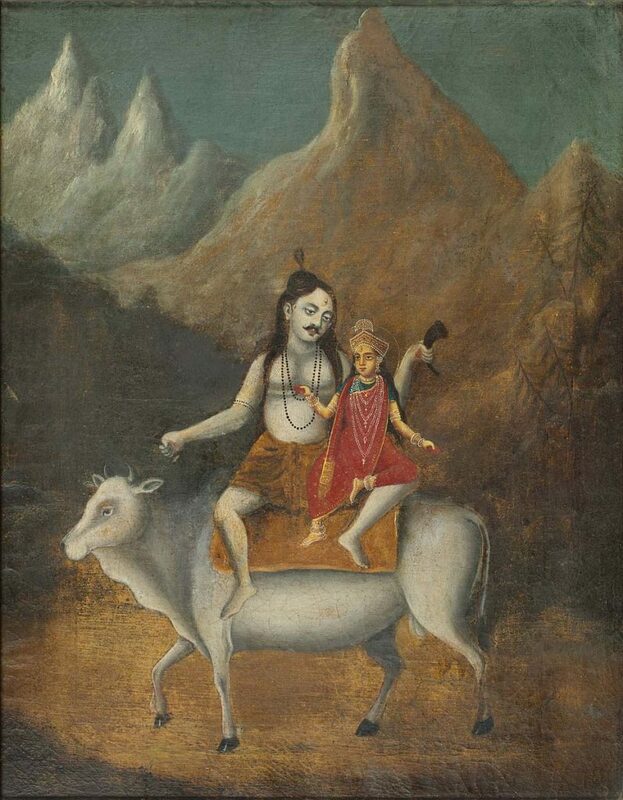 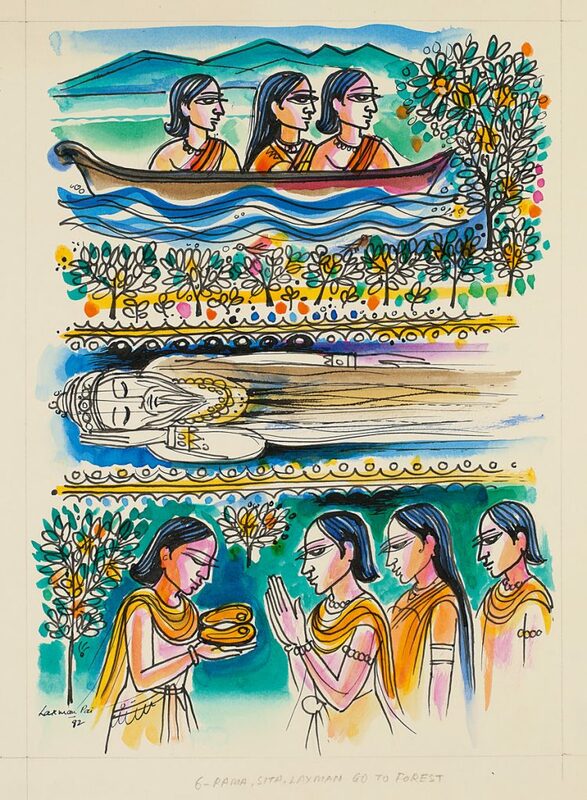 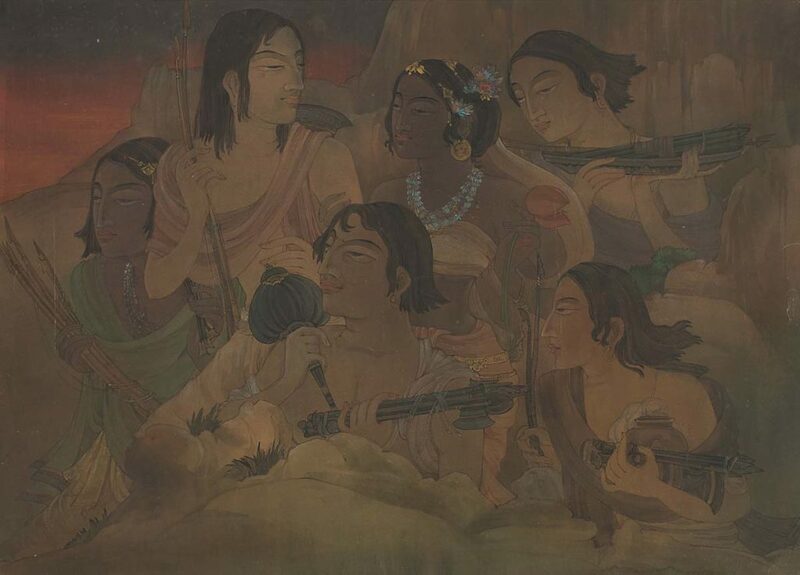 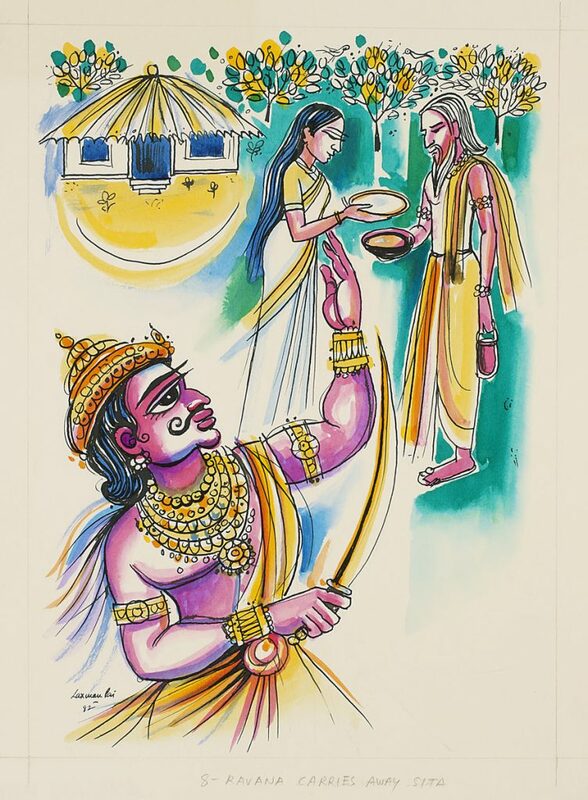 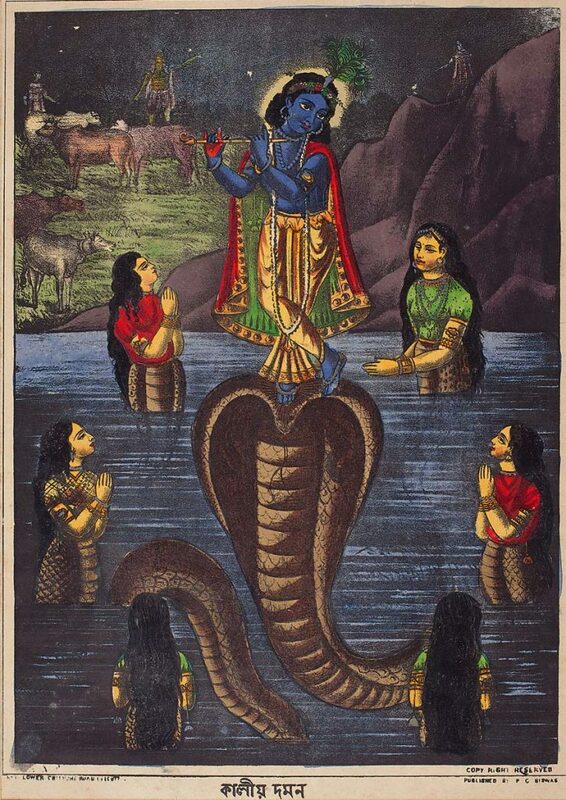 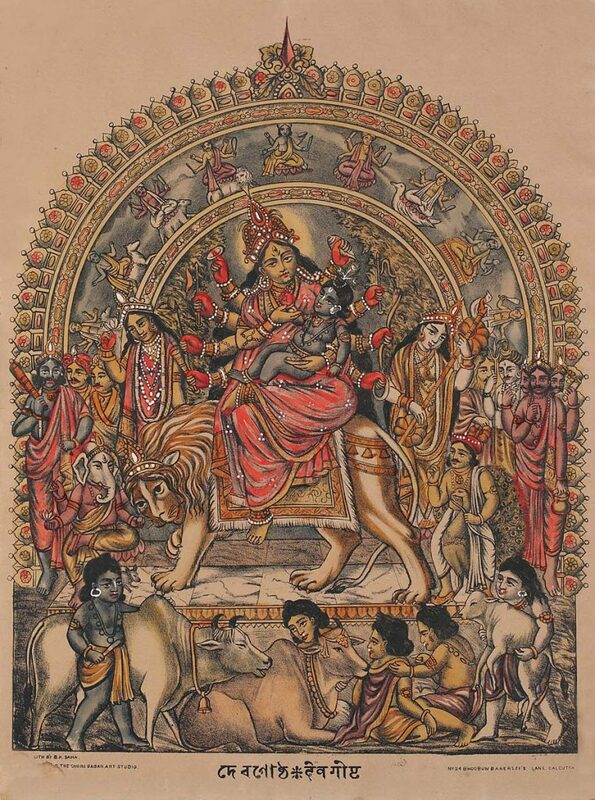 The featured works range from the lyrical imagery of the Bengal School, as represented by the historical Siva Drinking World Poison by Nandalal Bose, to modern renditions of the devi and popular episodes from myth and epics, such as the Mahabharata, from all parts of the country and spanning a diverse range of styles over the eventful 20th century and early 21st century. 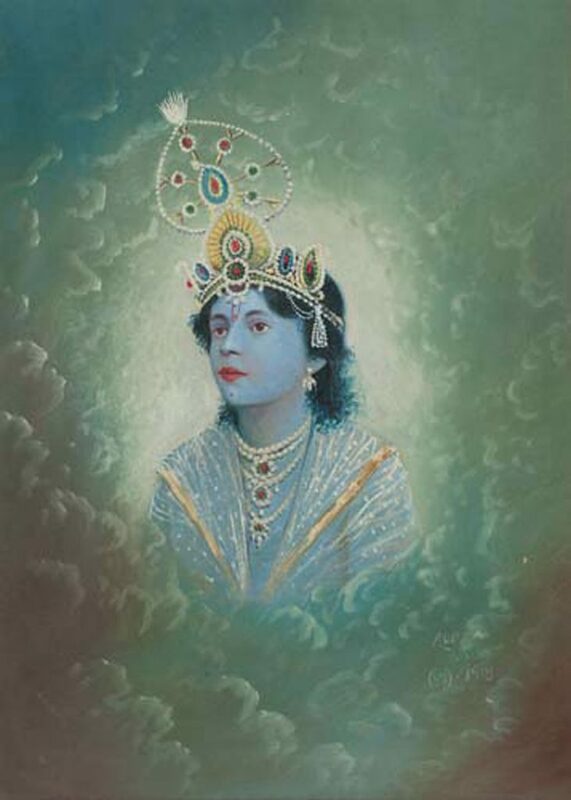 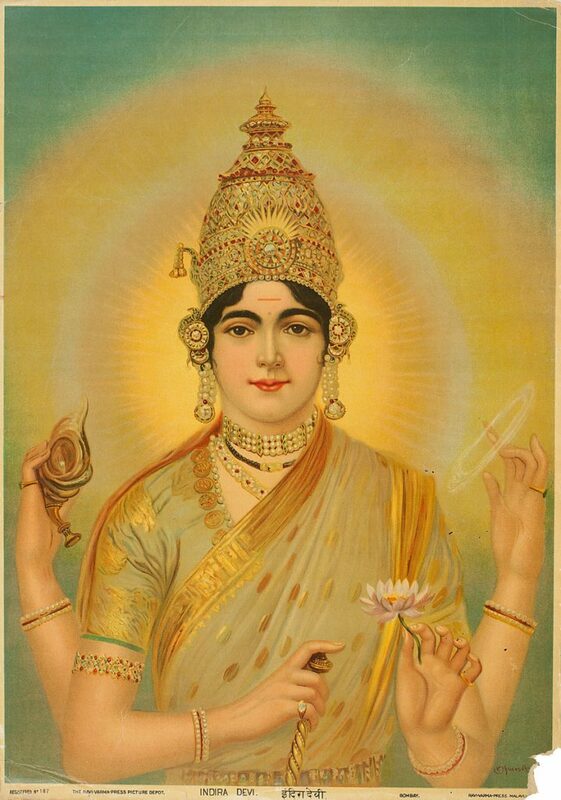 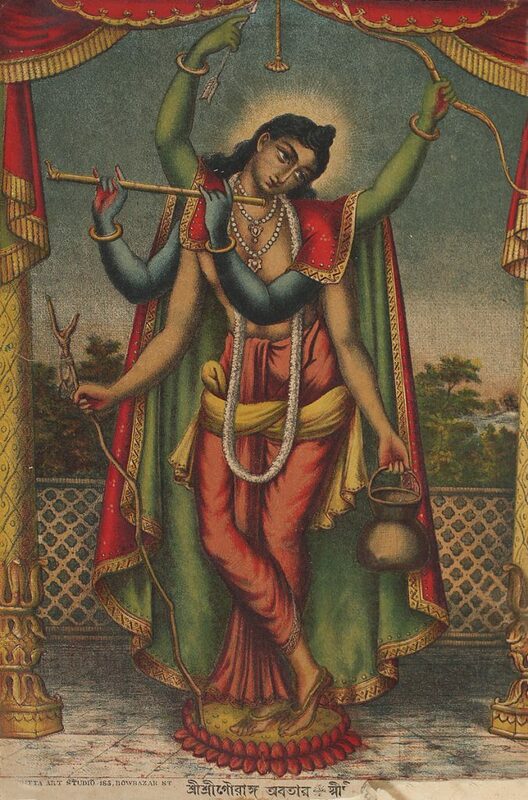 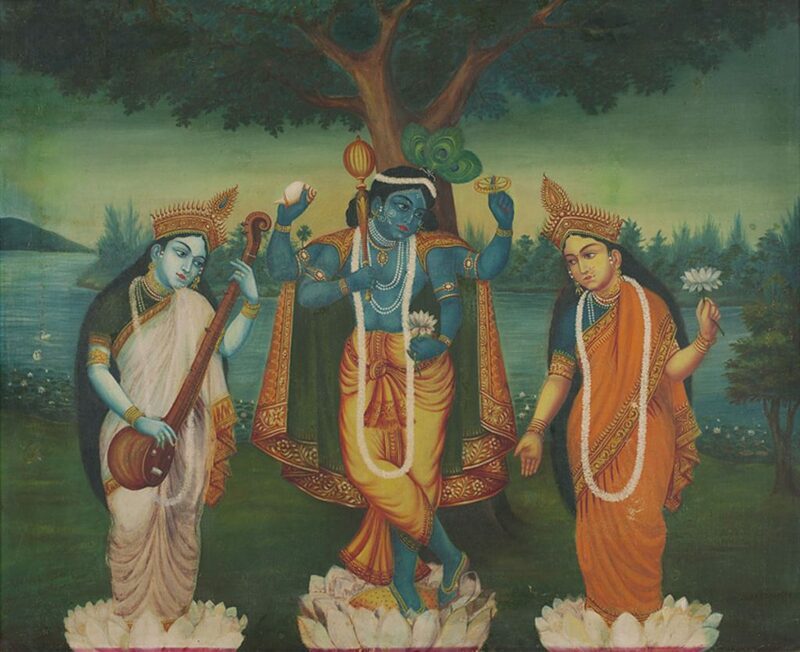 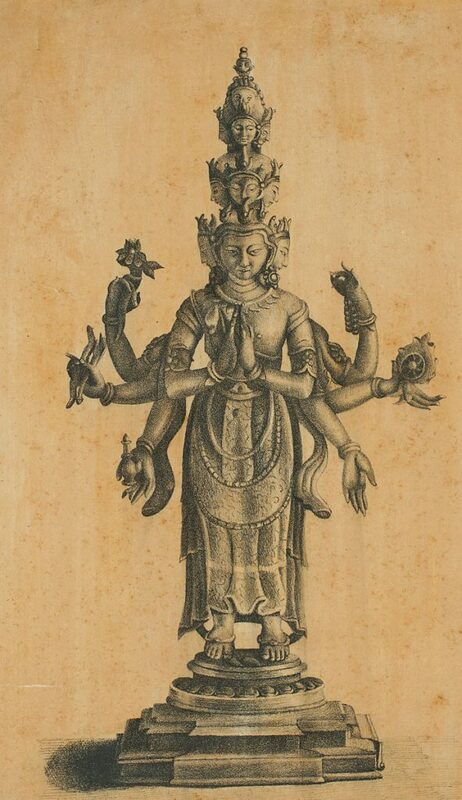 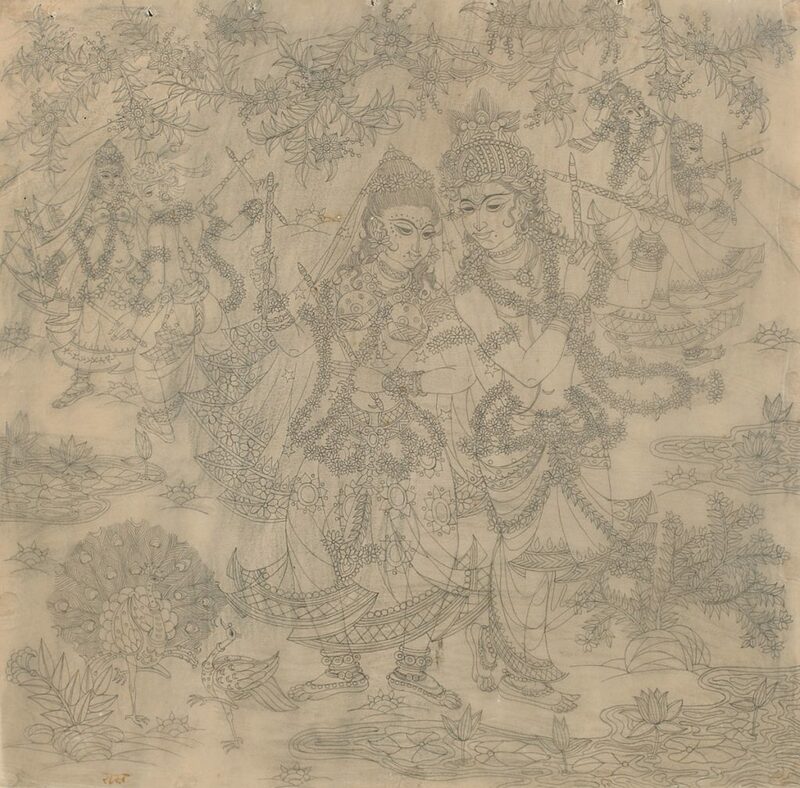 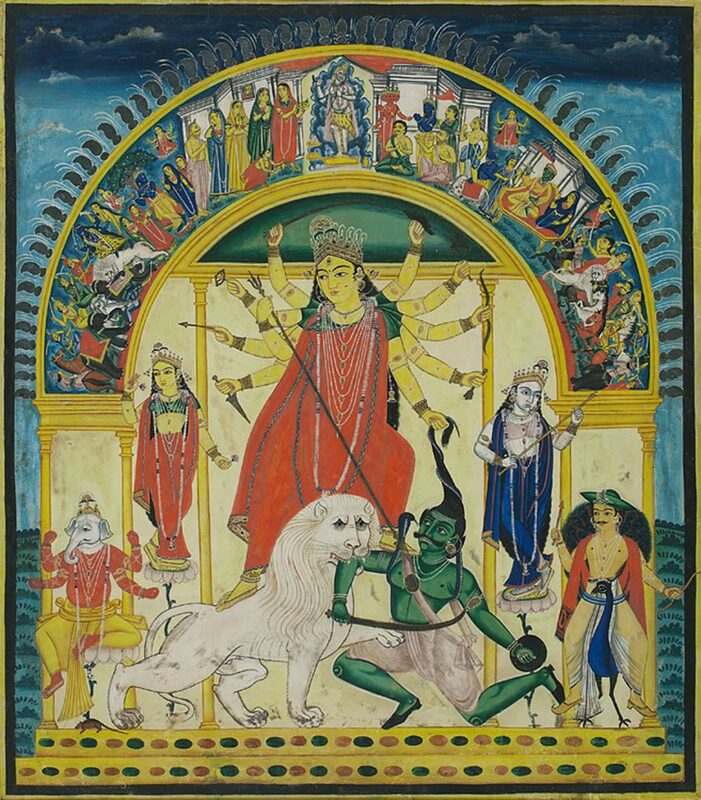 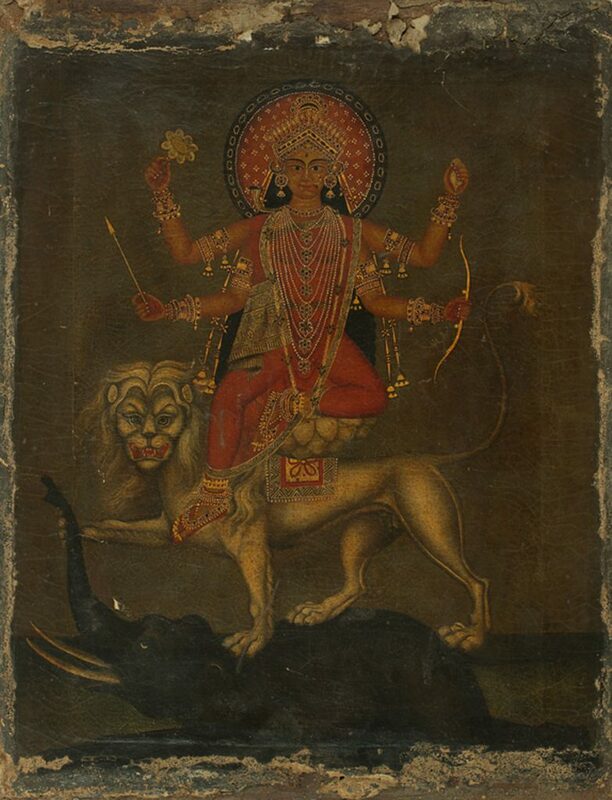 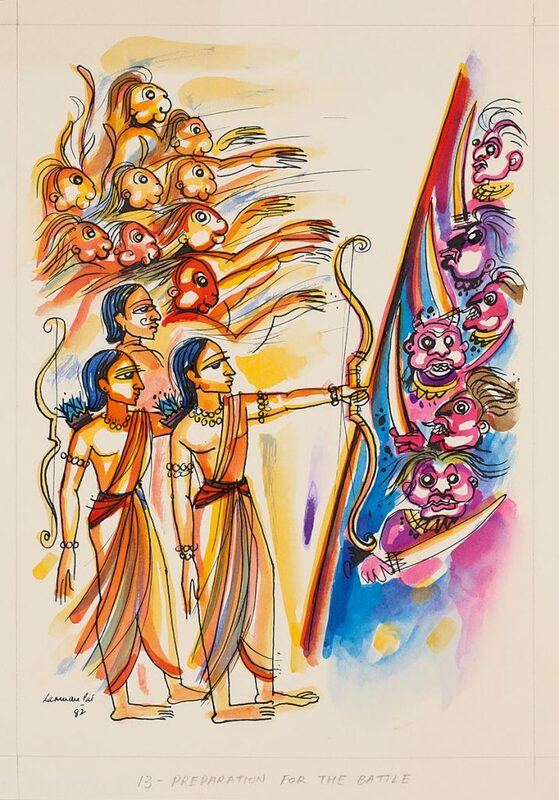 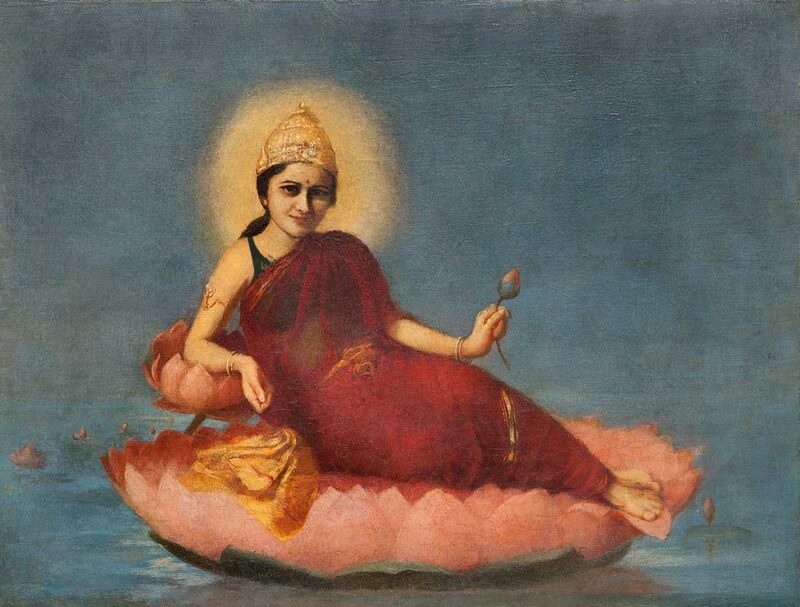 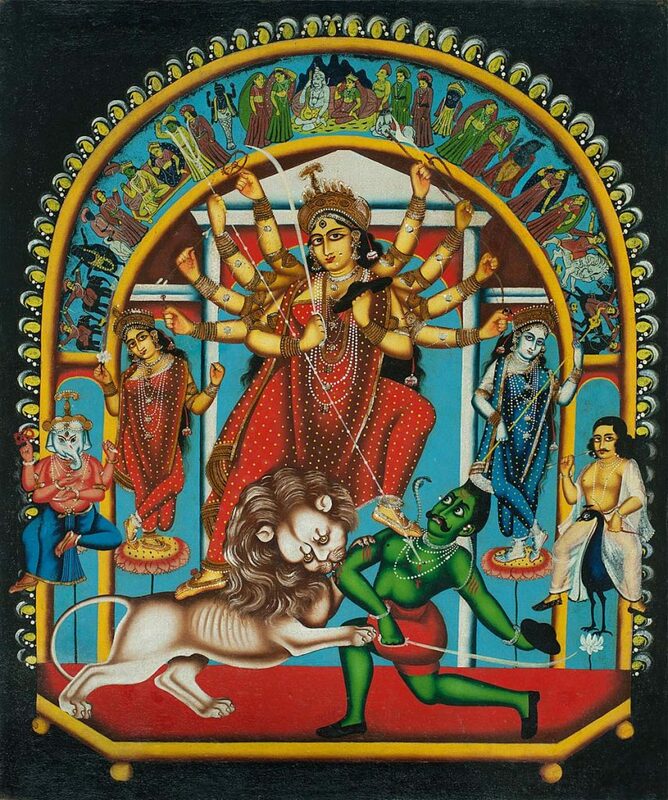 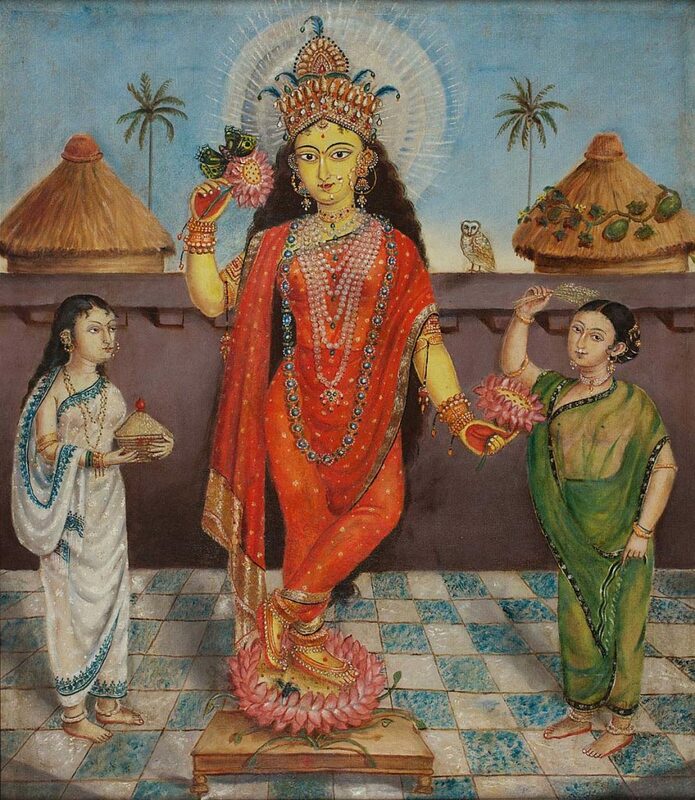 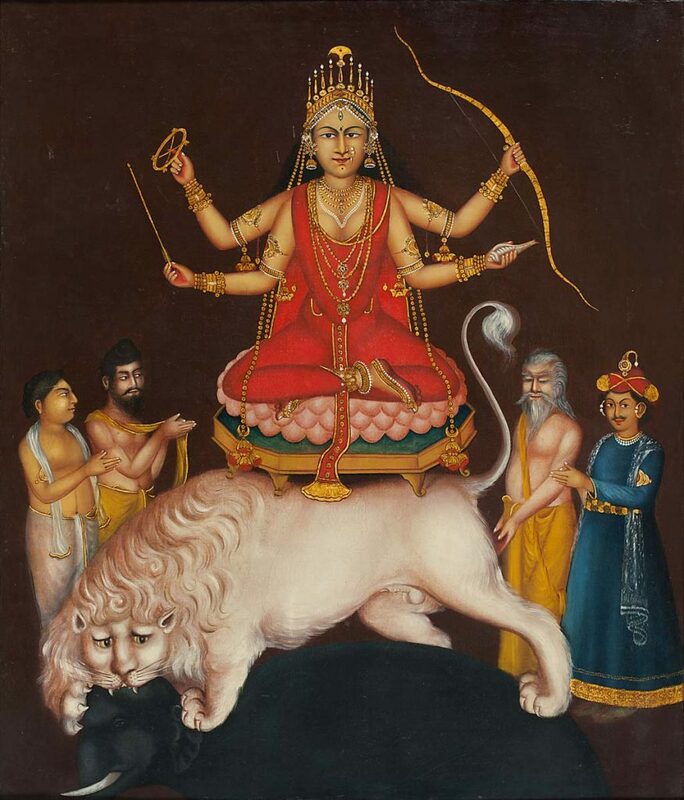 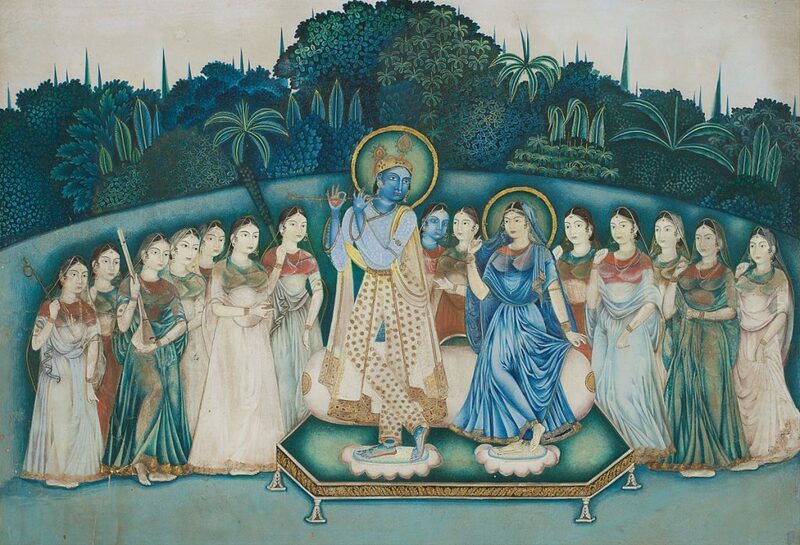 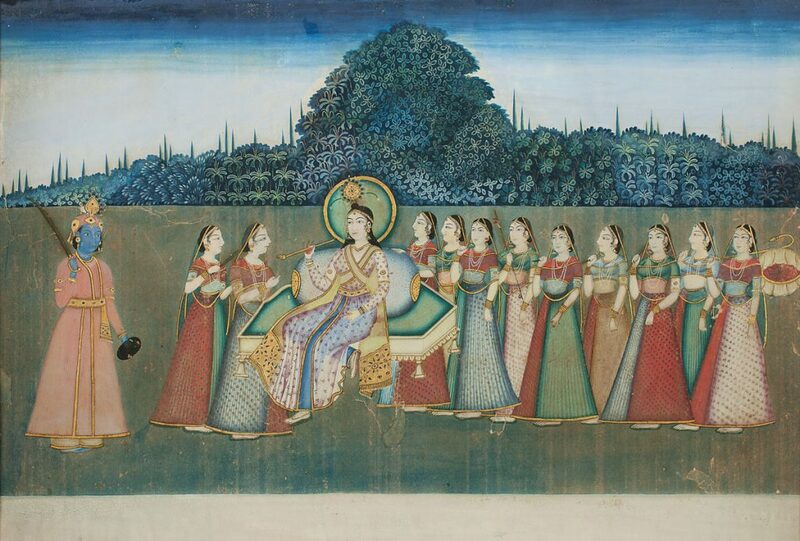 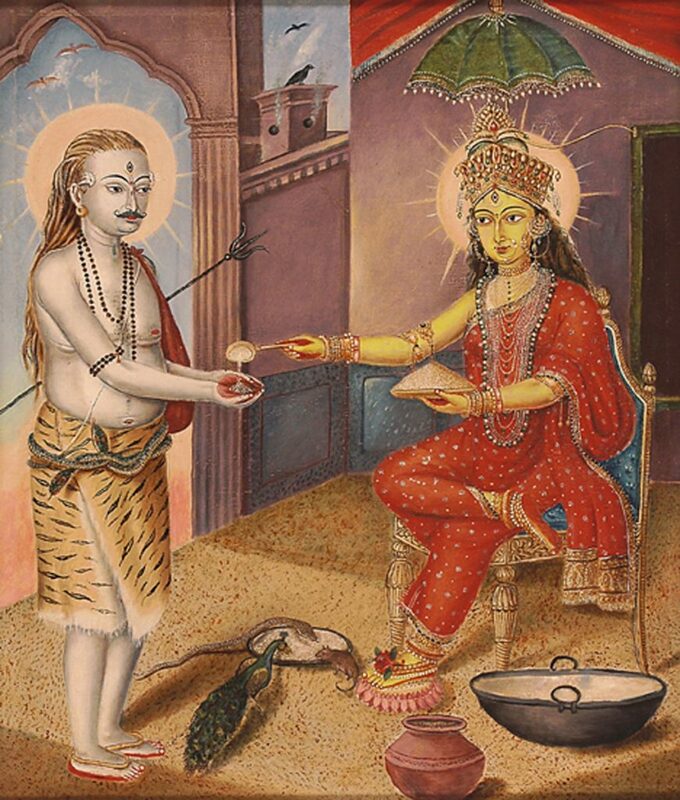 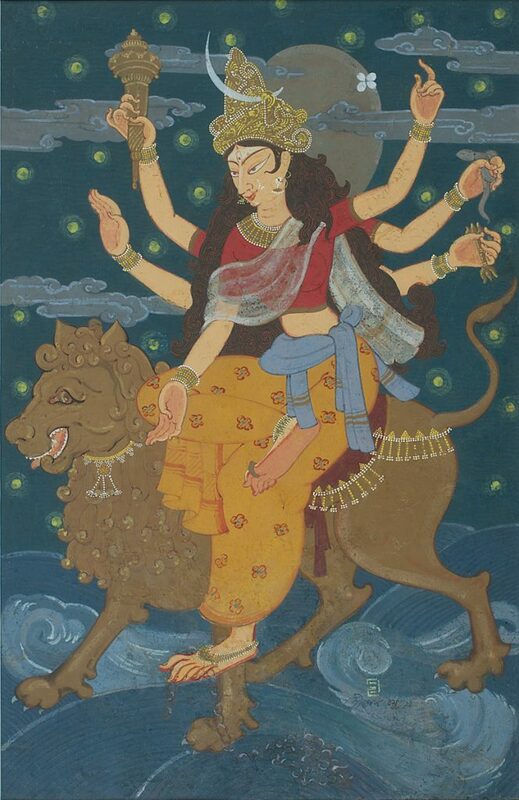 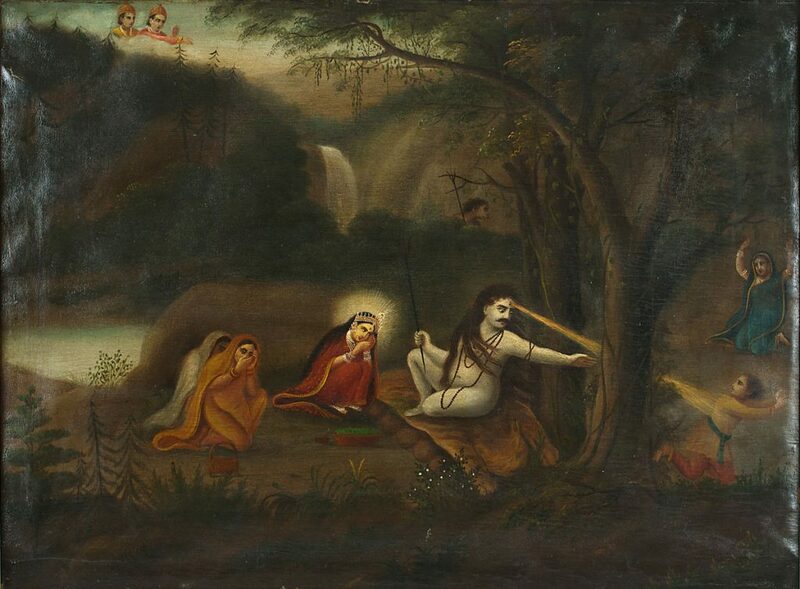 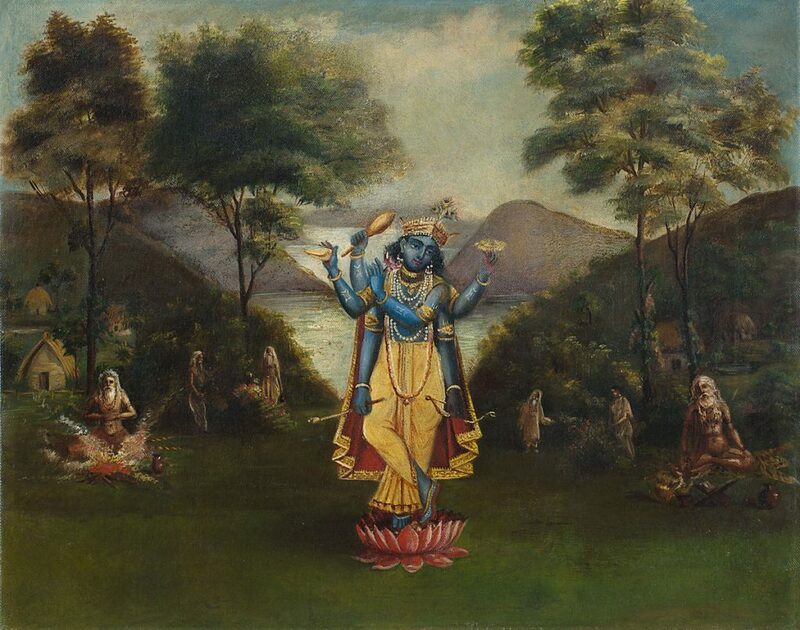 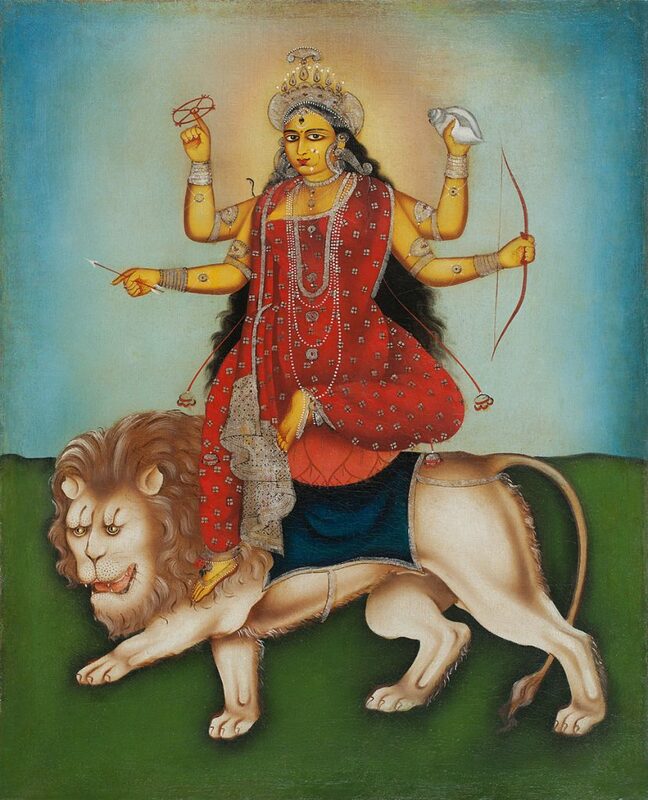 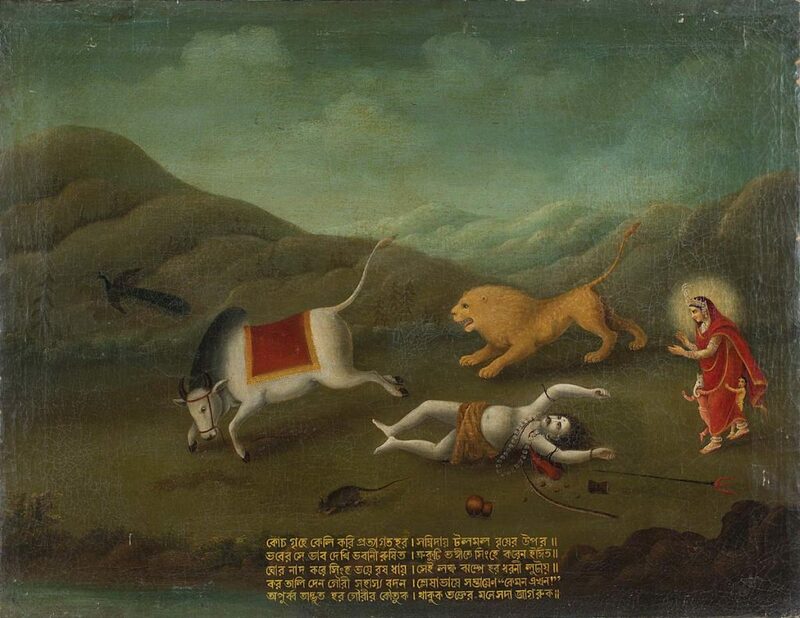 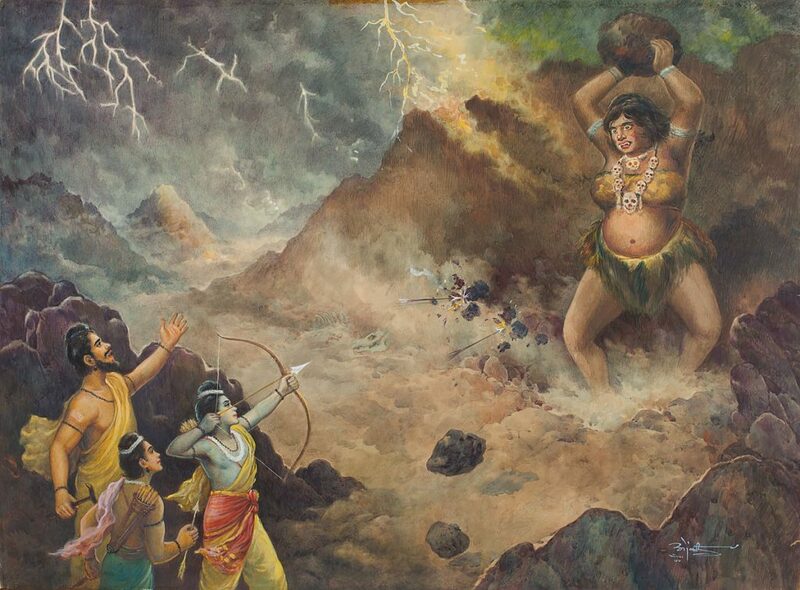 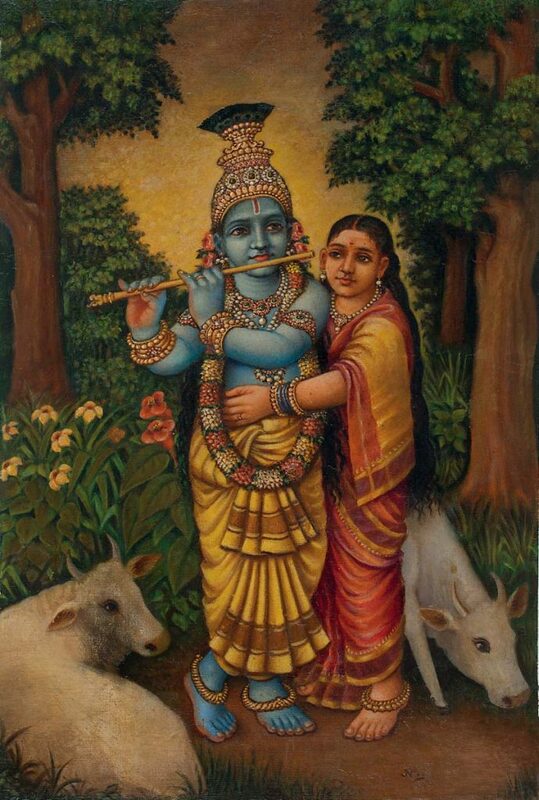 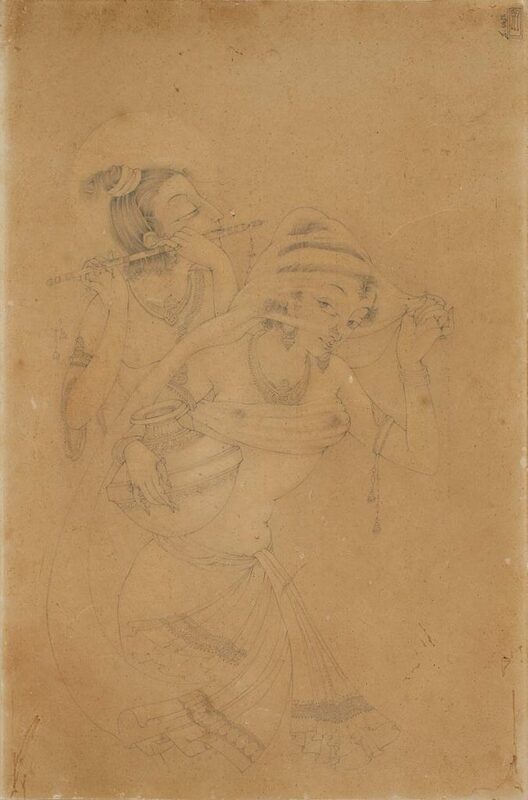 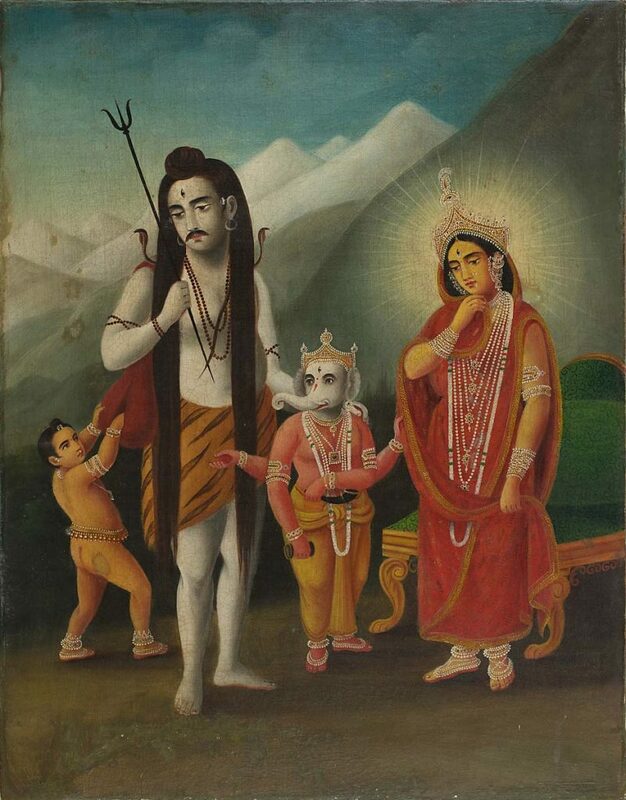 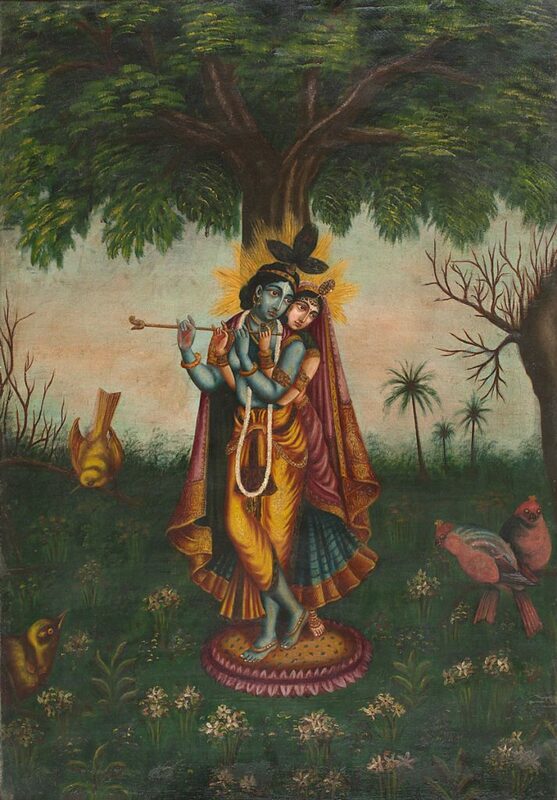 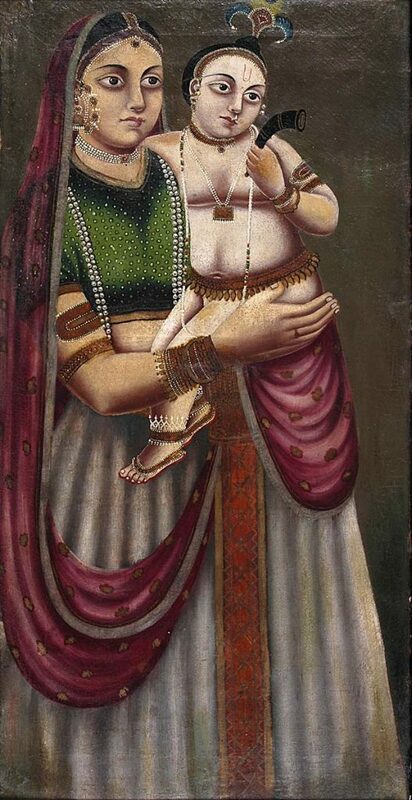 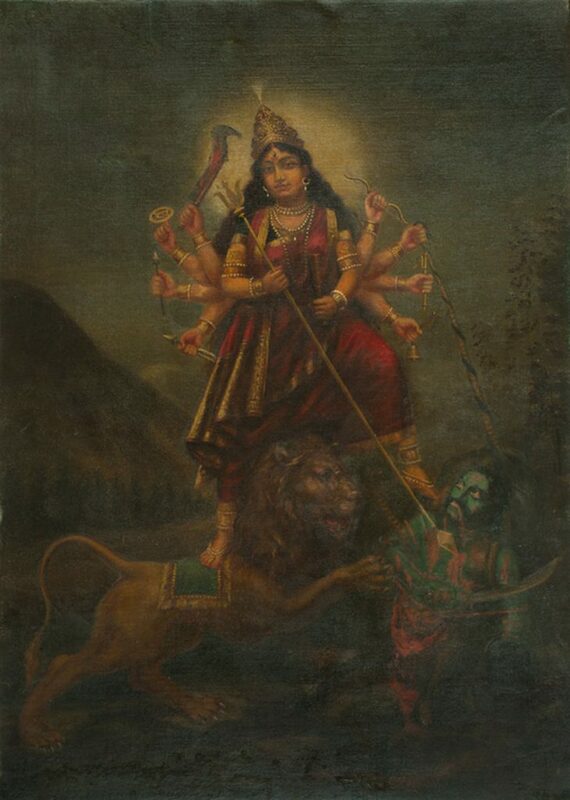 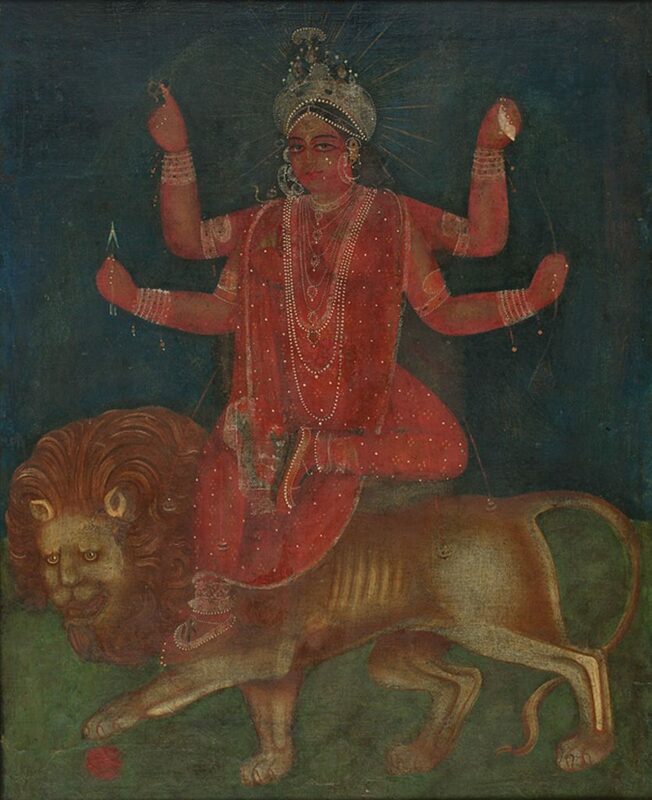 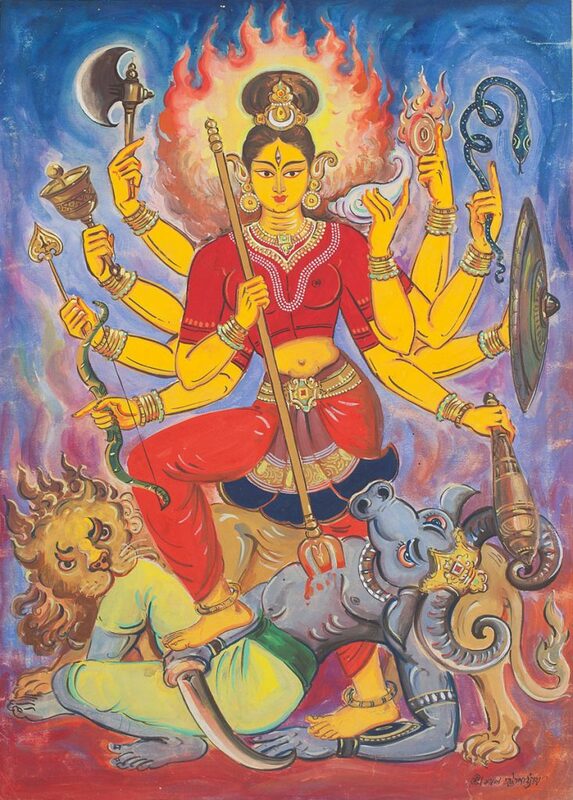 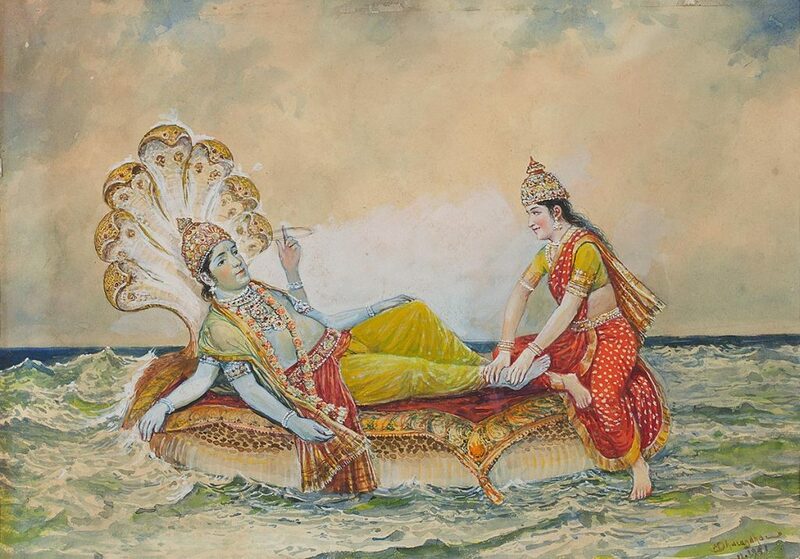 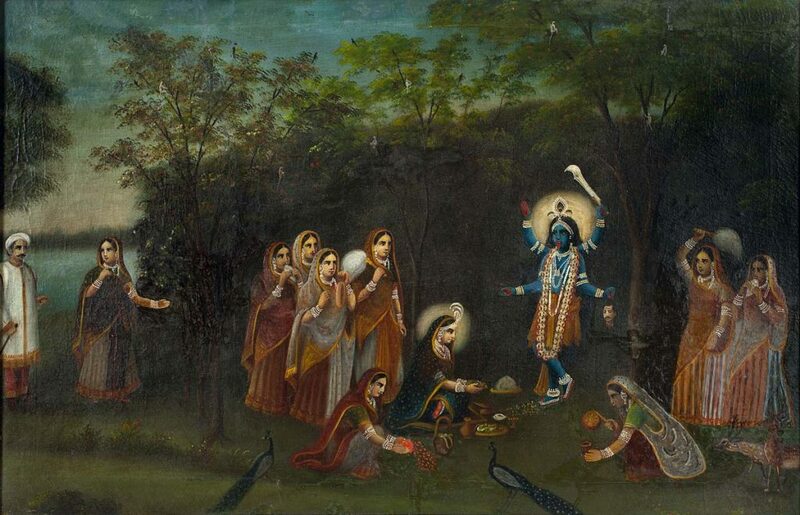 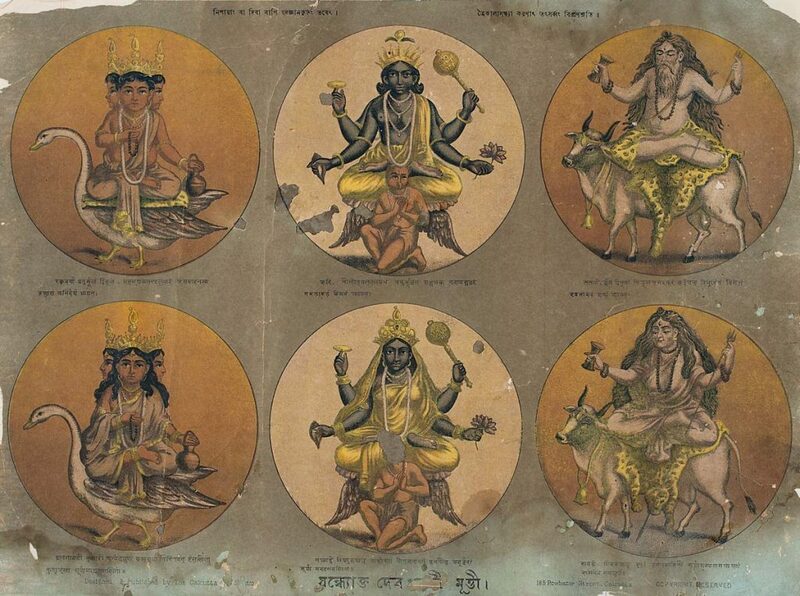 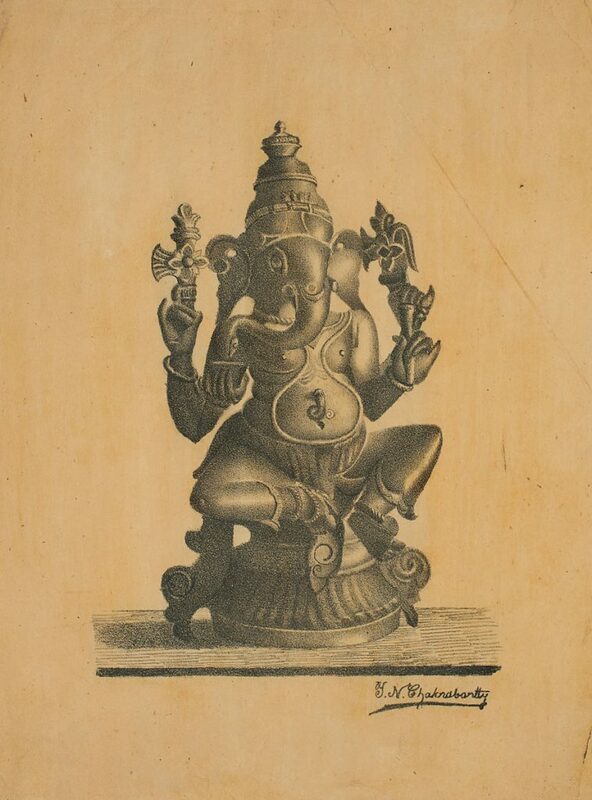 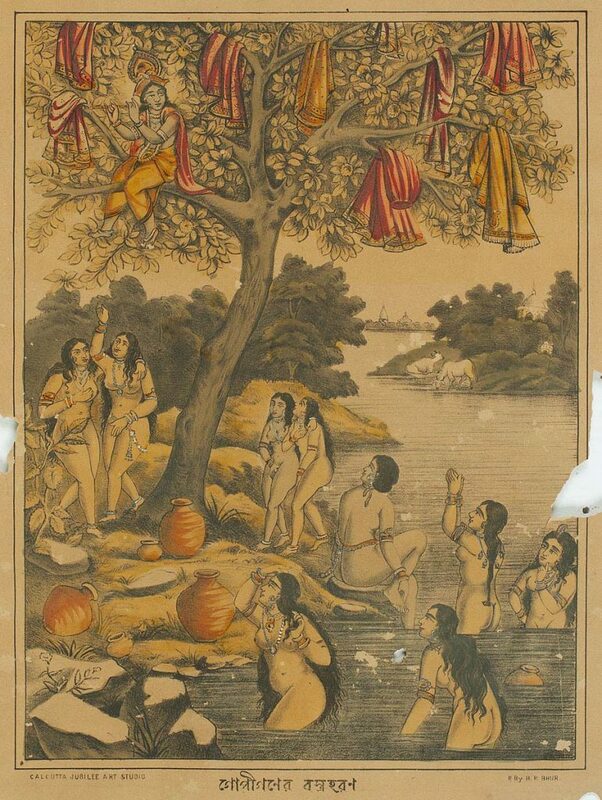 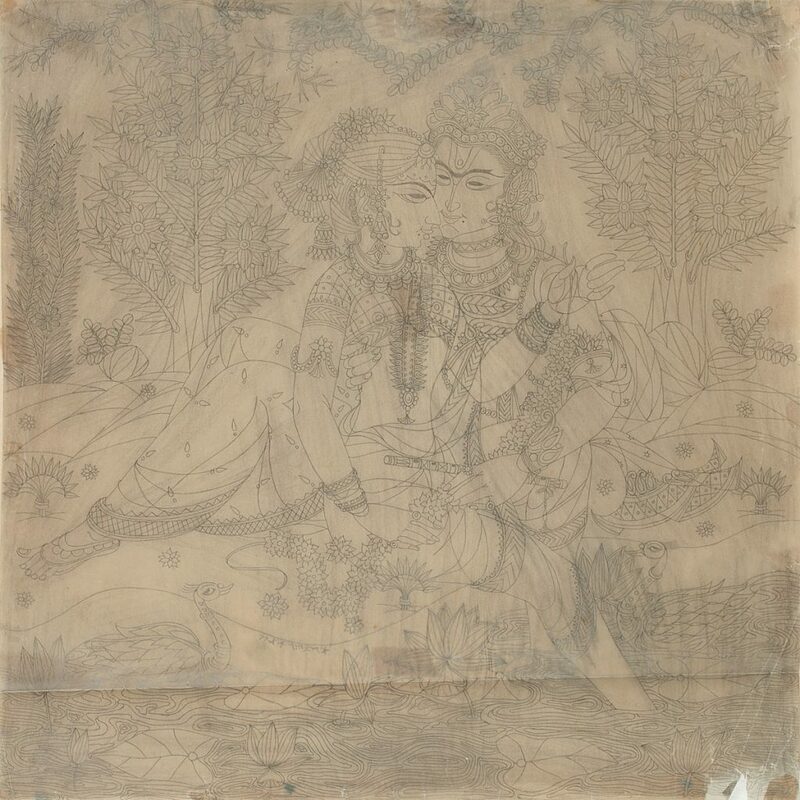 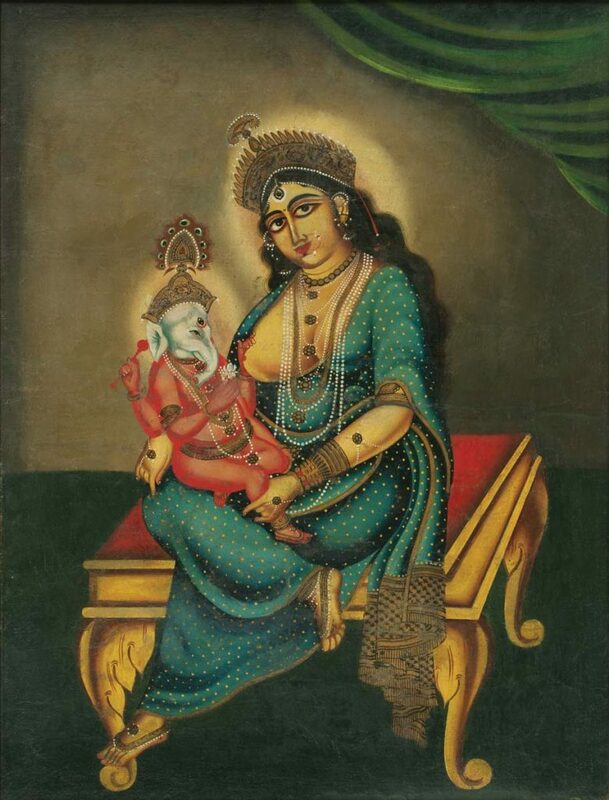 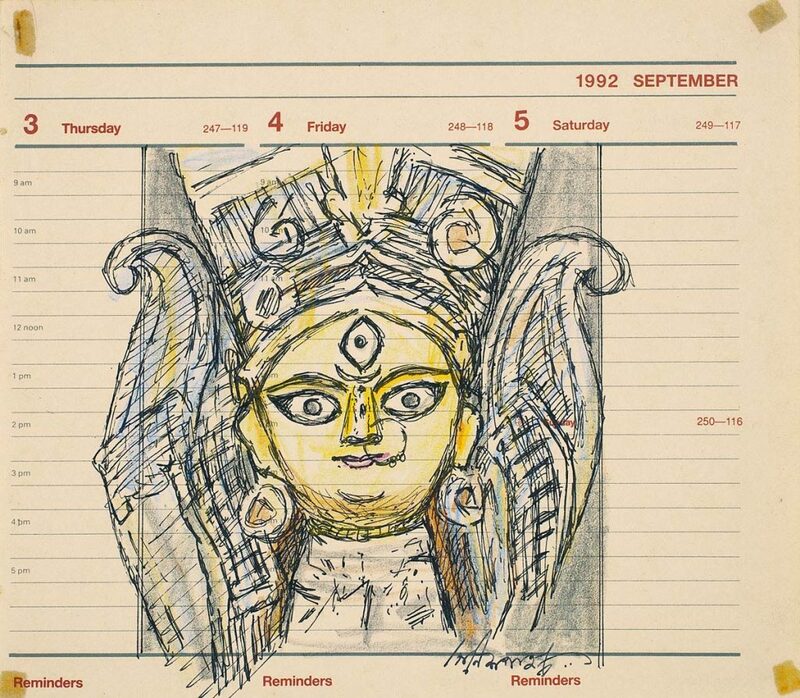 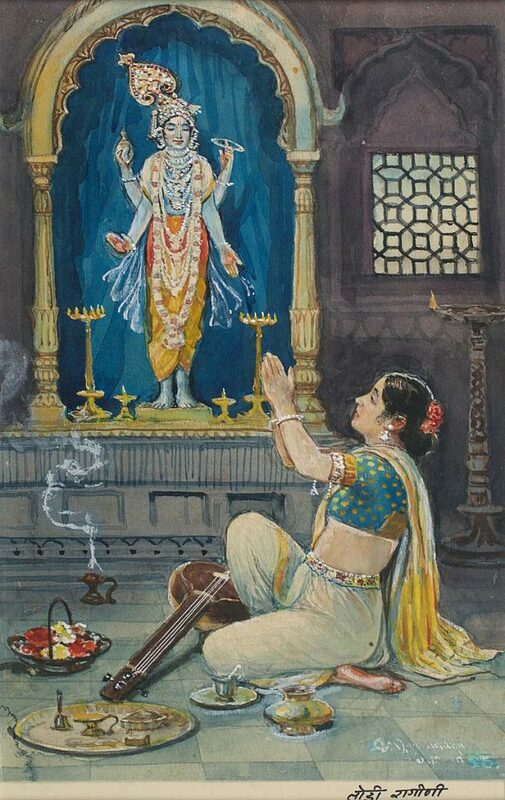 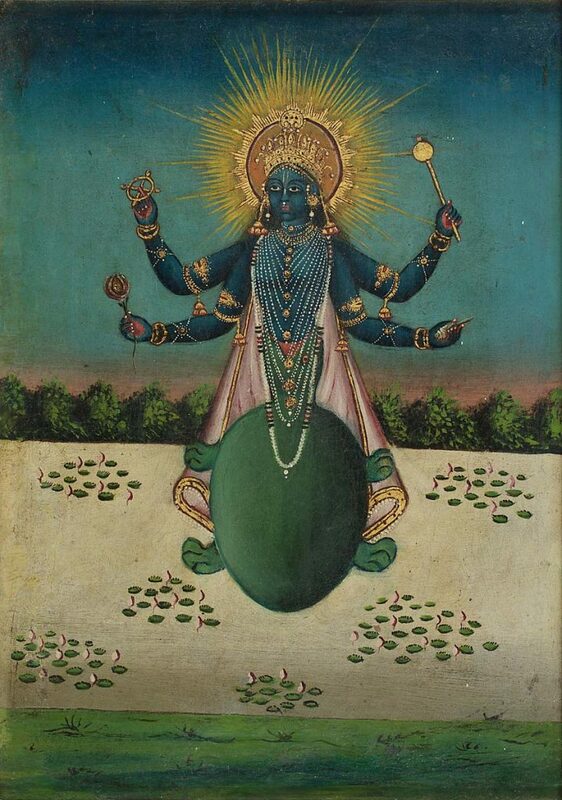 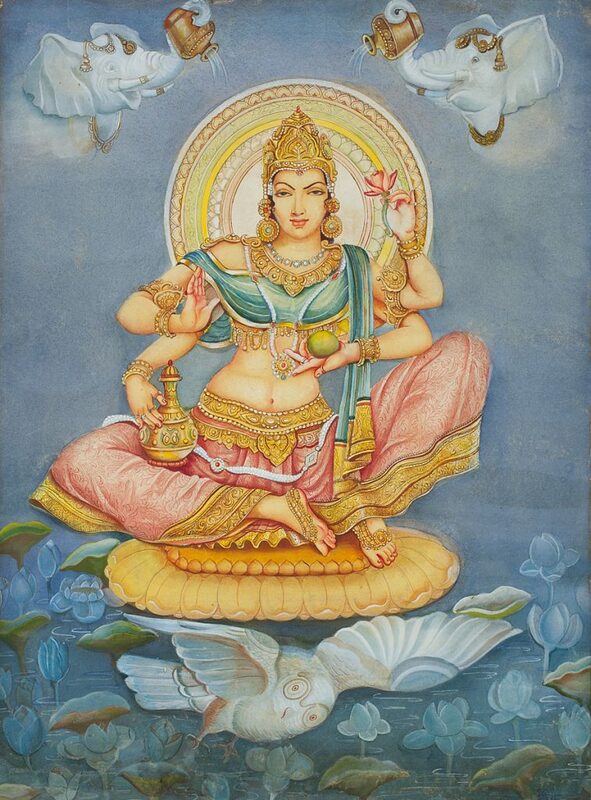 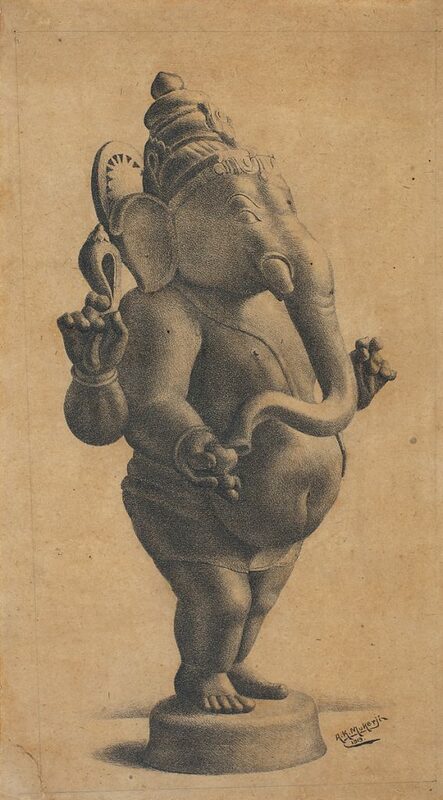 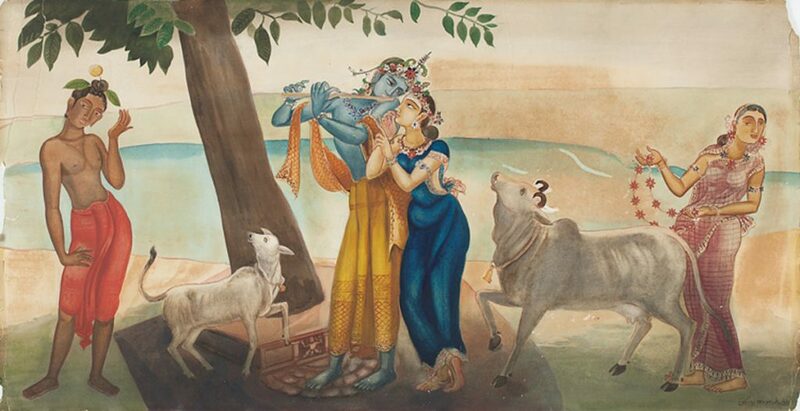 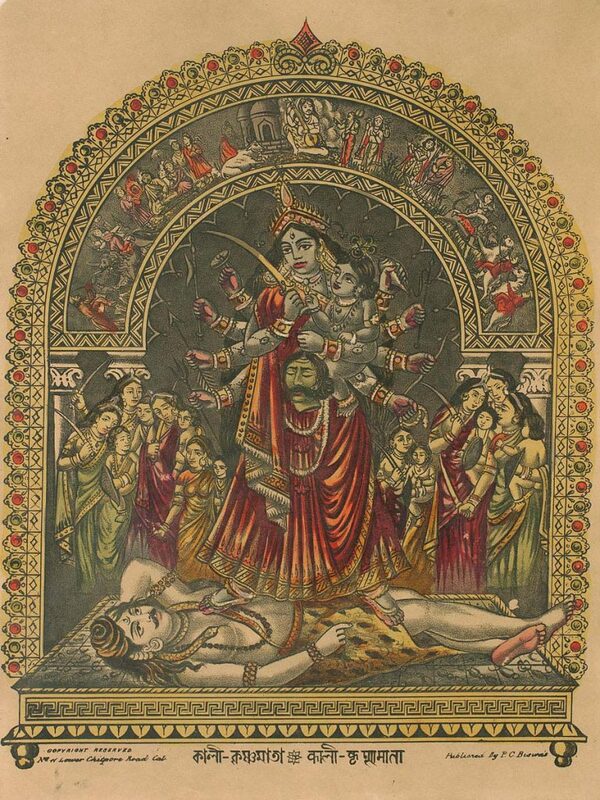 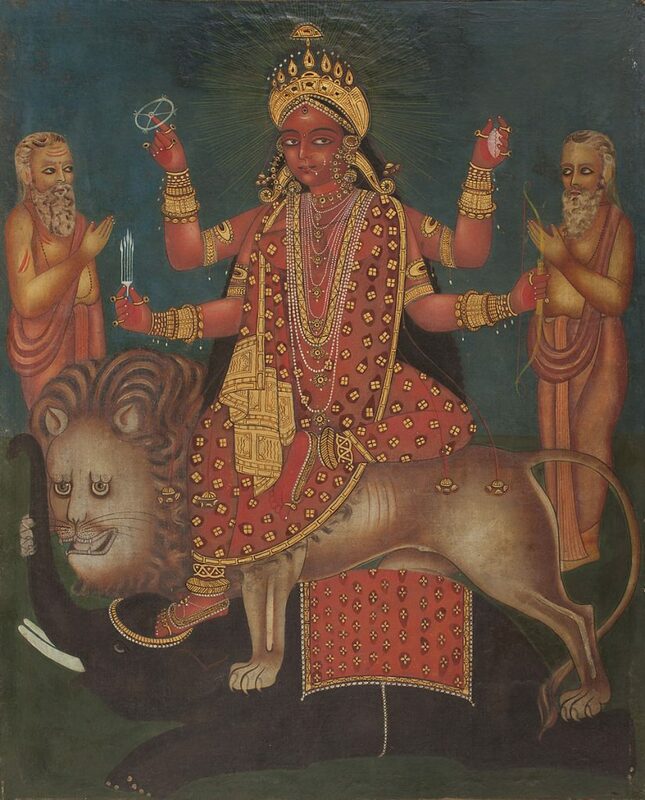 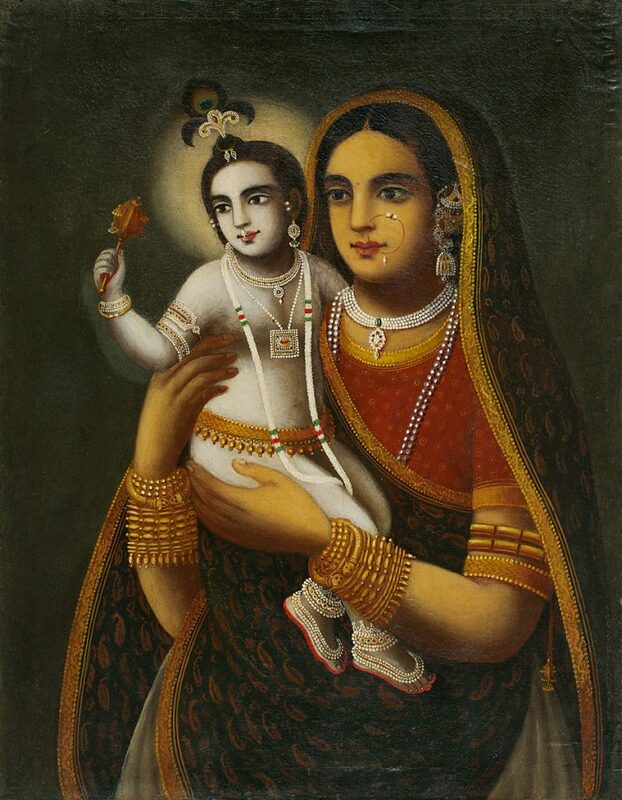 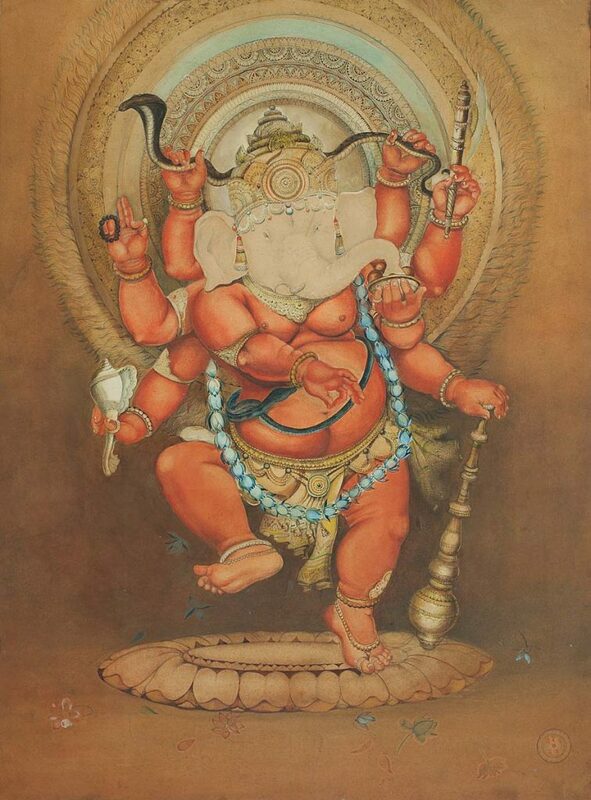 These include images of the female goddess, the most popular of whom is Durga, as imagined and portrayed by such modernist masters as Bikash Bhattacharjee, Ganesh Pyne, M. F. Husain, K. K. Hebbar, as well as several renditions of popular male deities, such as Krishna and Ganesha, by artists such as Rabin Mondal and P. V. Janakiram. 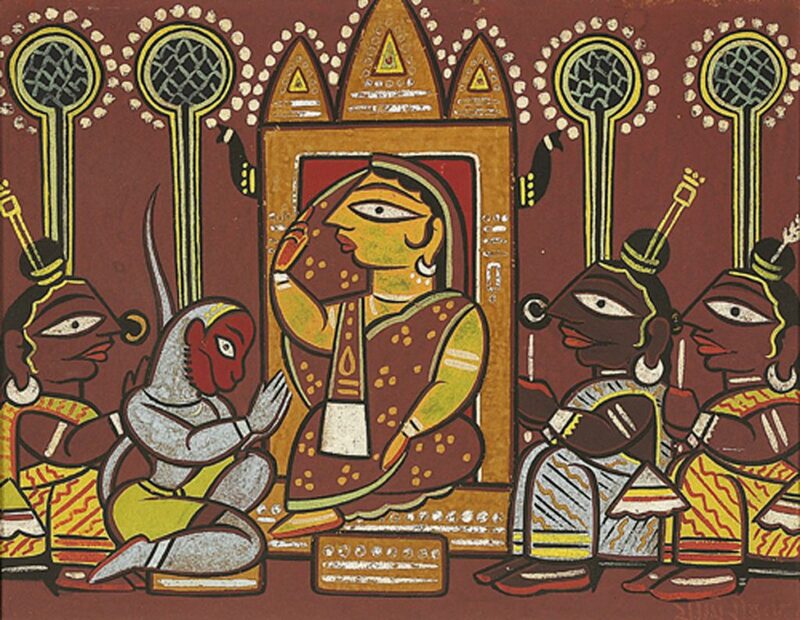 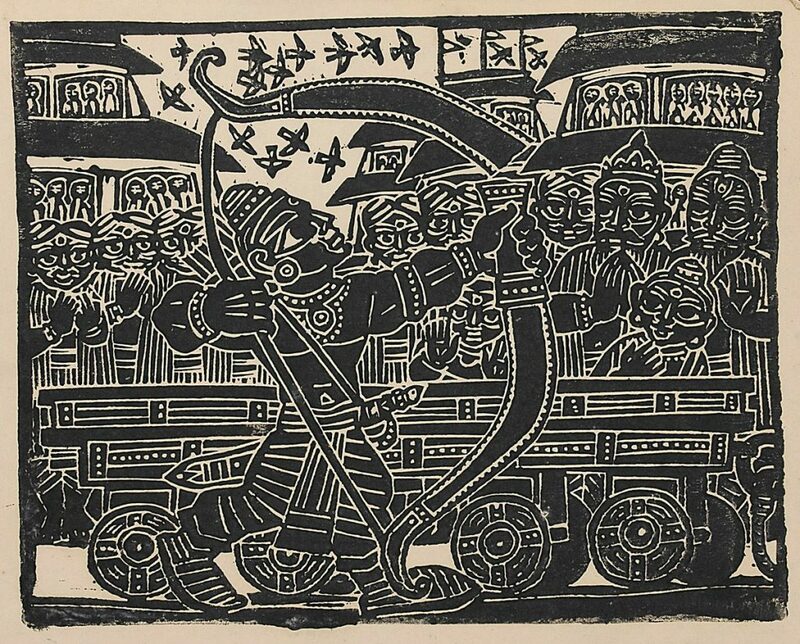 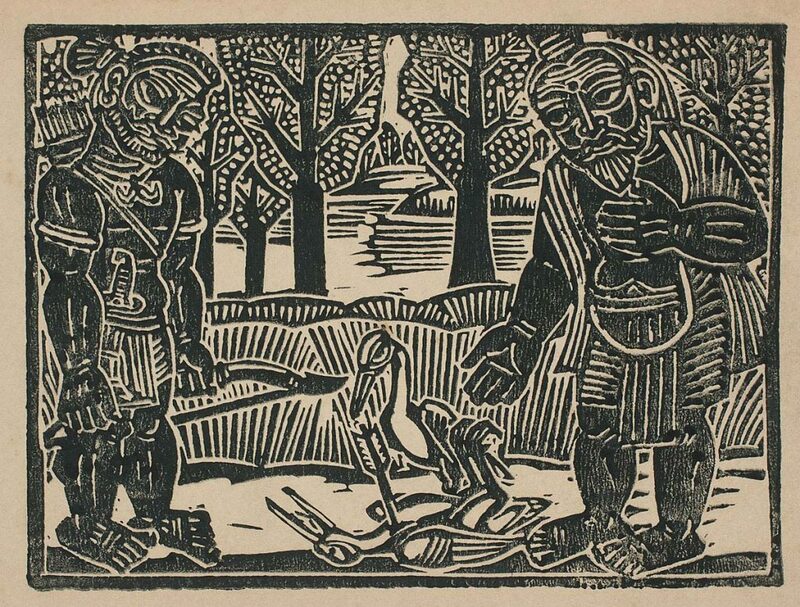 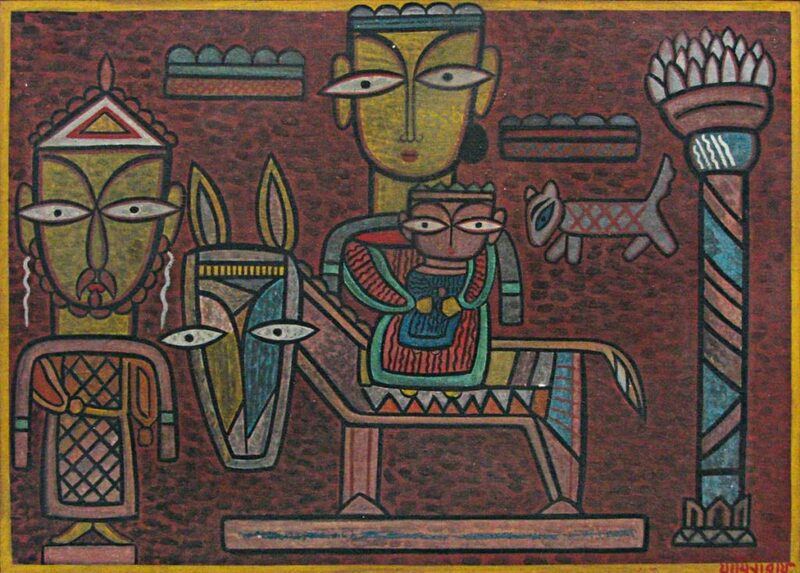 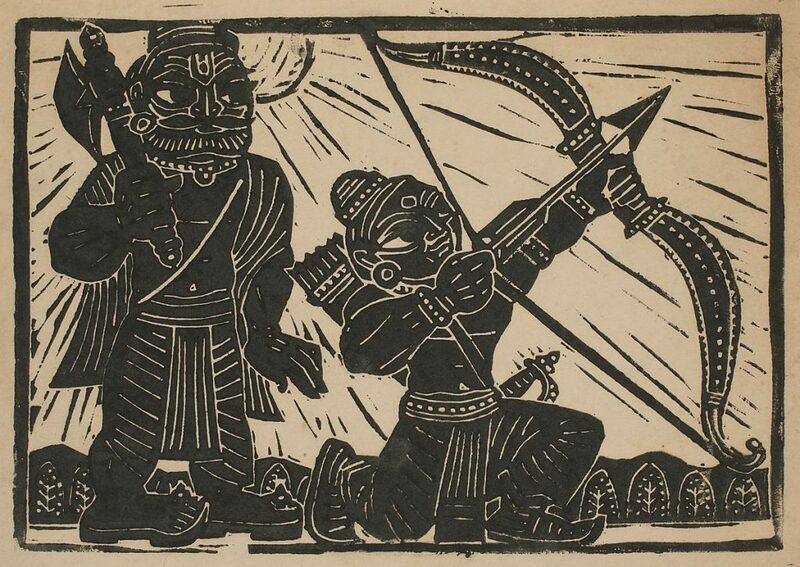 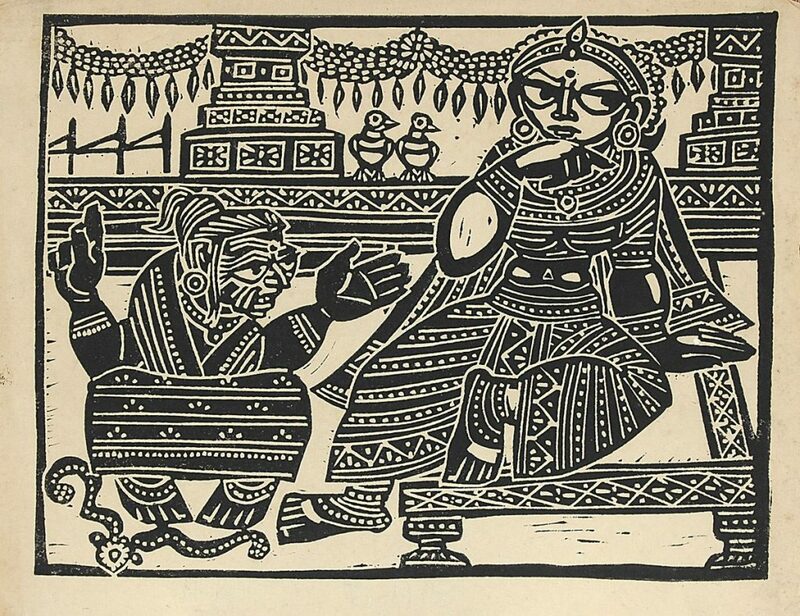 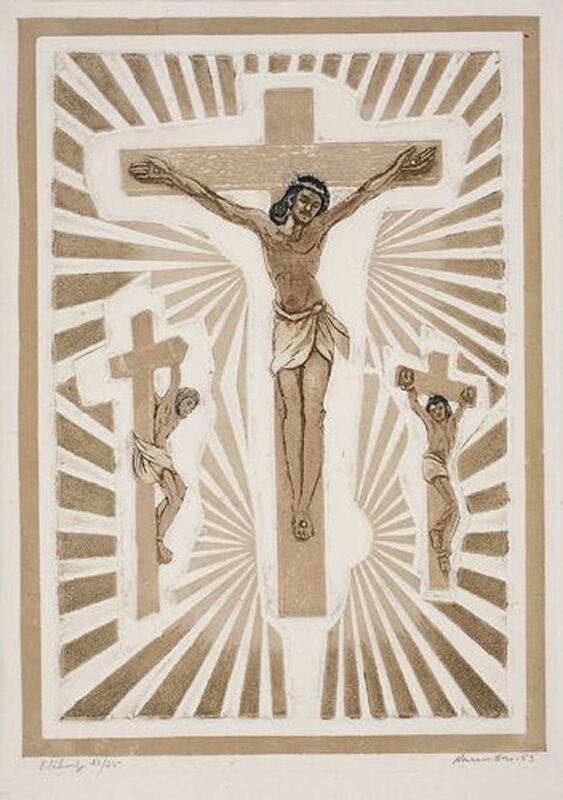 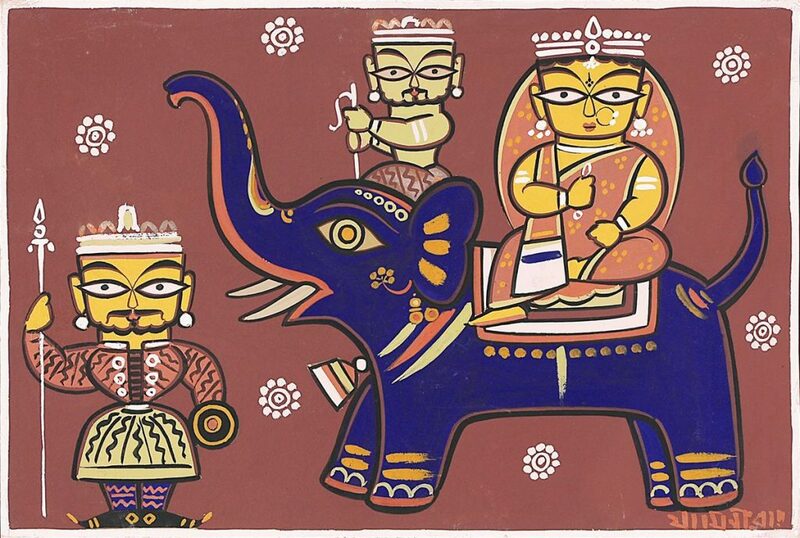 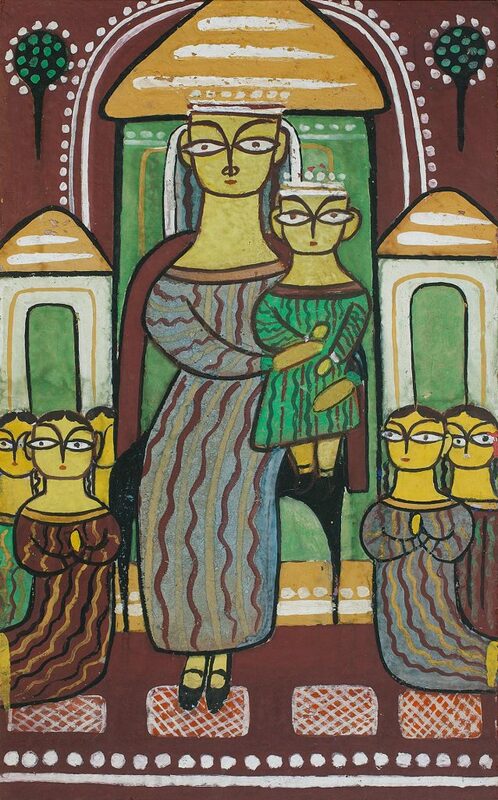 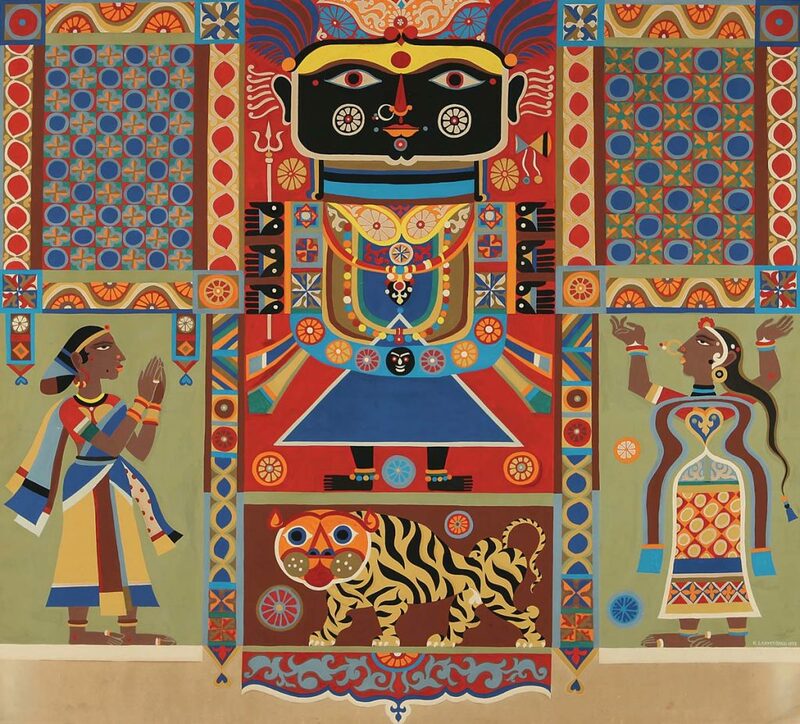 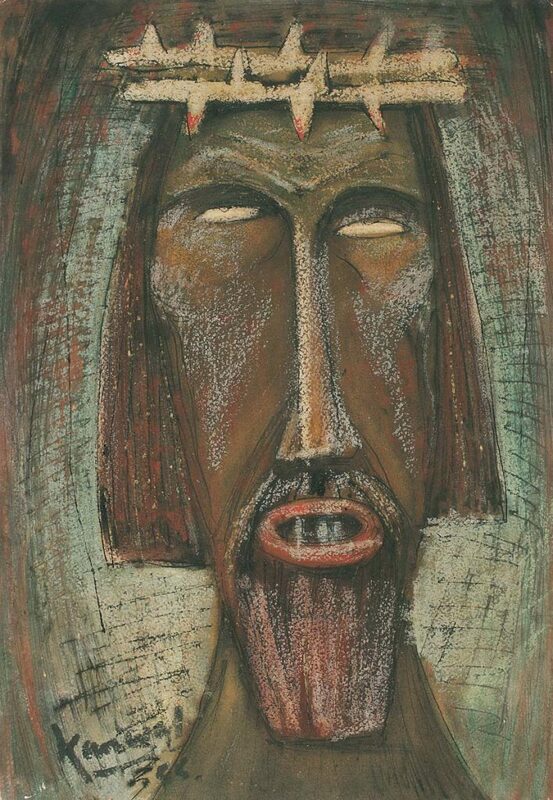 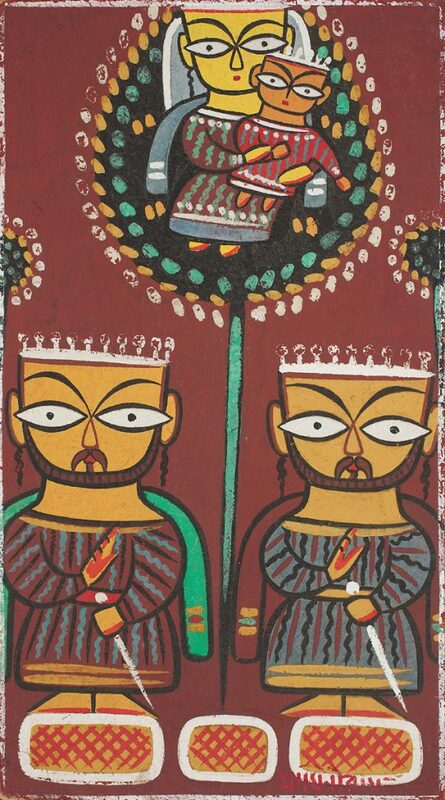 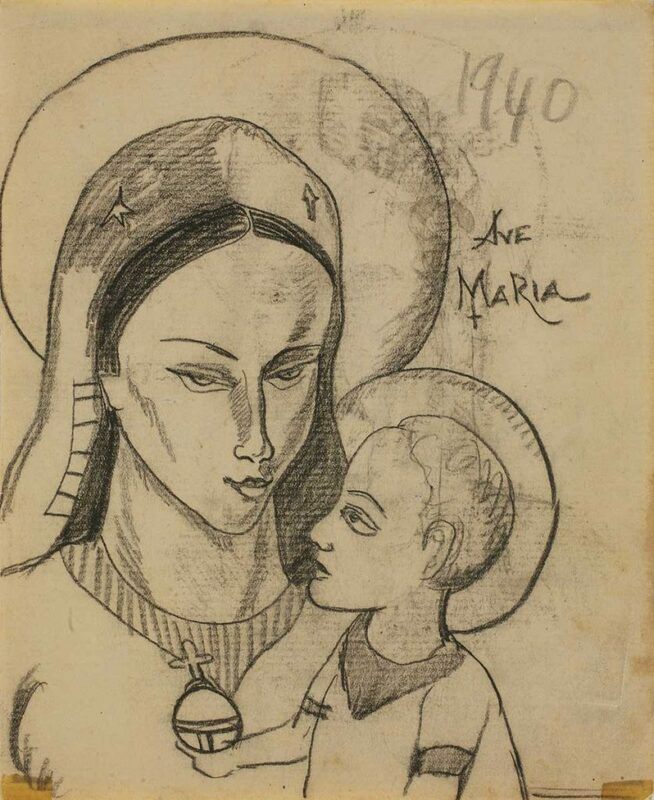 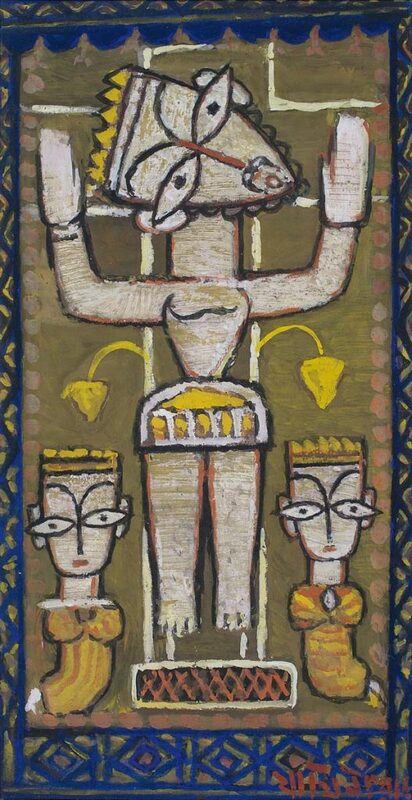 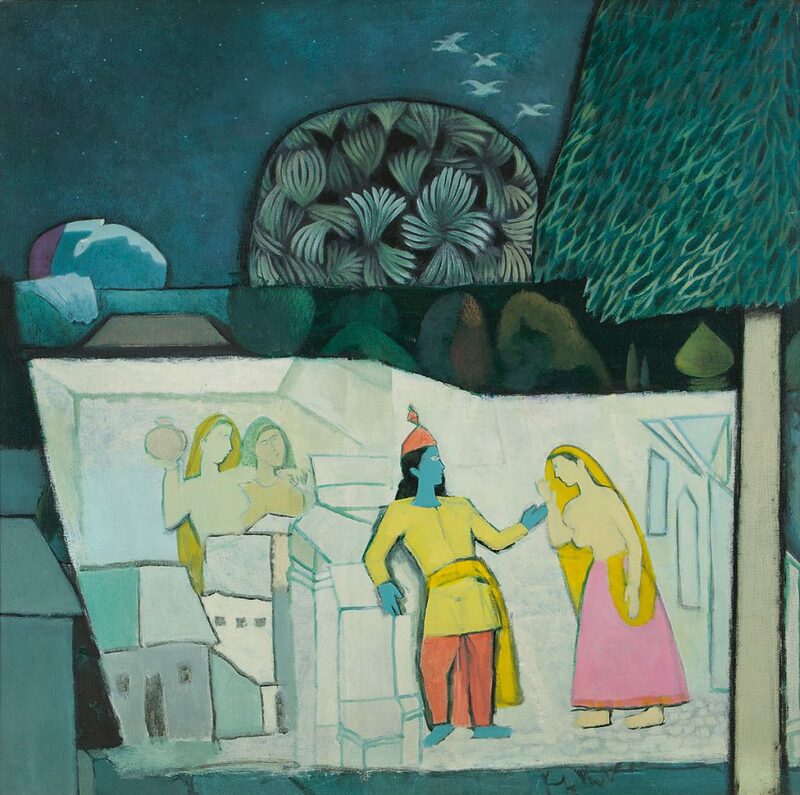 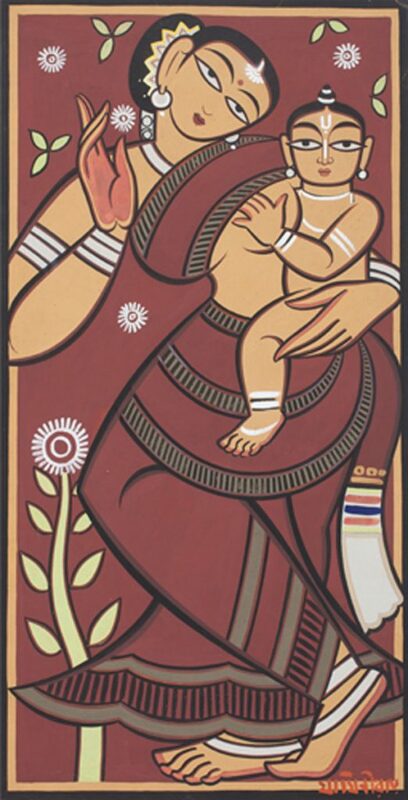 The exhibition features a number of works on Christian themes and imagery, led by the first Indian artist to have explored the theme, Jamini Roy. 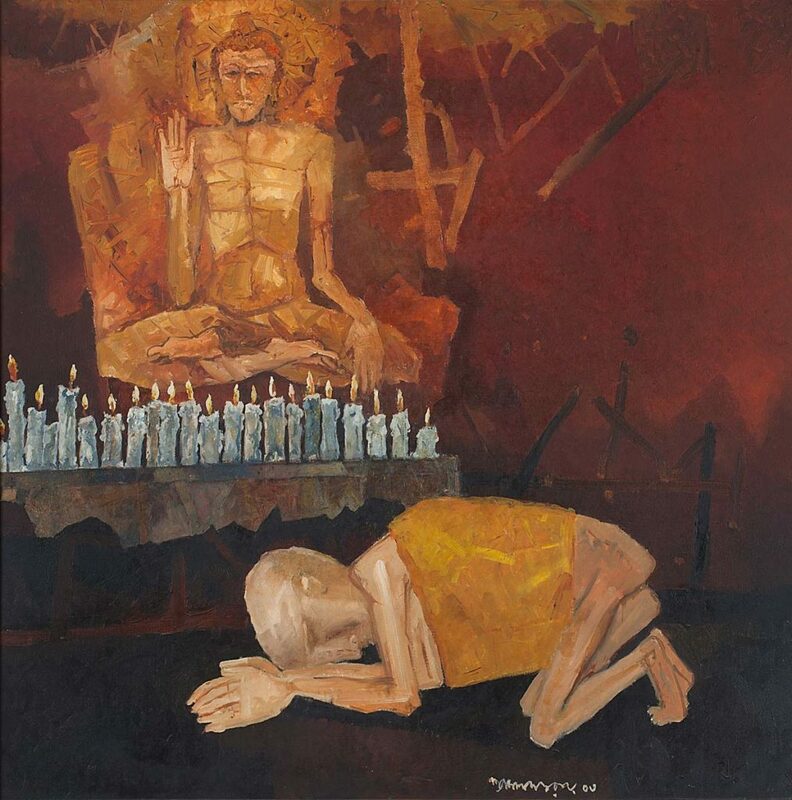 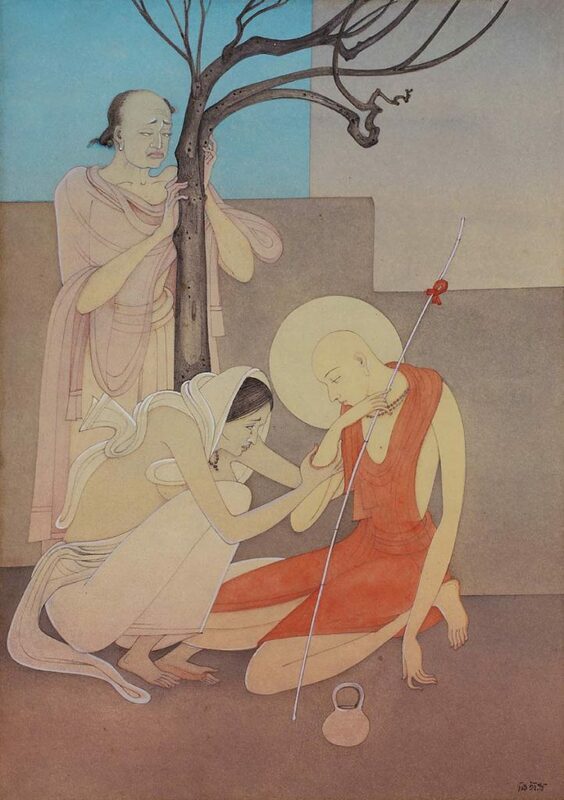 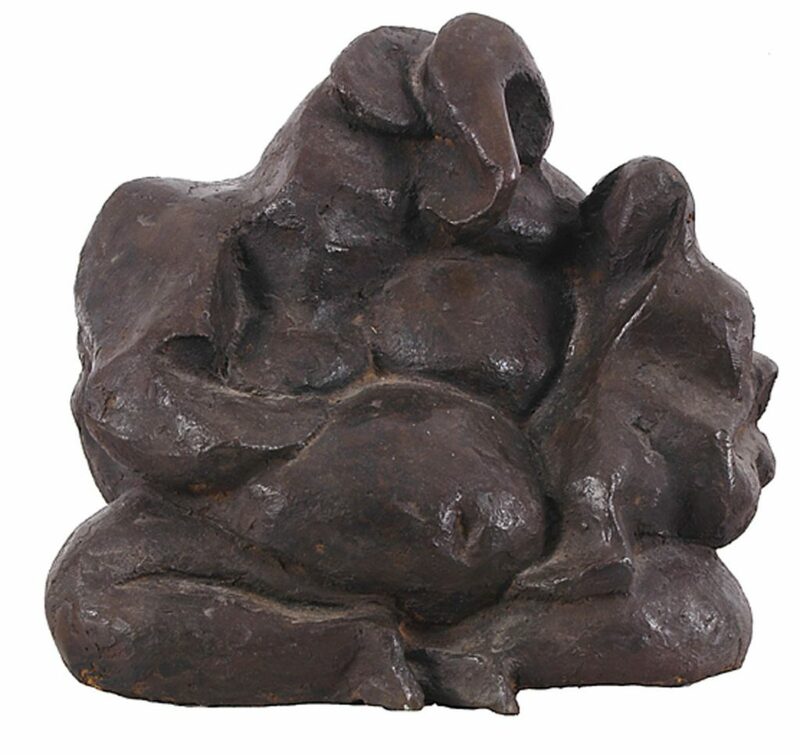 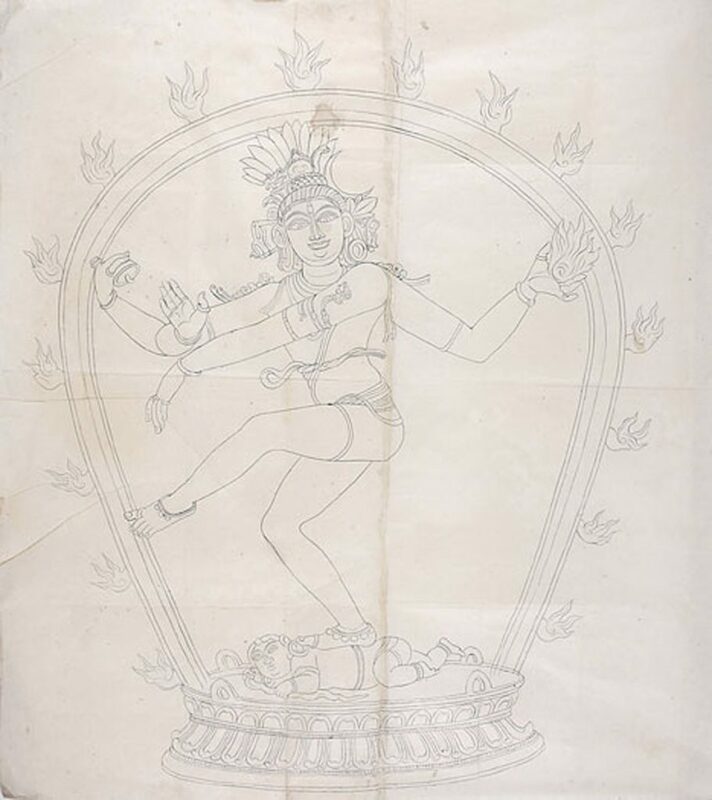 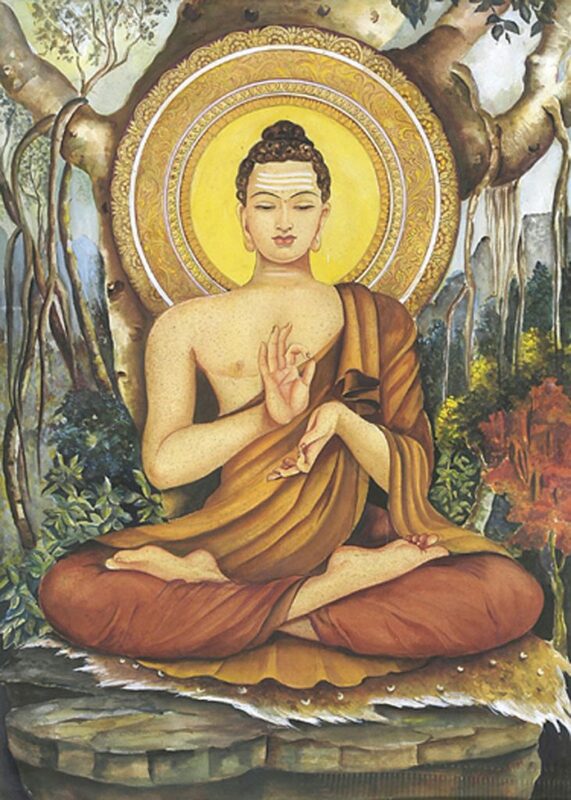 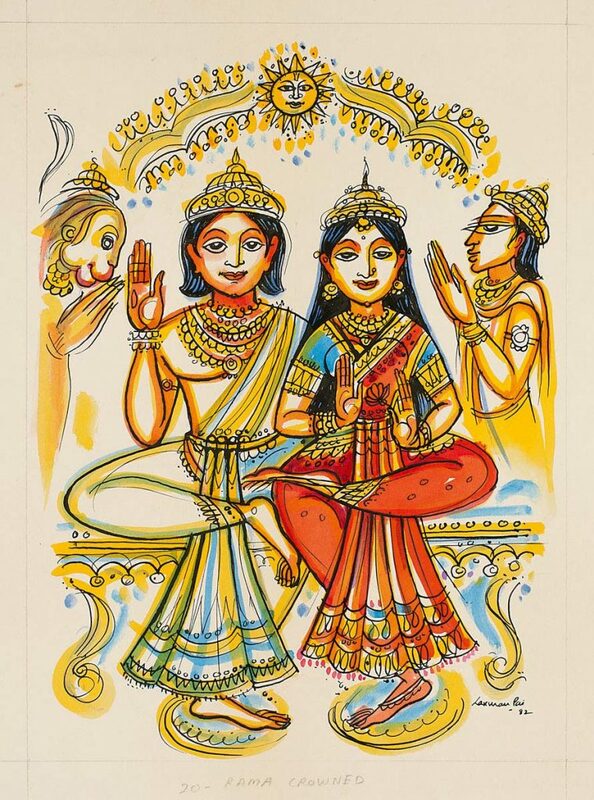 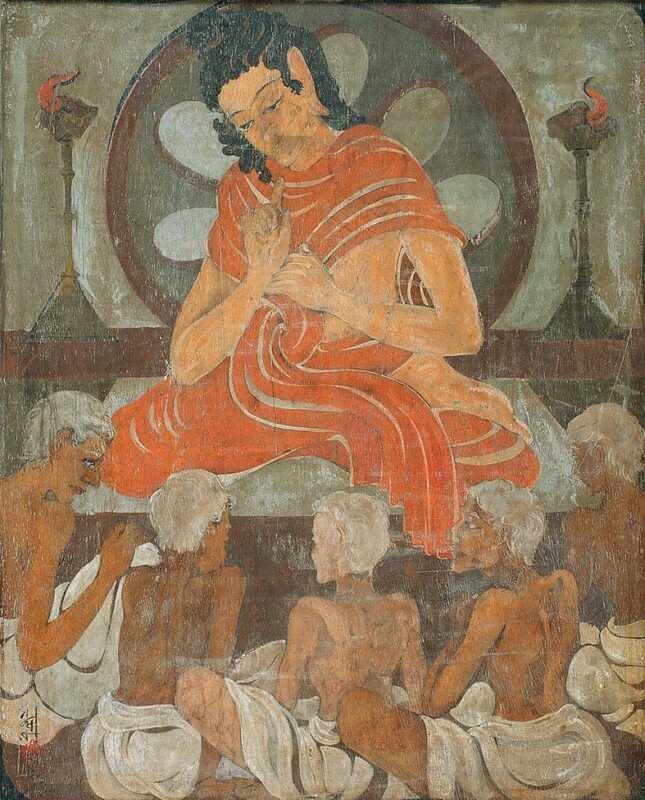 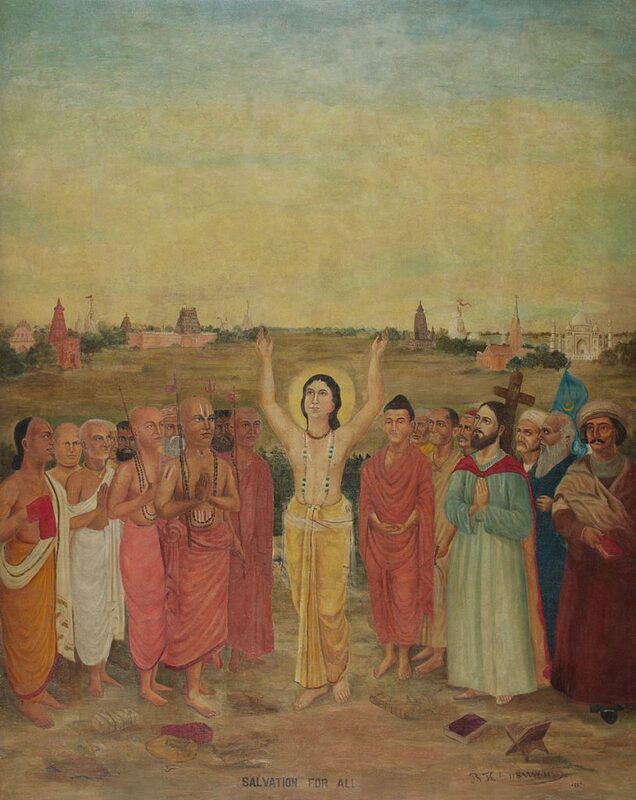 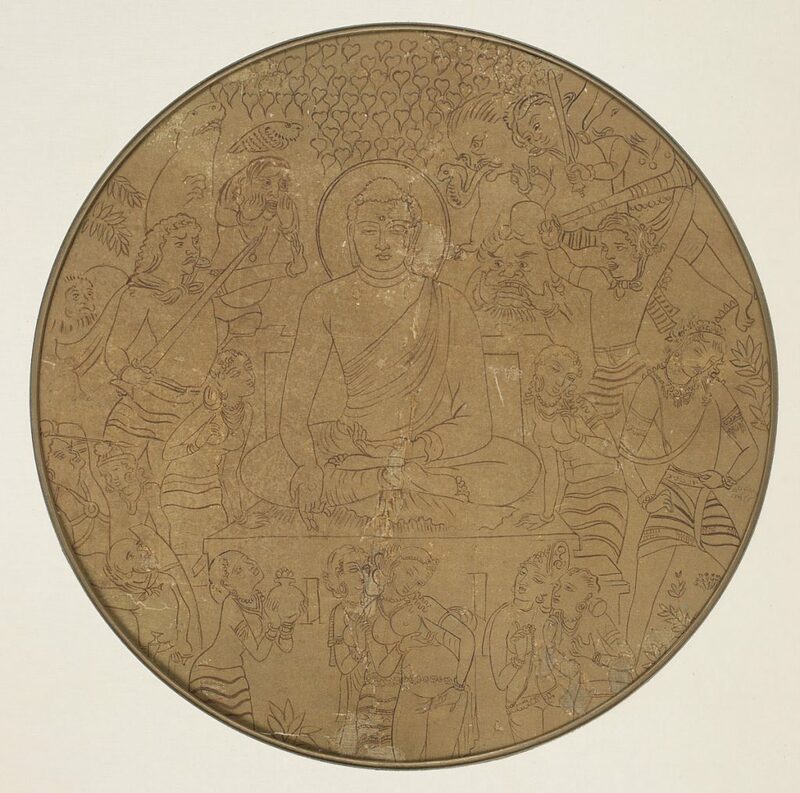 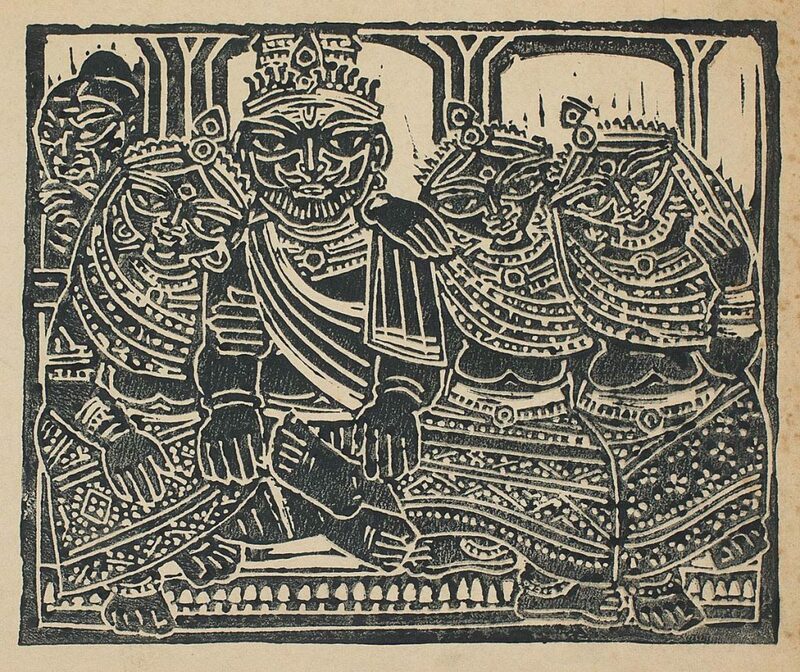 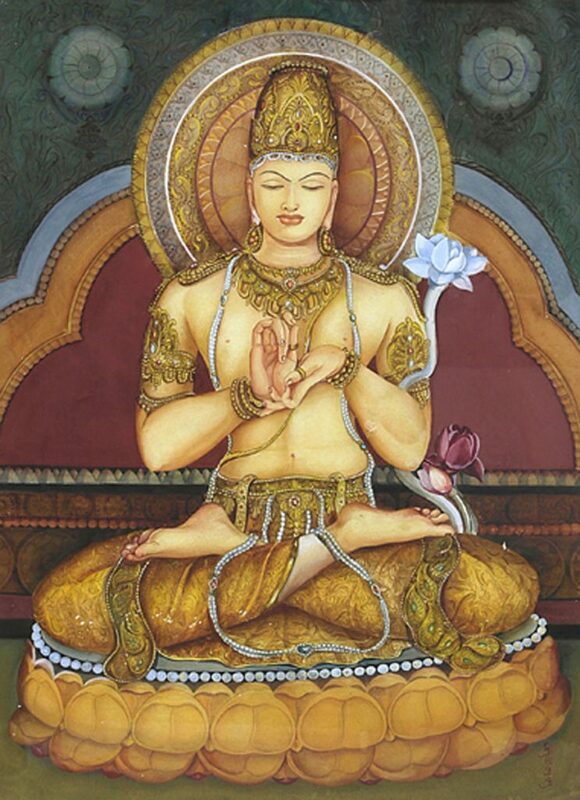 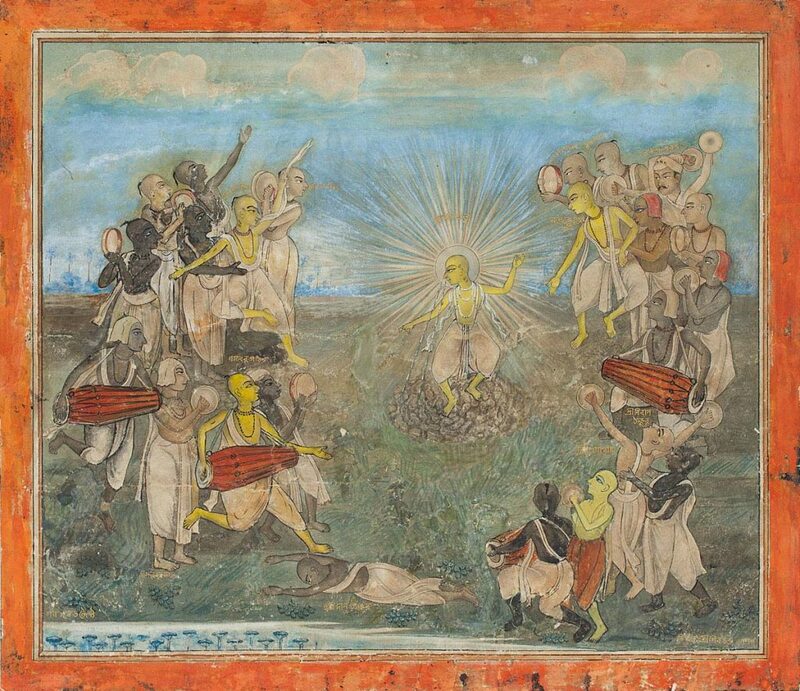 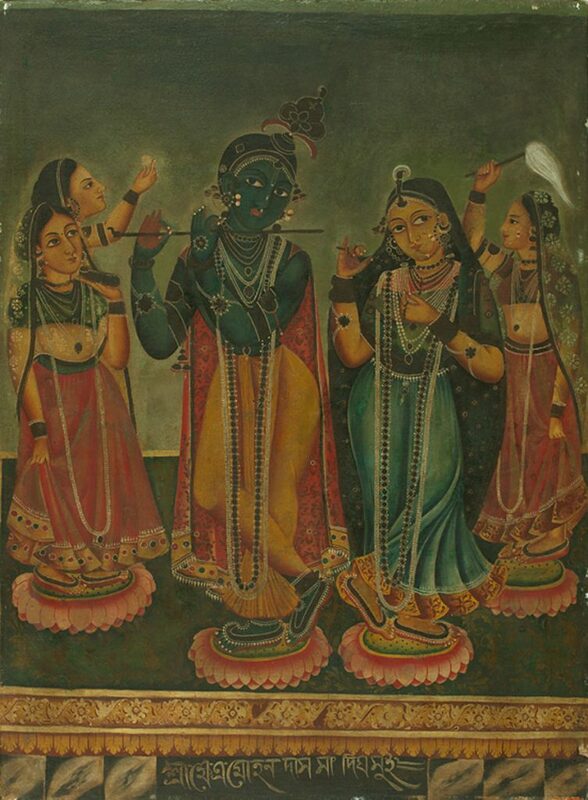 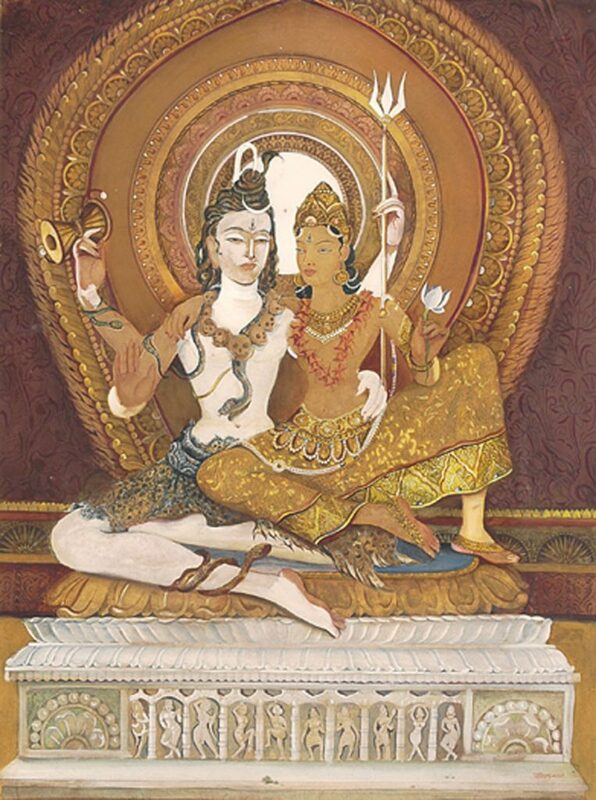 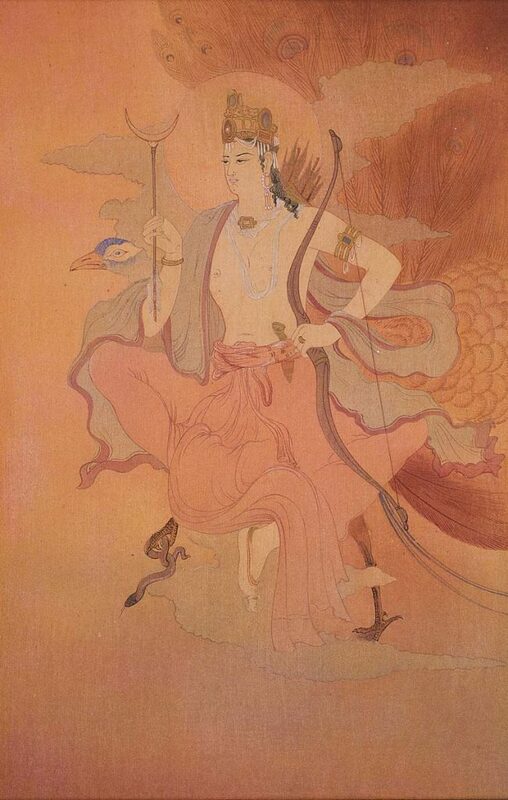 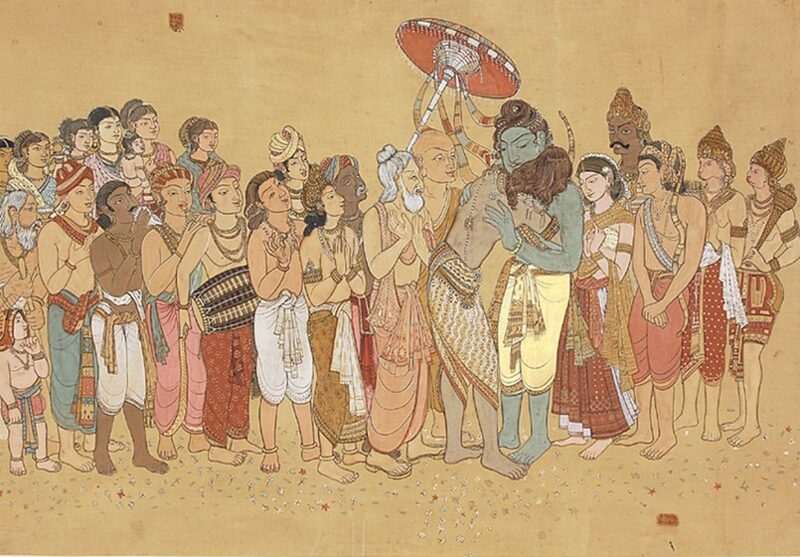 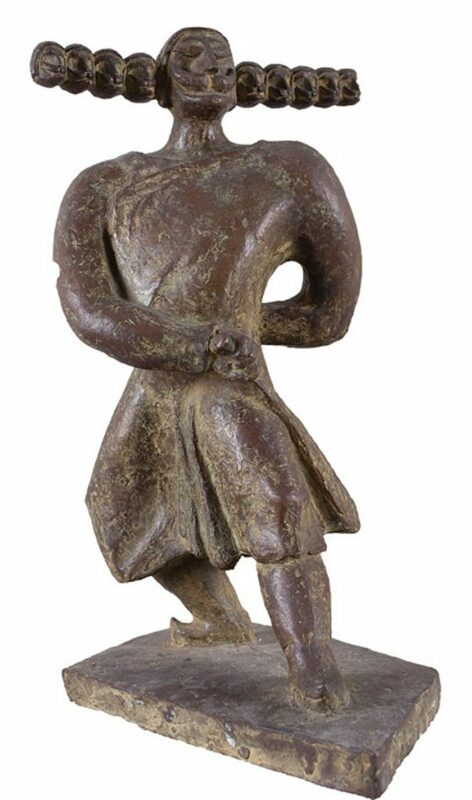 Heis followed by well-known artists such as Krishen Khanna, F. N. Souza, Madhvi Parekh, Kanwal Krishna, S. Dhanapal, and V. Nageshkar, as well as a great number of works on Buddhist themes that span time and diverse art styles. 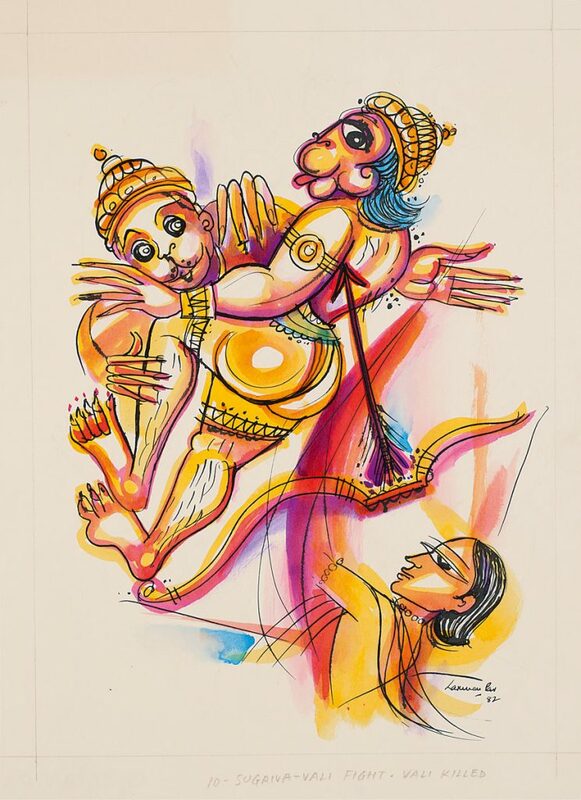 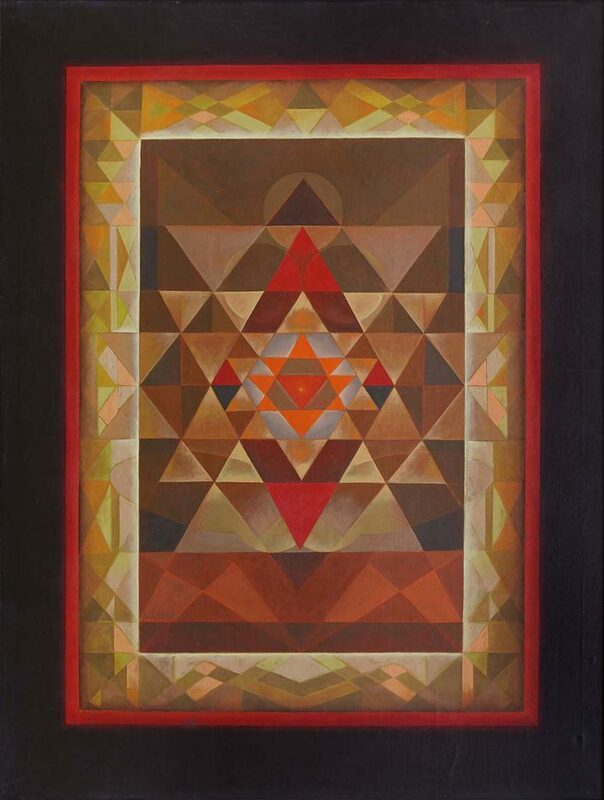 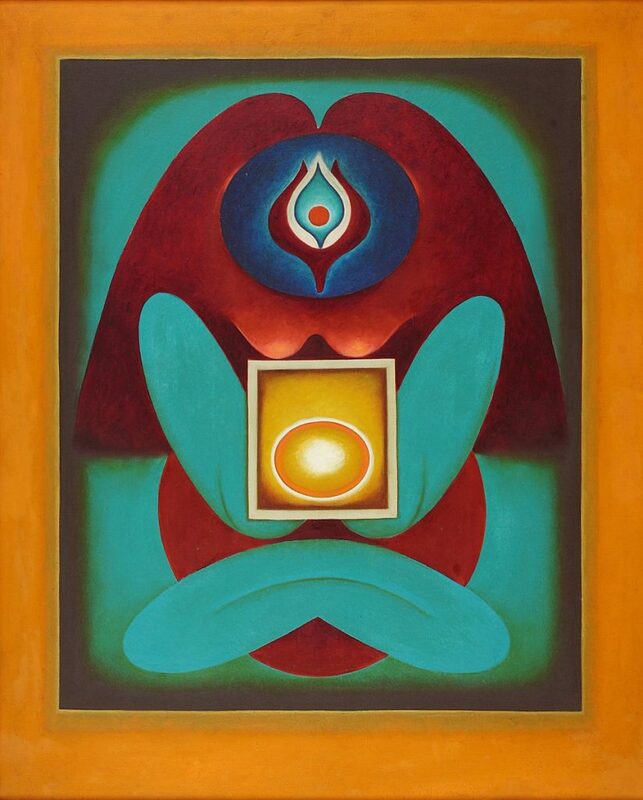 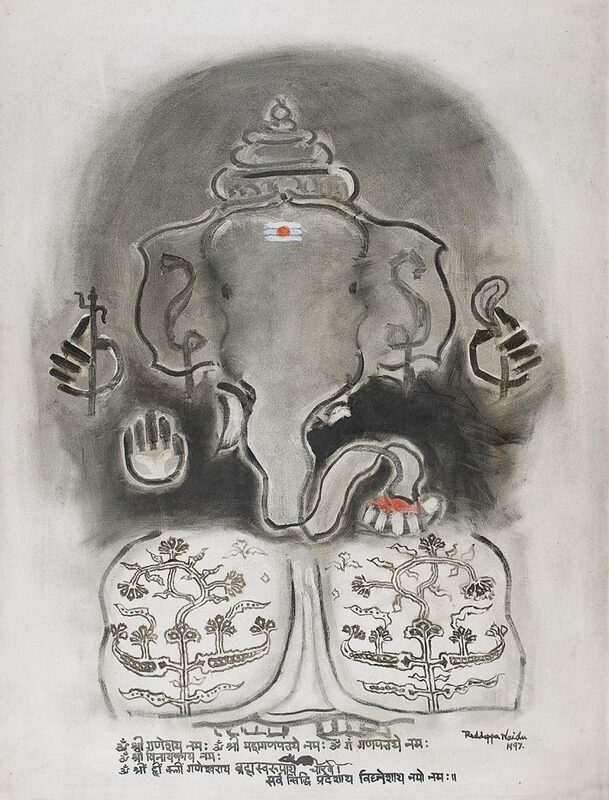 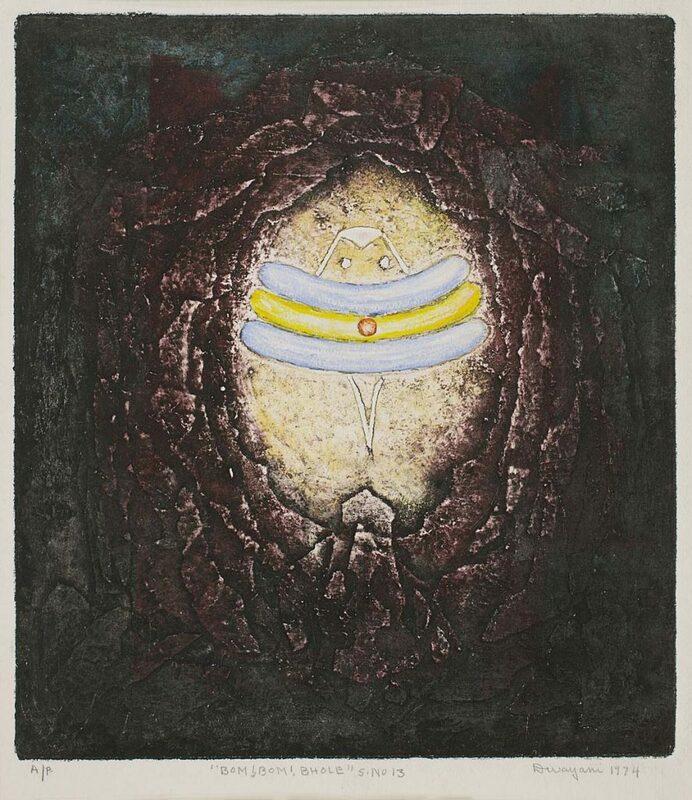 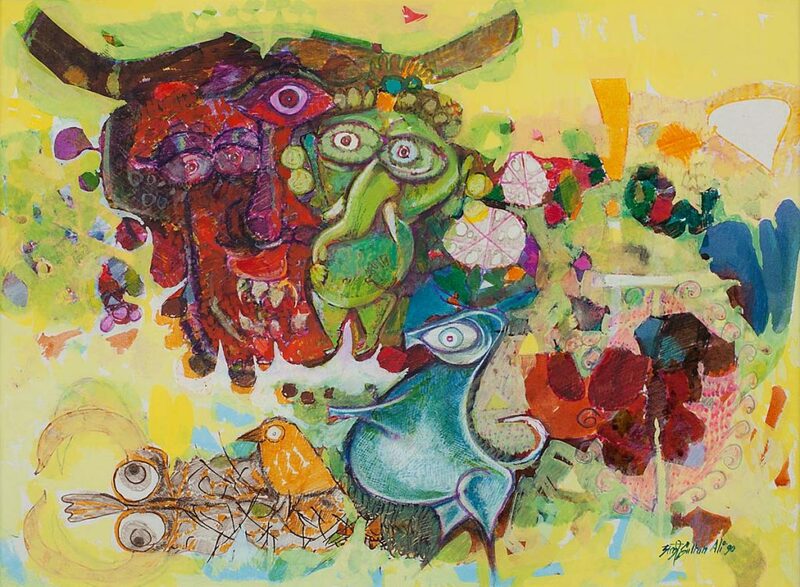 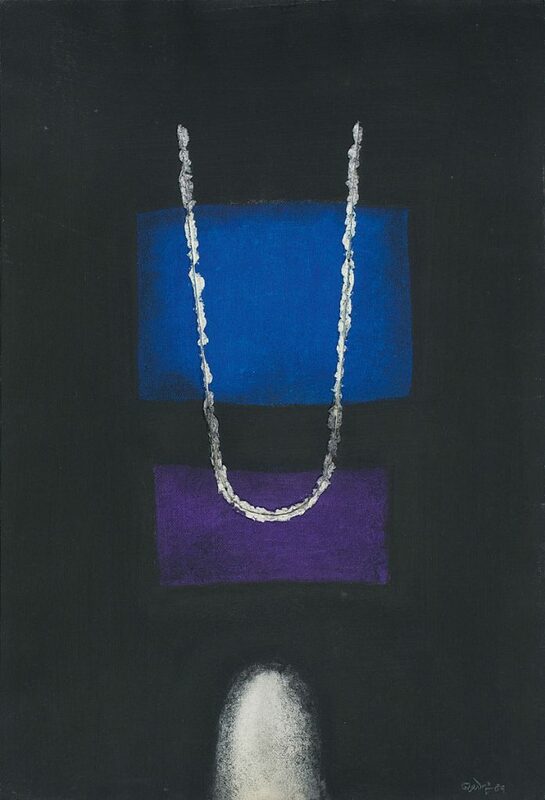 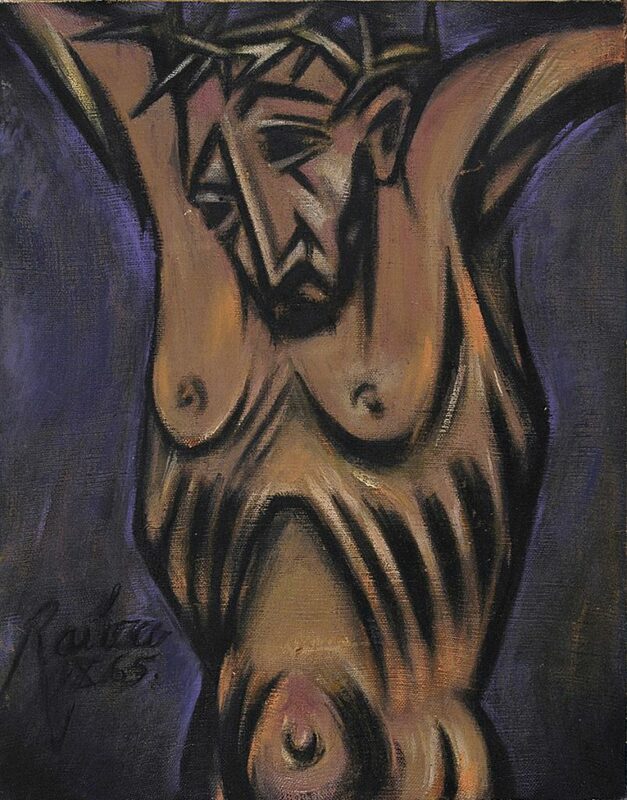 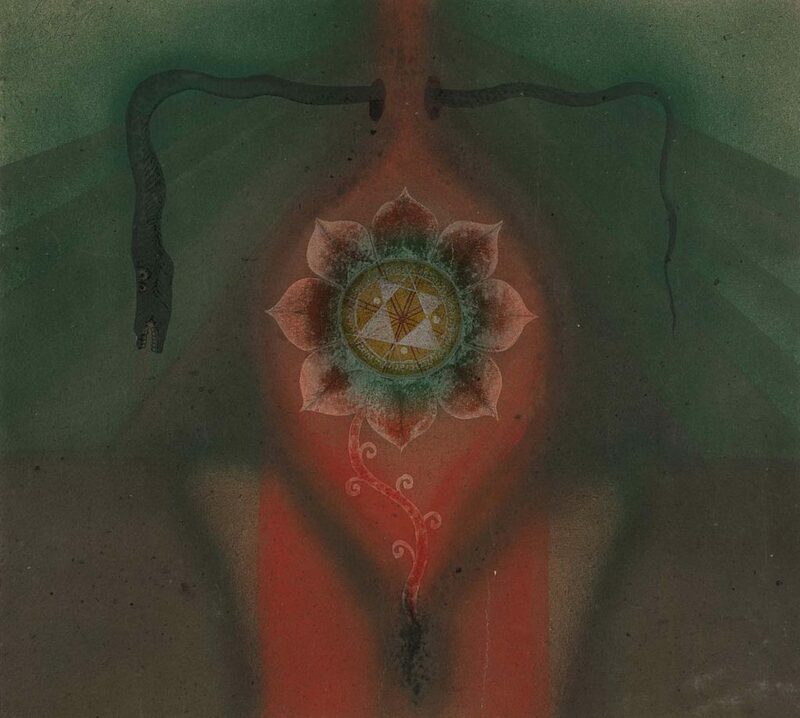 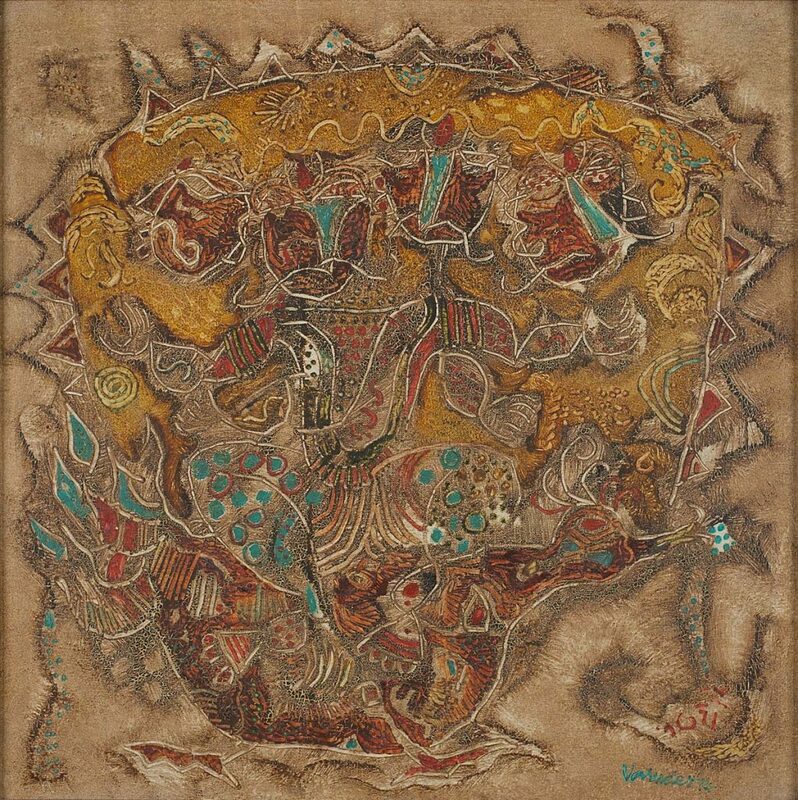 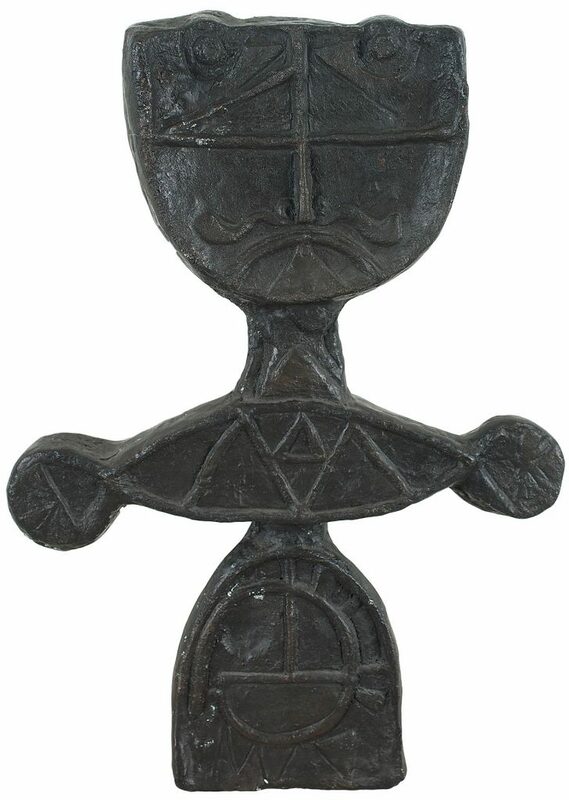 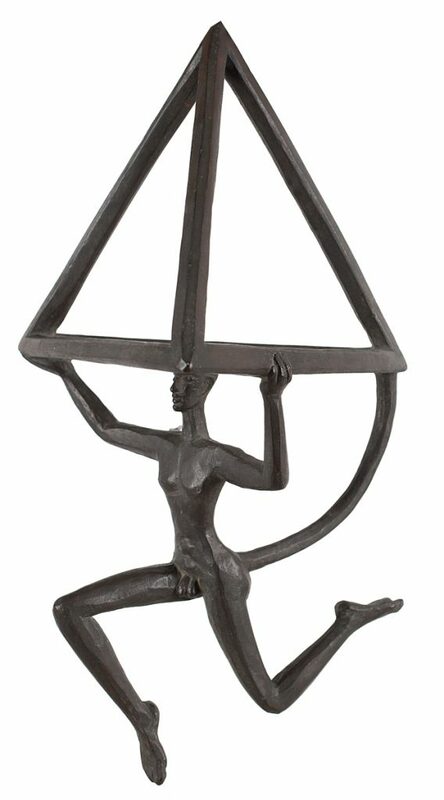 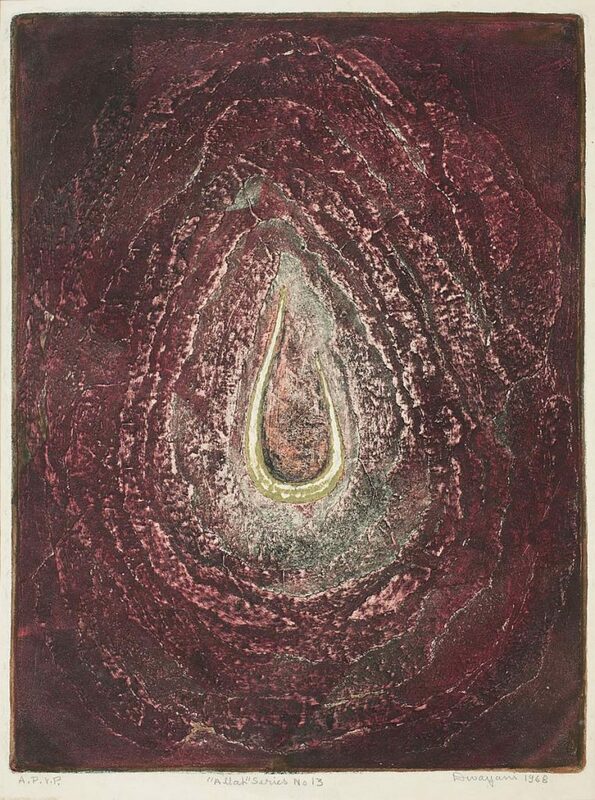 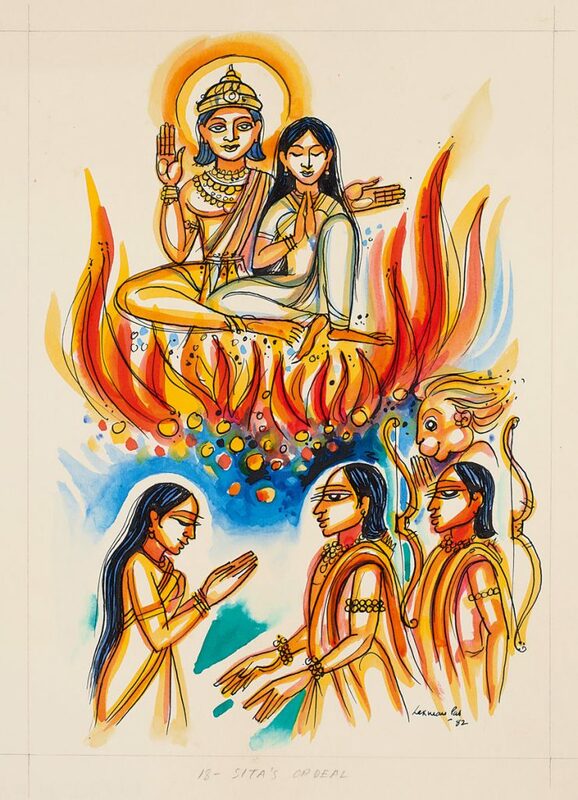 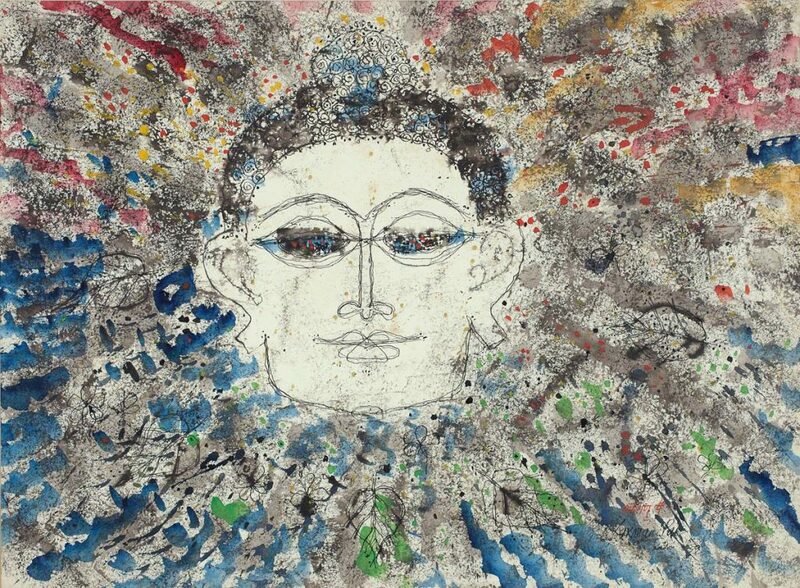 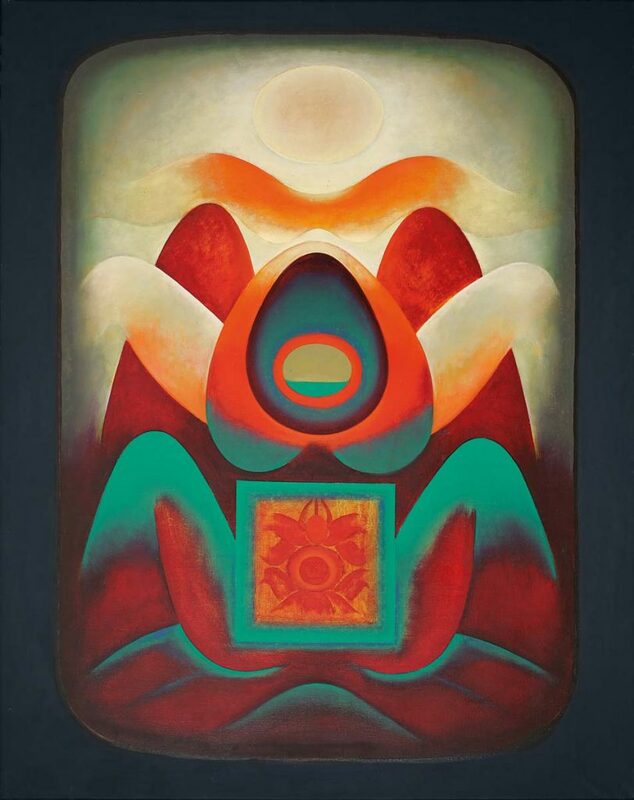 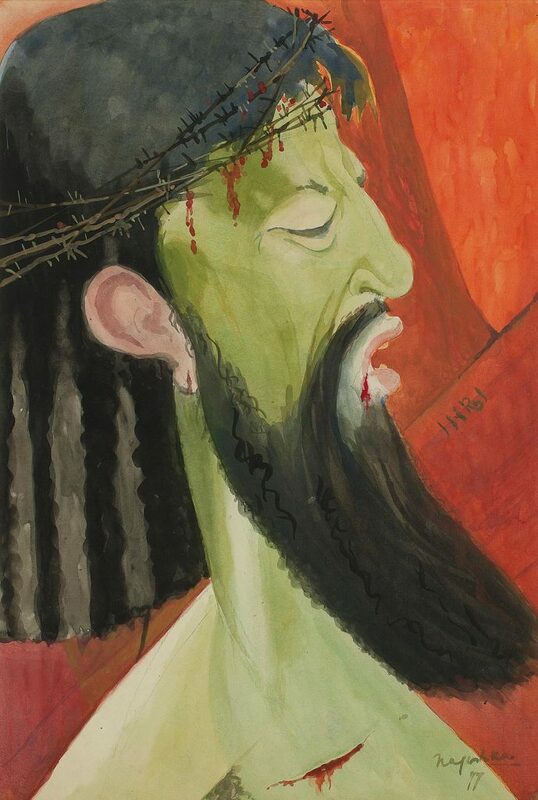 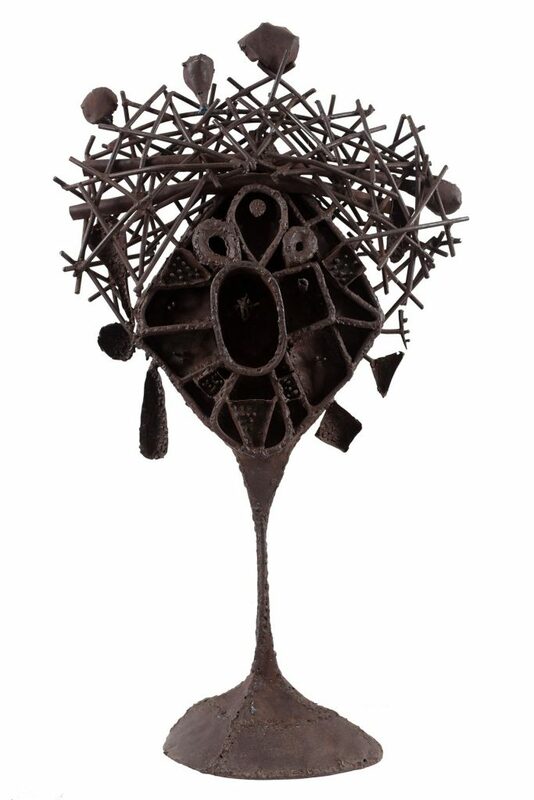 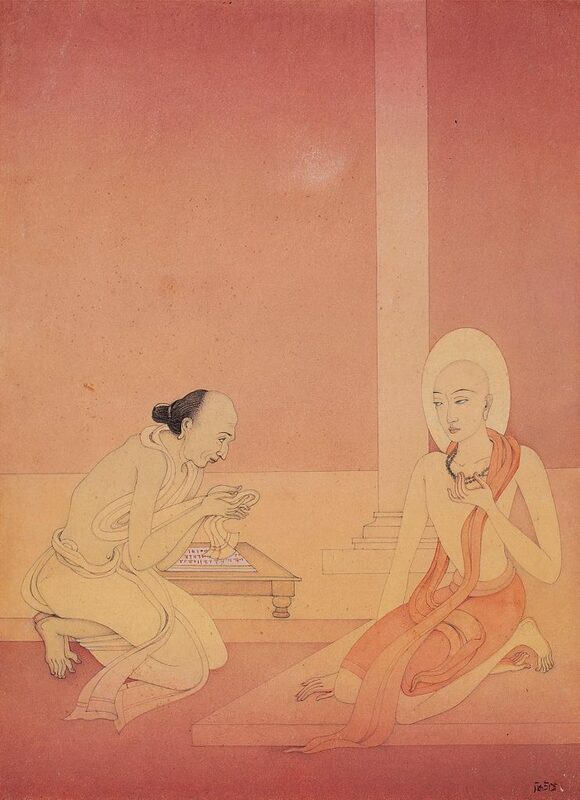 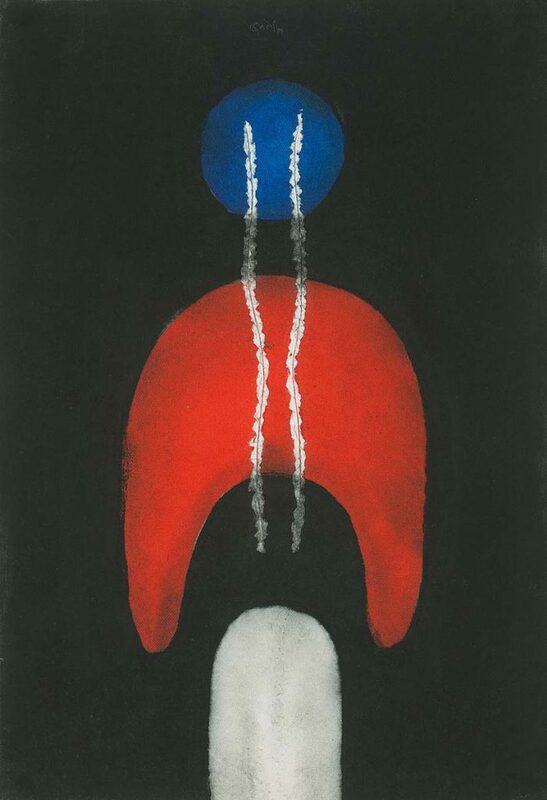 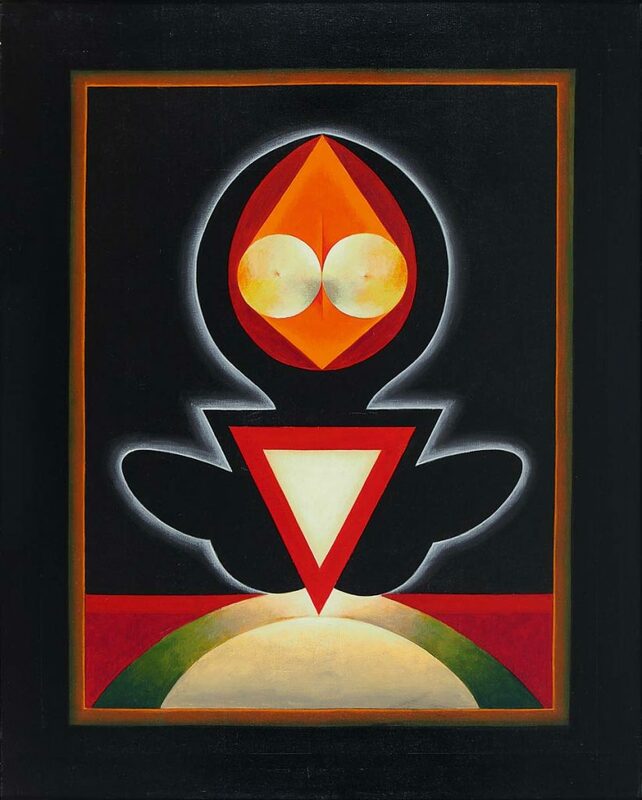 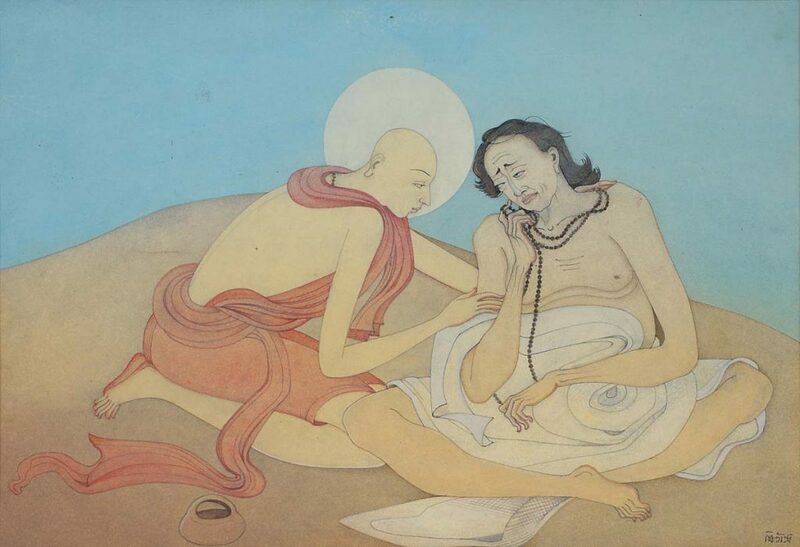 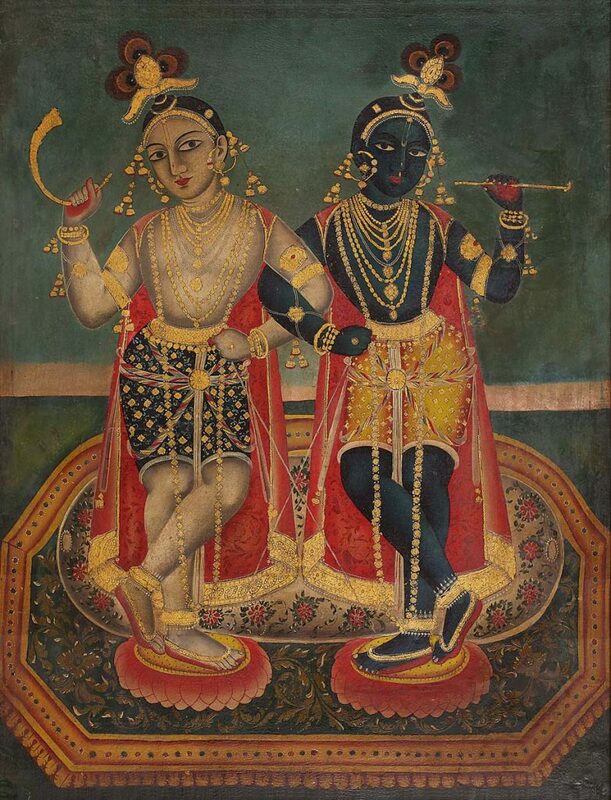 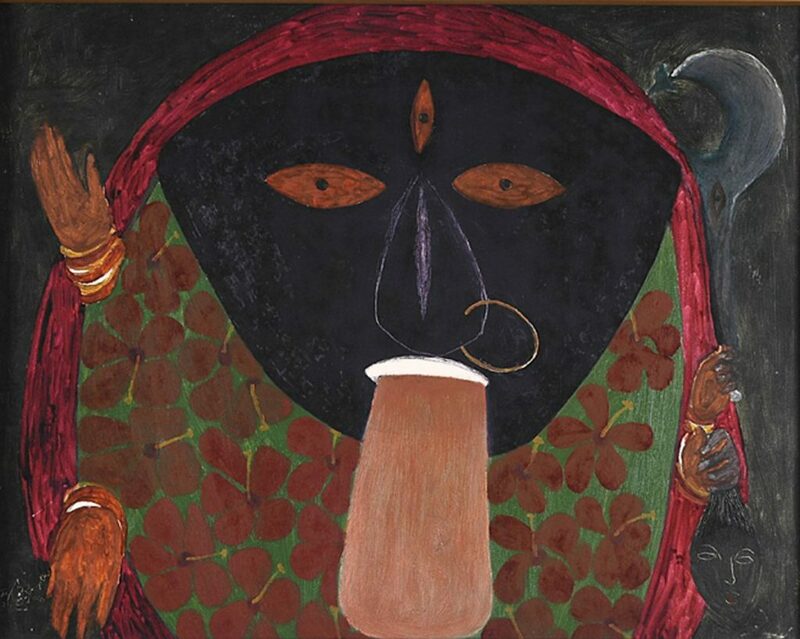 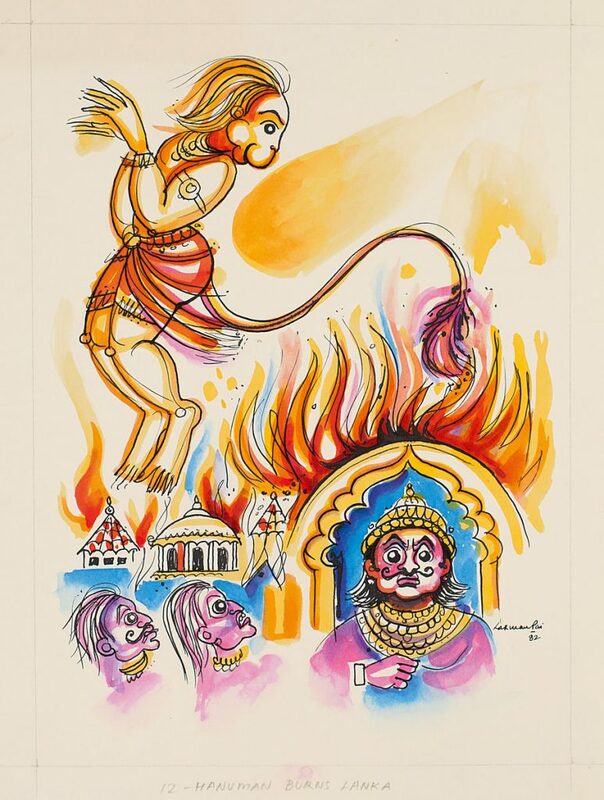 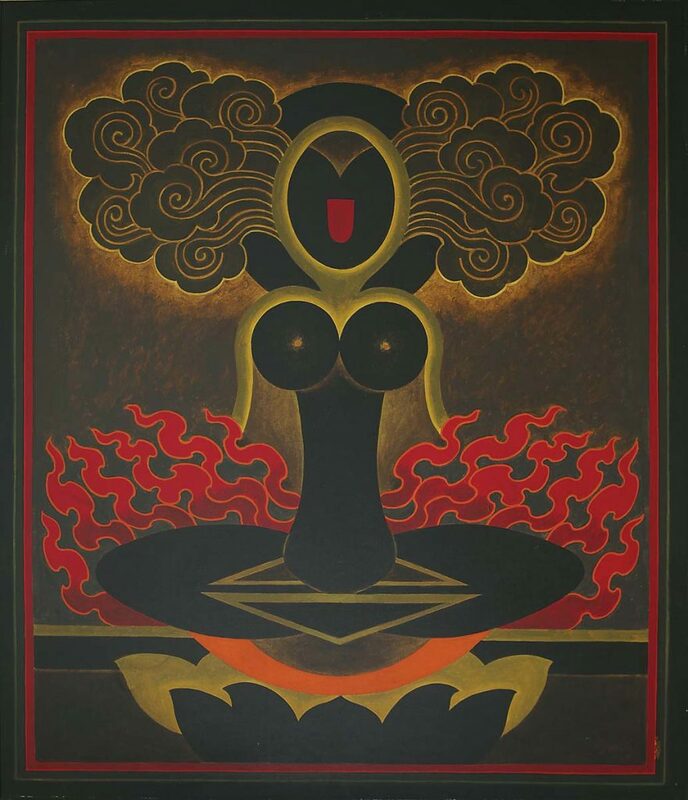 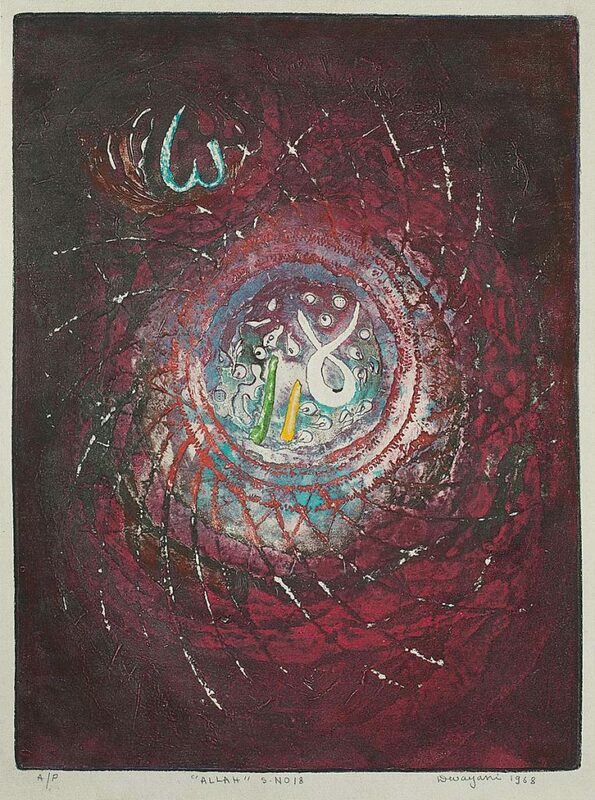 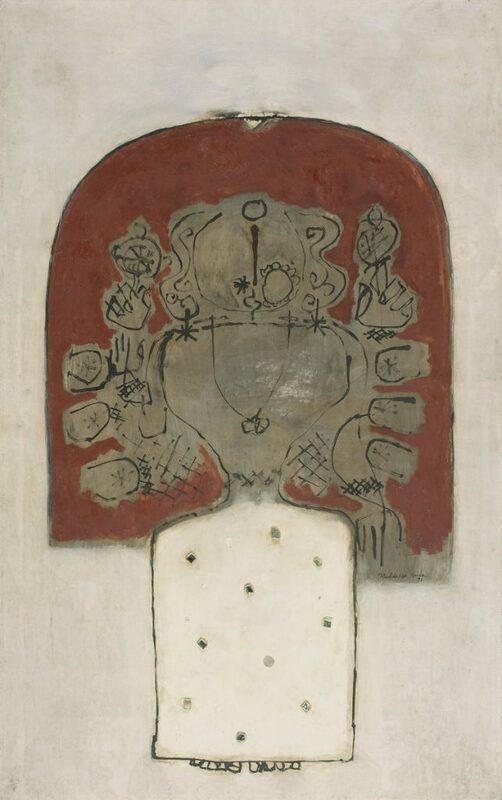 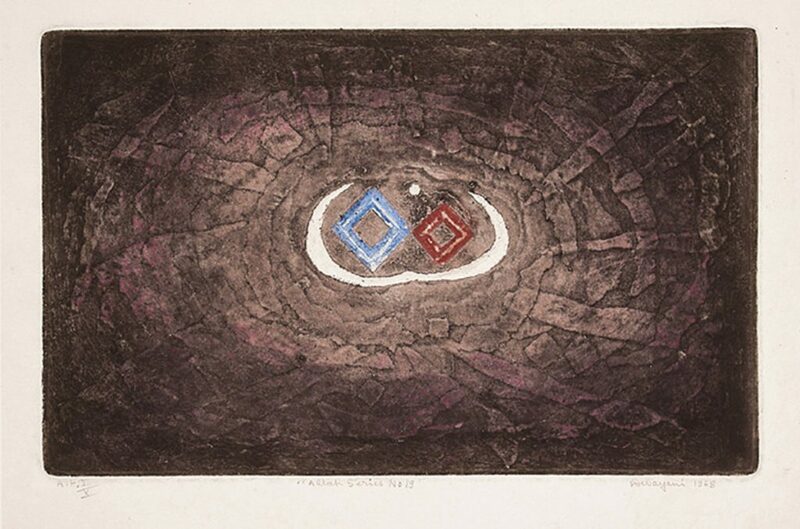 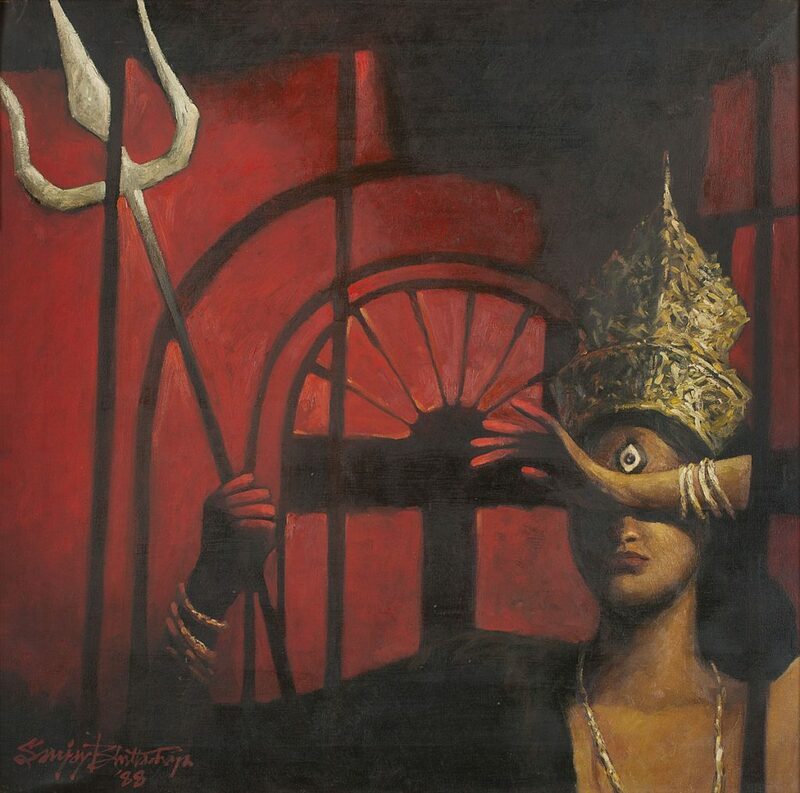 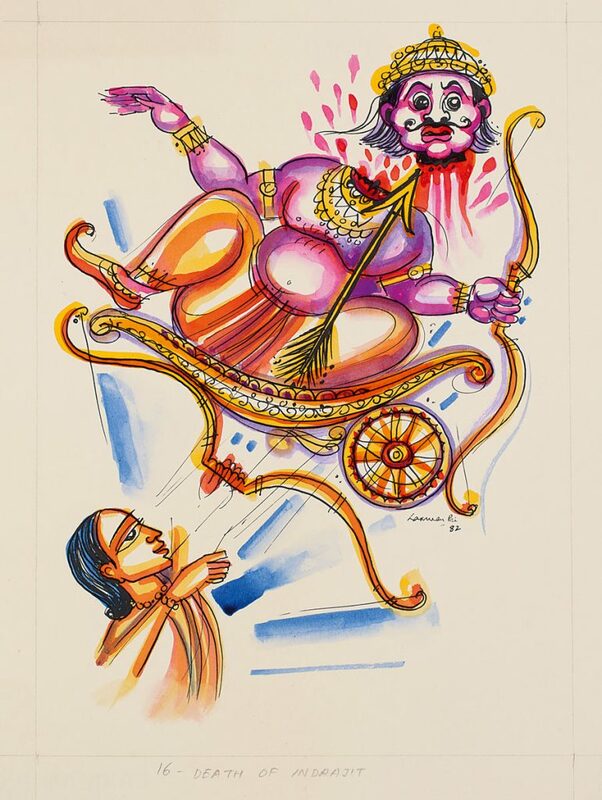 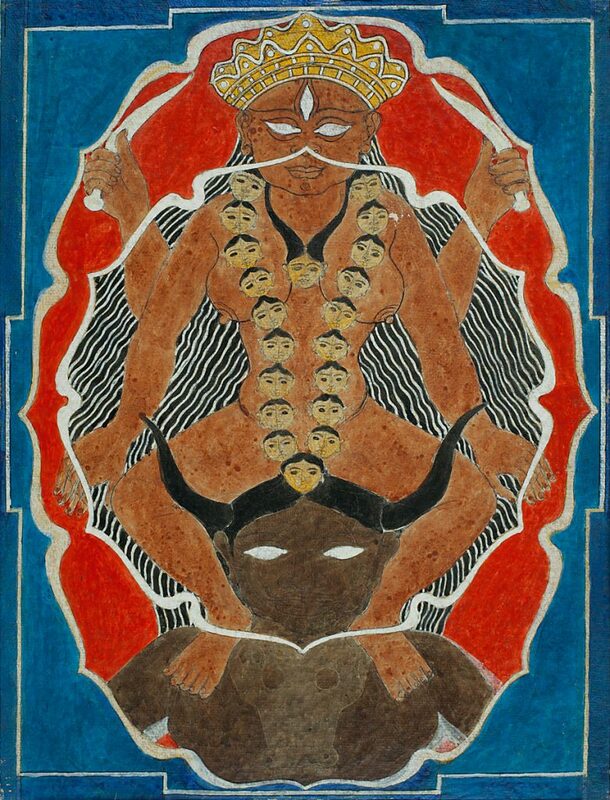 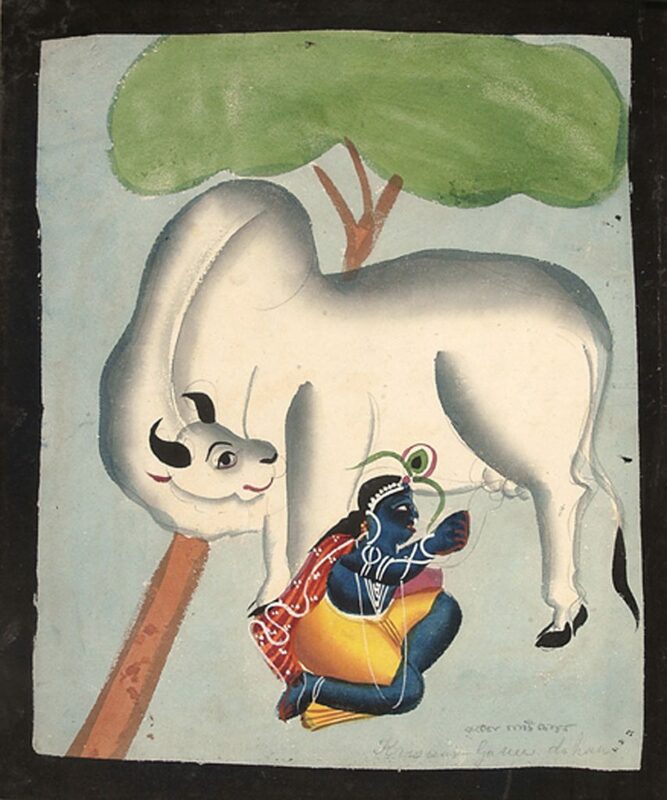 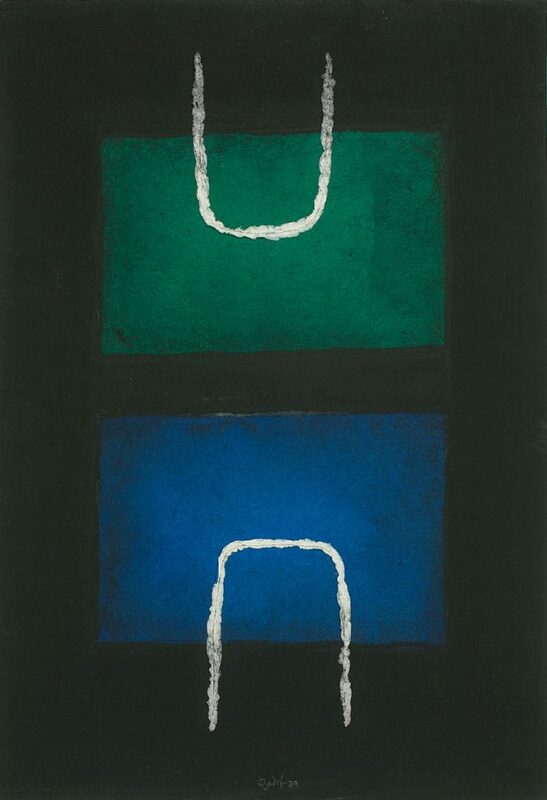 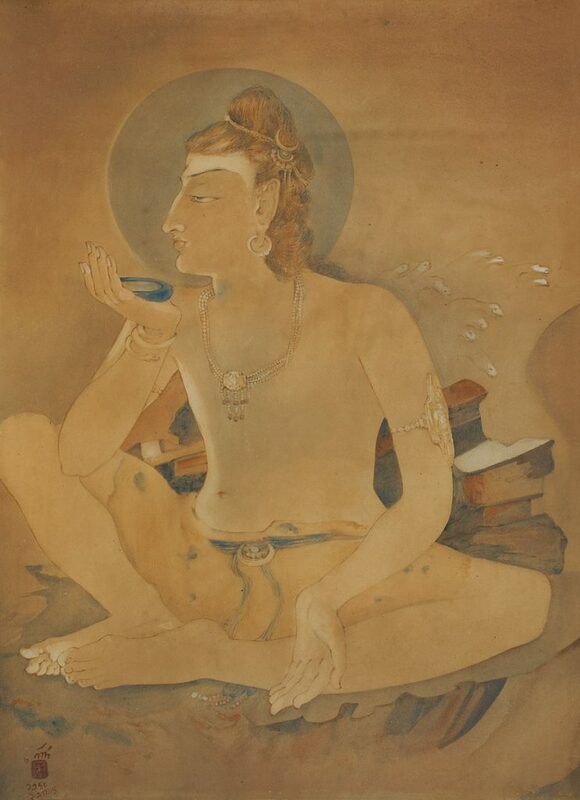 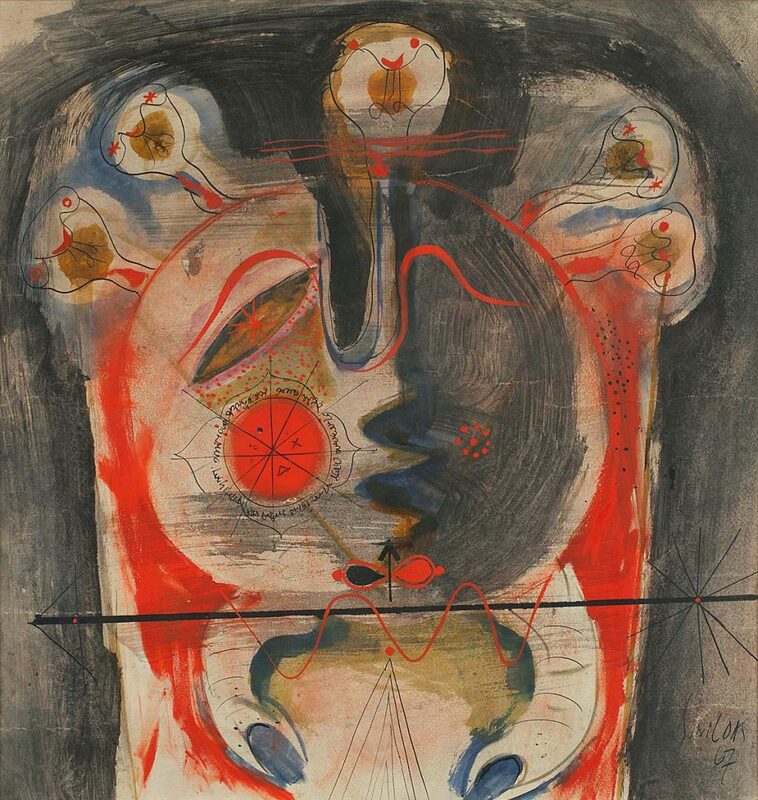 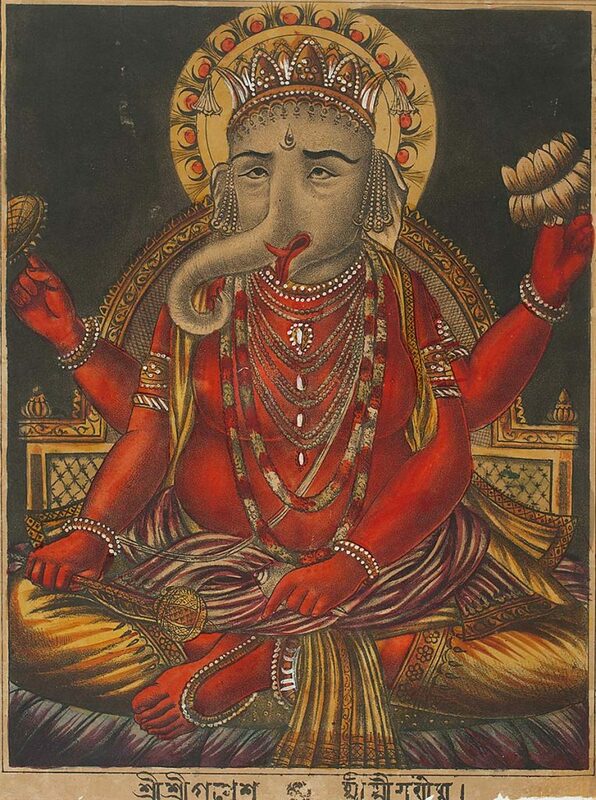 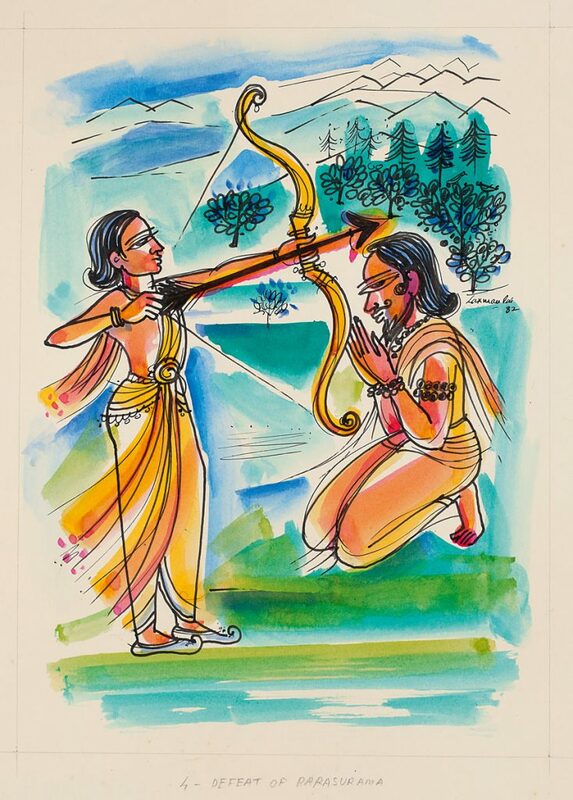 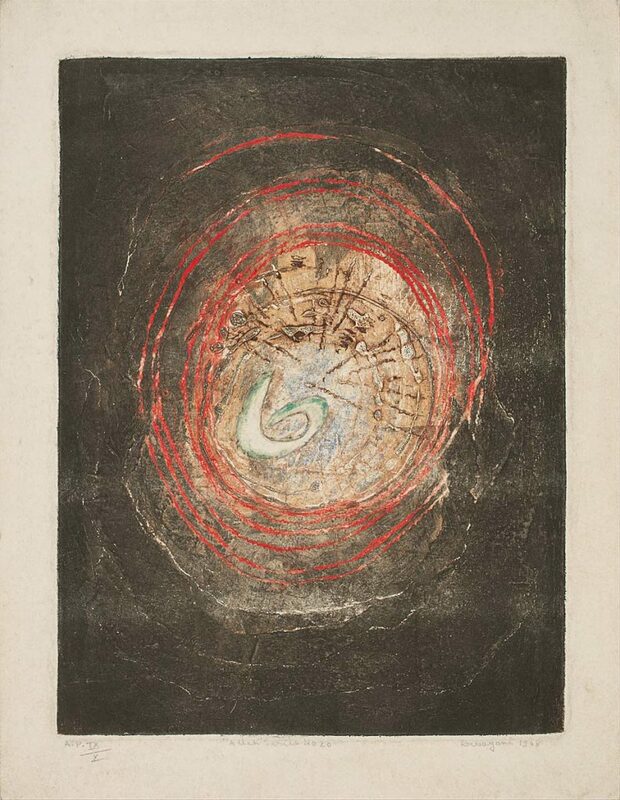 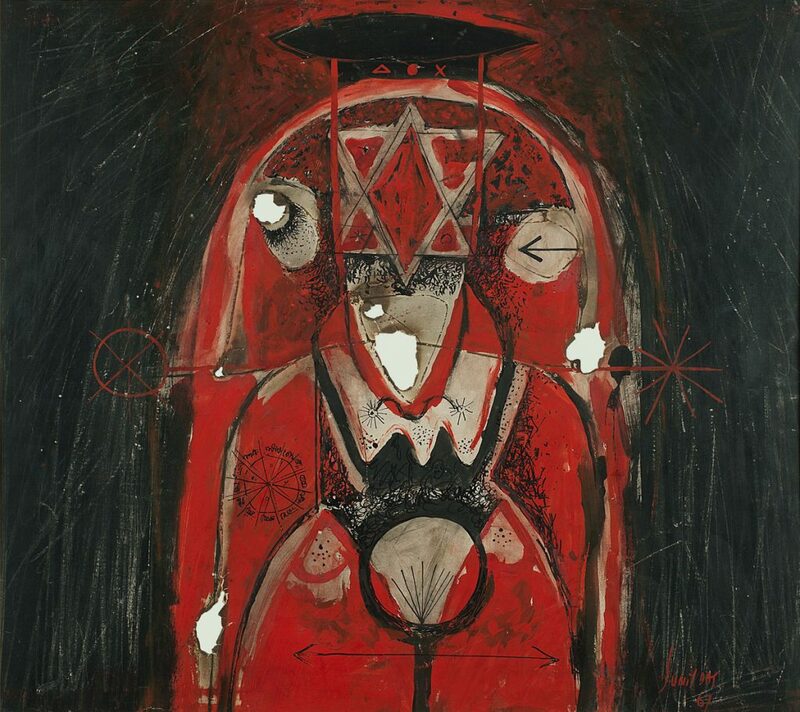 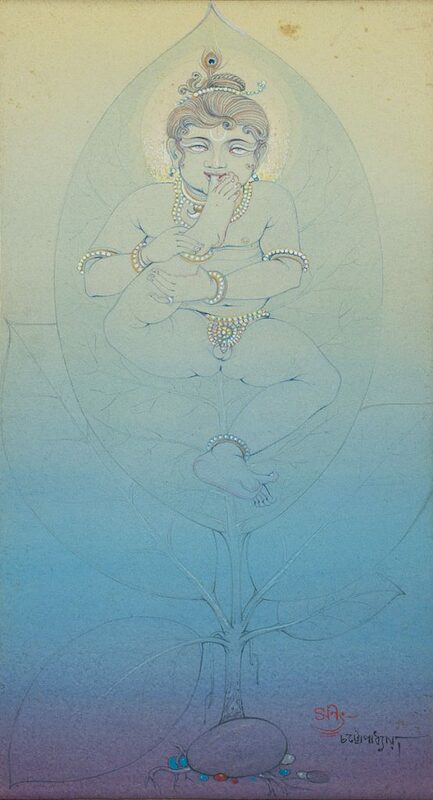 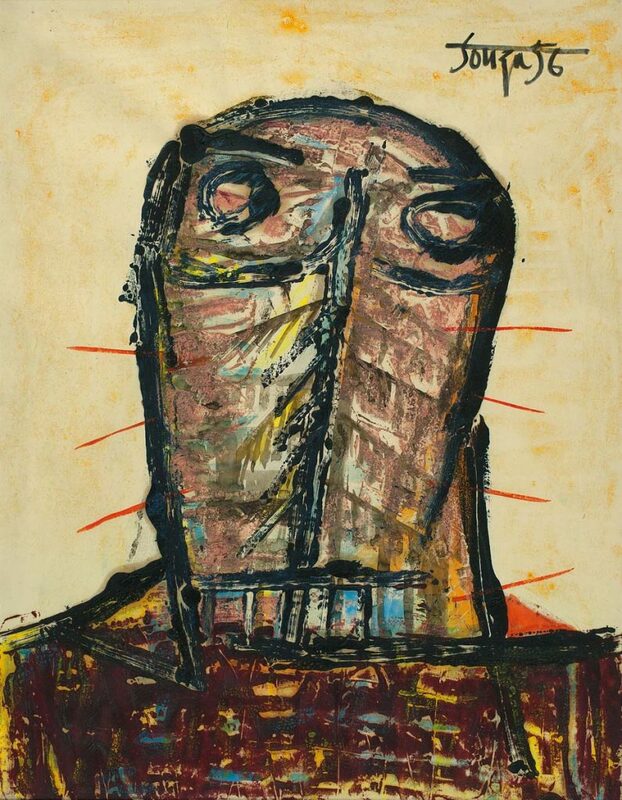 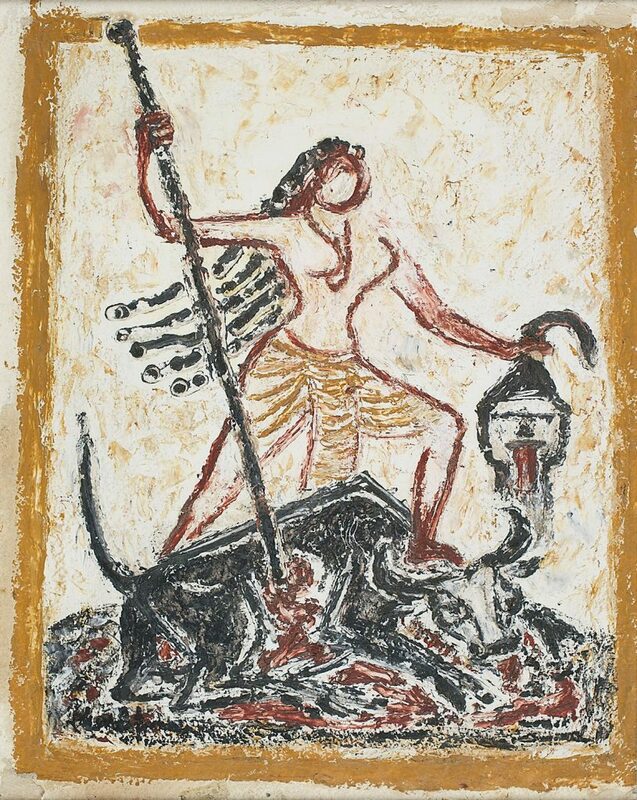 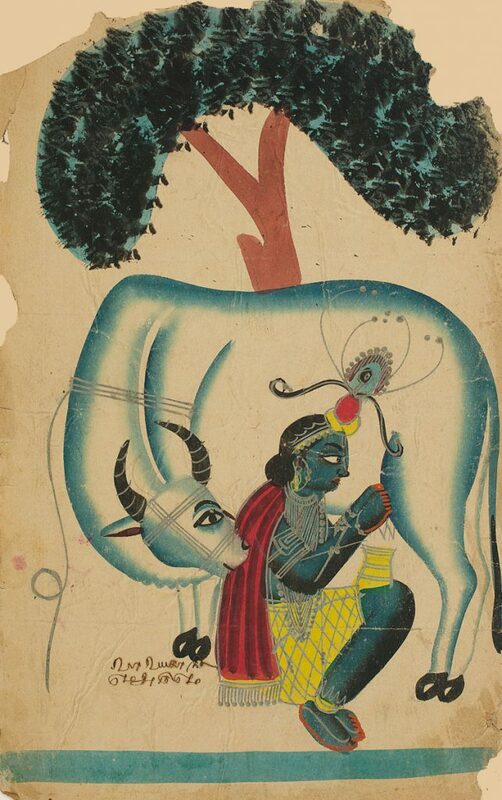 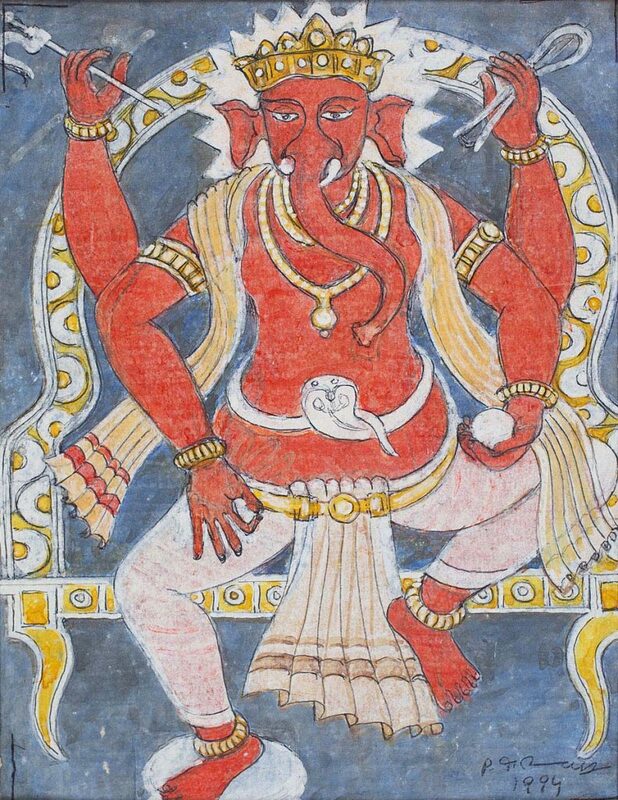 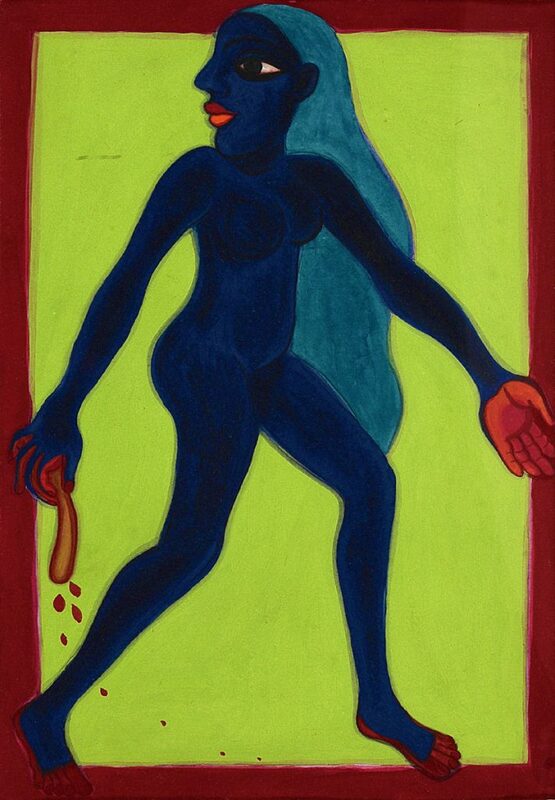 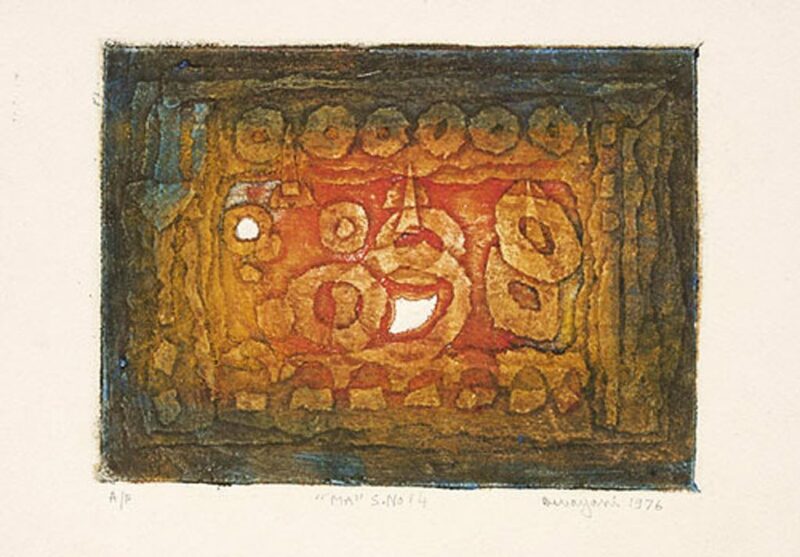 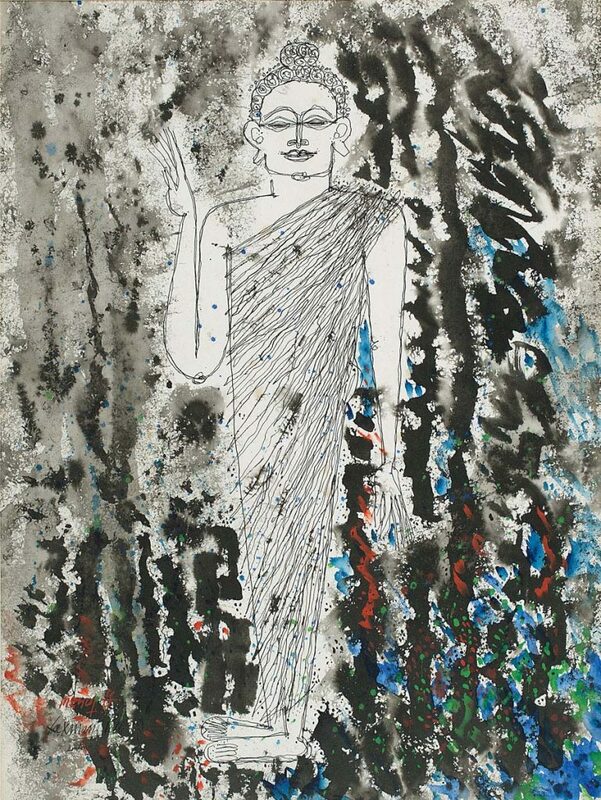 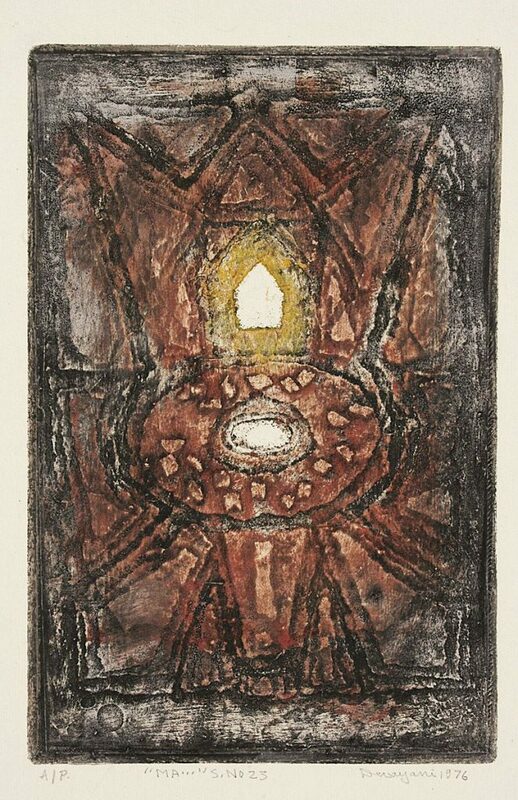 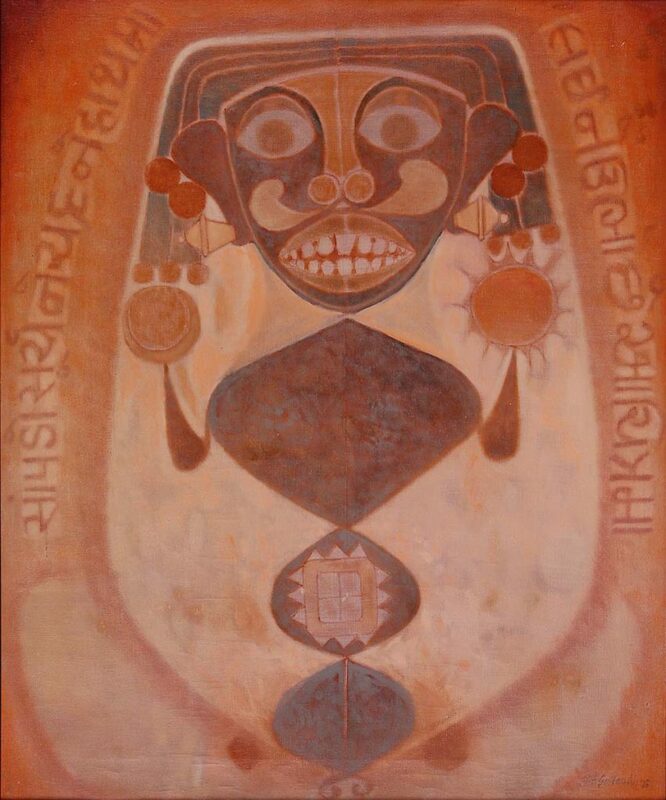 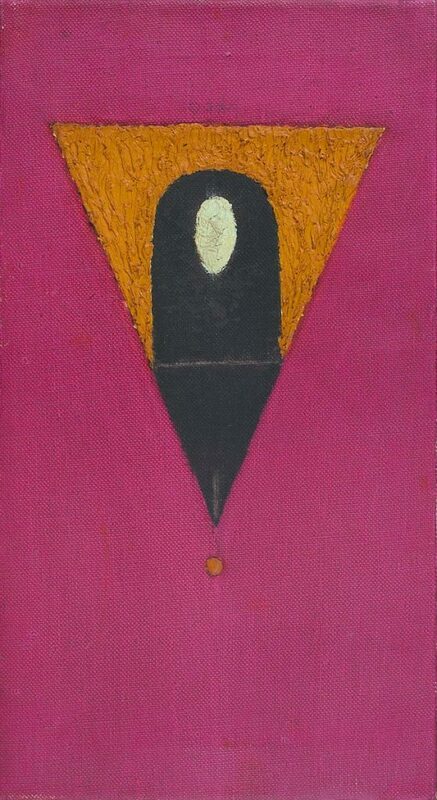 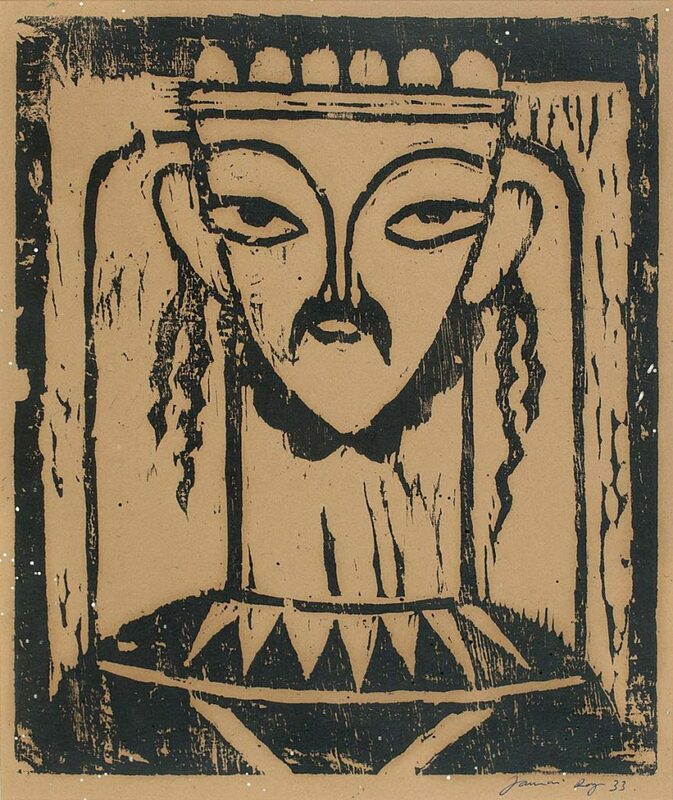 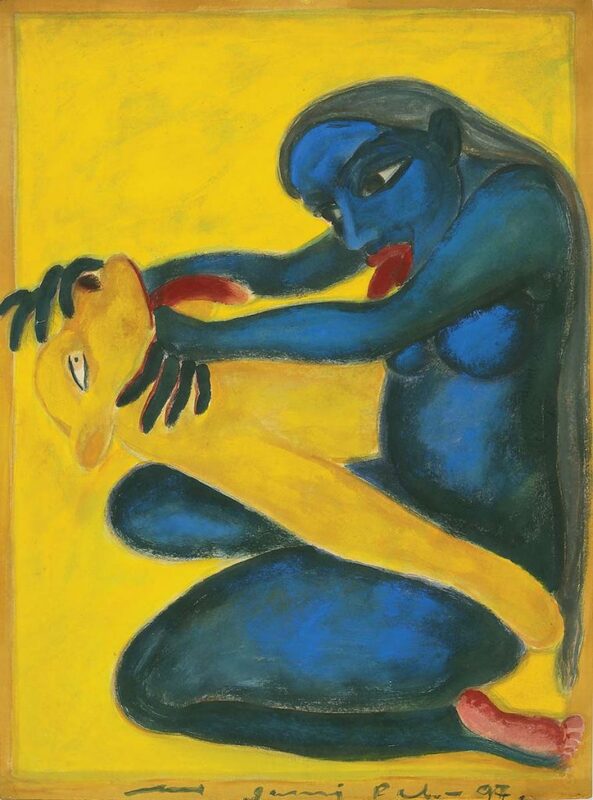 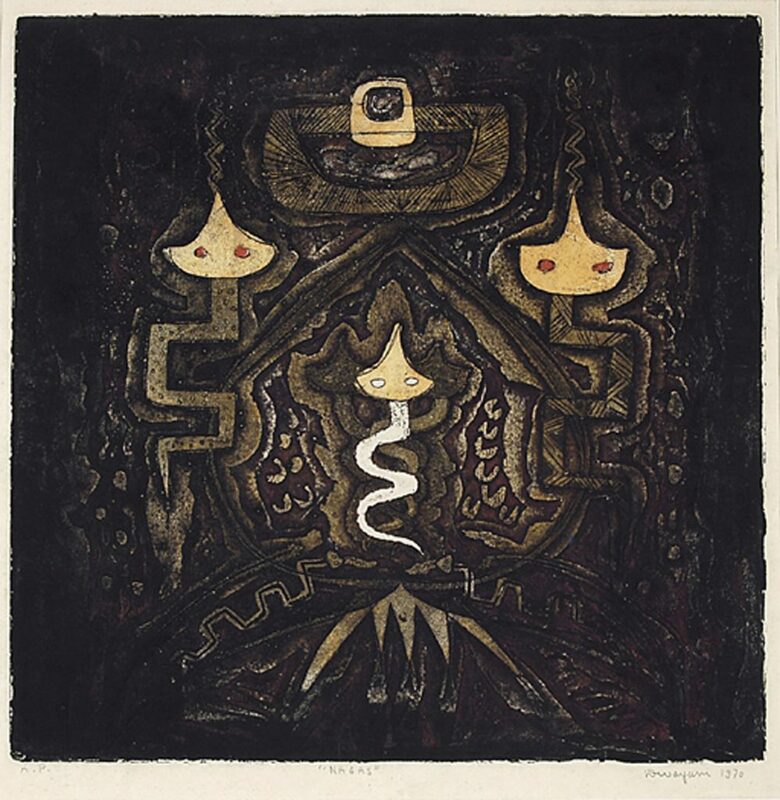 While the draw of the icon is strong, many Indian artists also responded to the theme in languages of minimalism and abstraction, producing sublime works to meditate upon, including a number of tantra works – by artists such as G. R. Santosh, Sohan Qadri, P. T. Reddy, Sunil Das and many others.